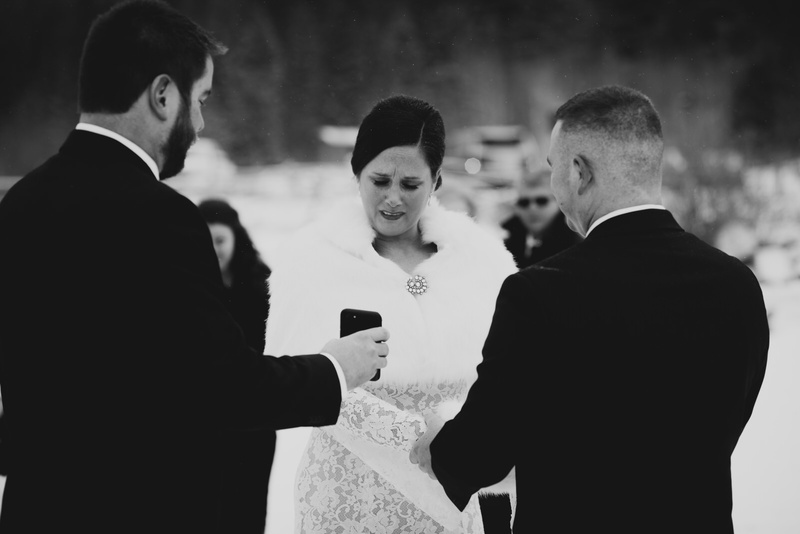 What lead you to have a wedding the way you did? 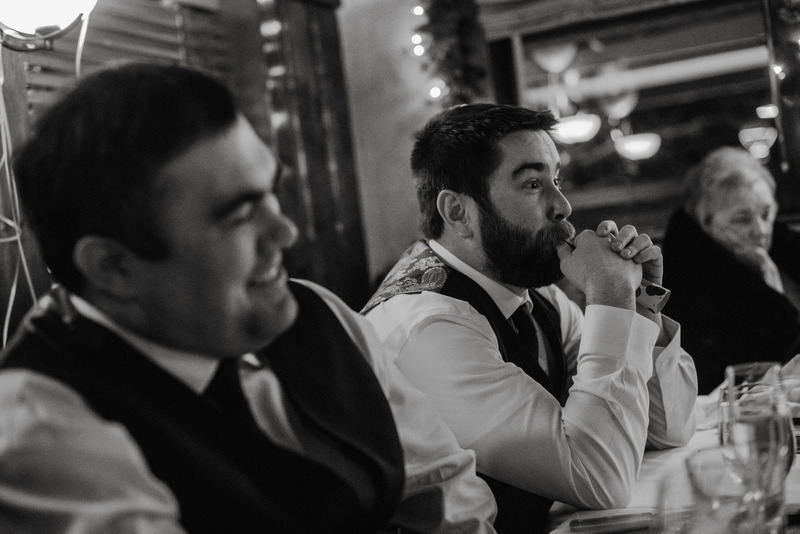 Family, friends, location etc.? 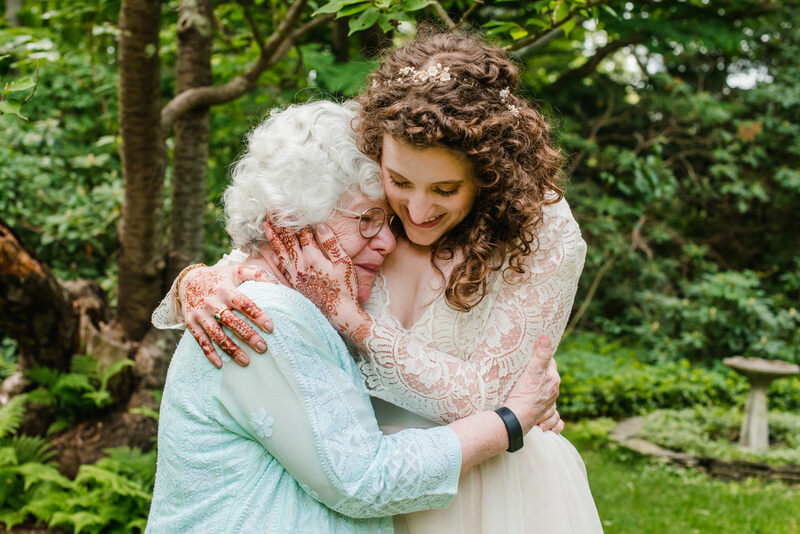 We wanted this day, and every day, to be about living things, about being alive and present to the world around us and to those we love. 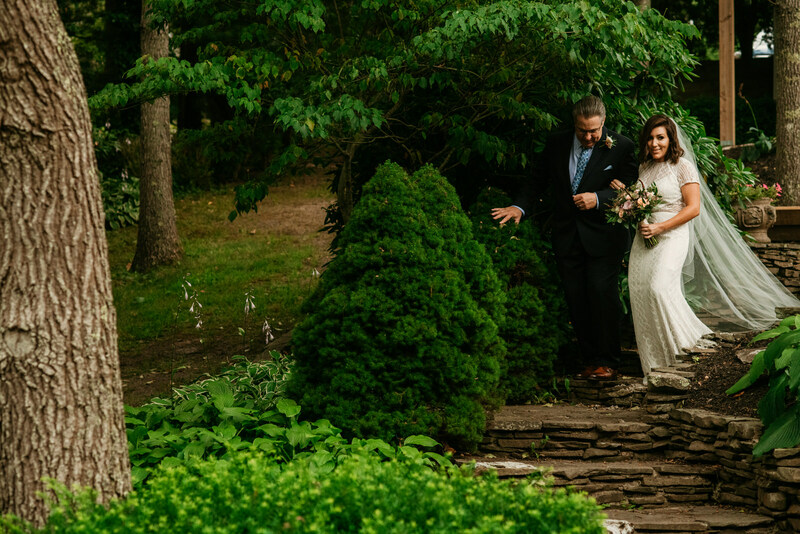 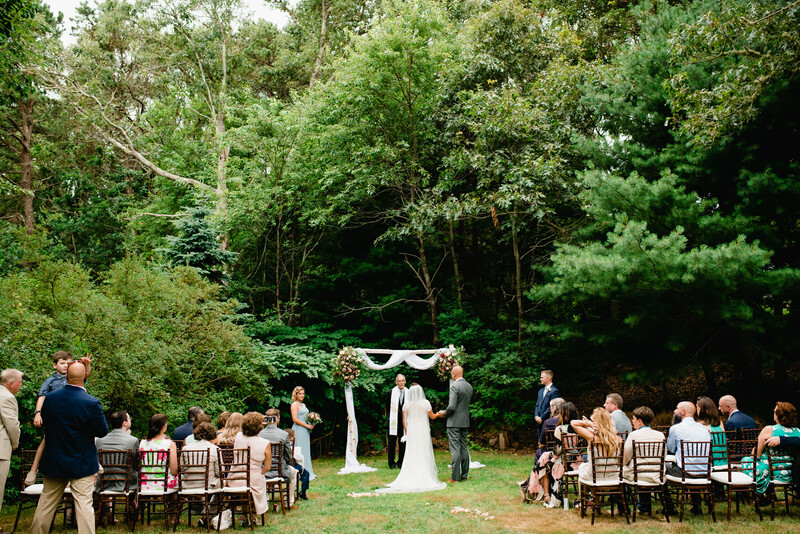 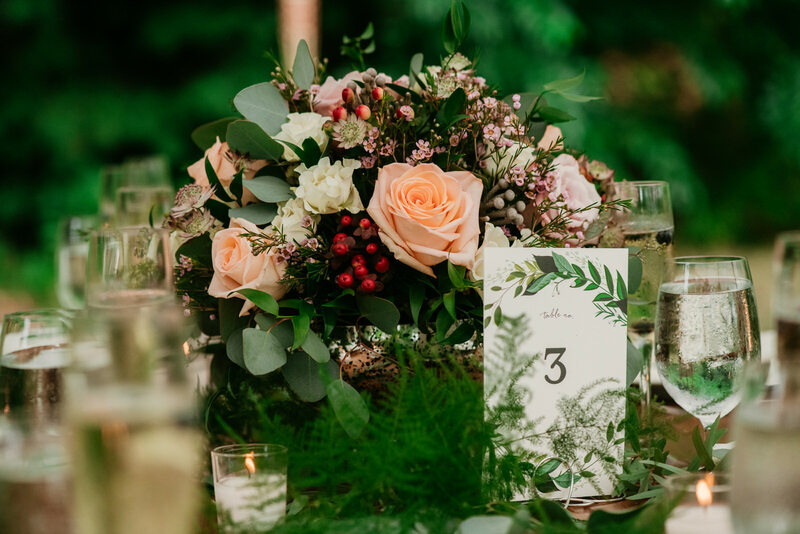 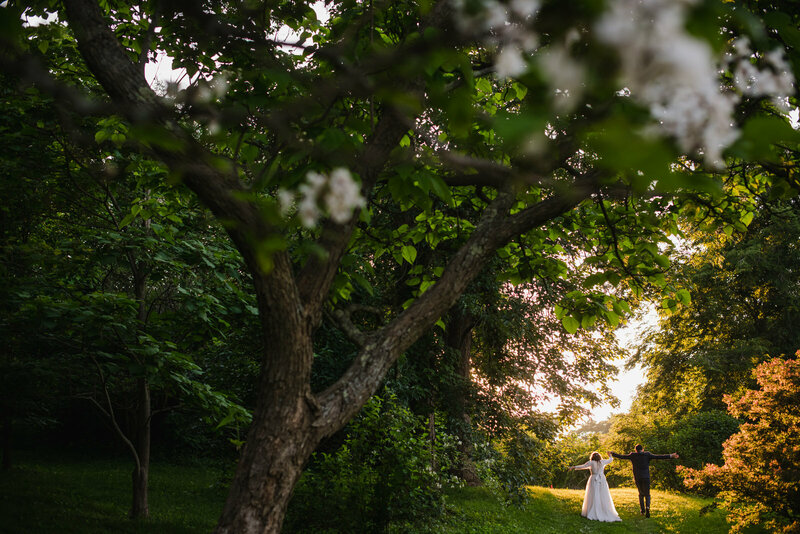 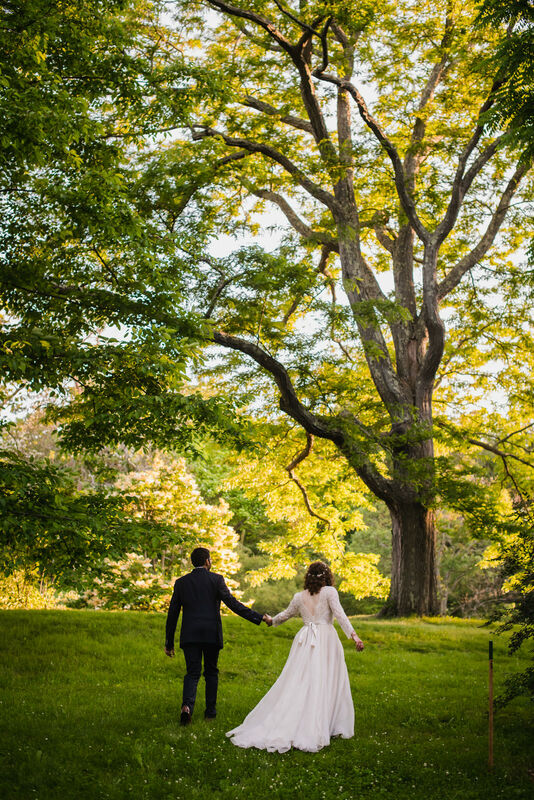 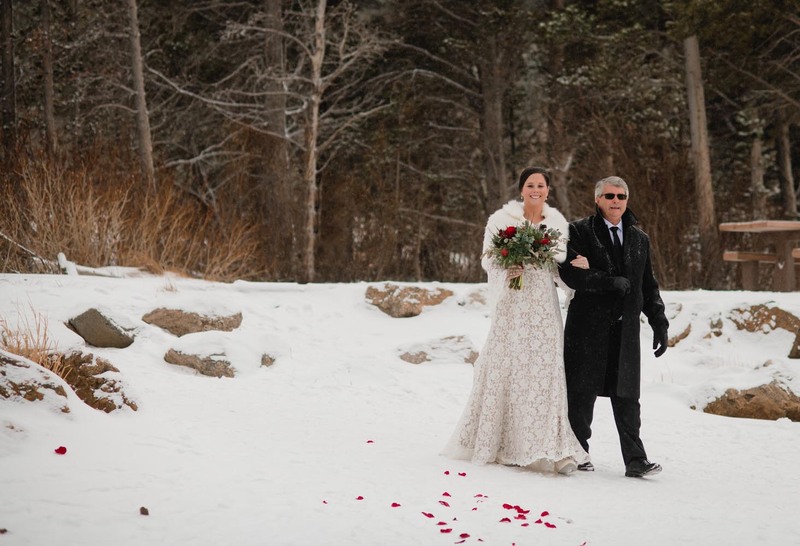 We chose to keep our wedding intimate and spend the day in a natural outdoor space as a celebration of family and all that we are grateful for. 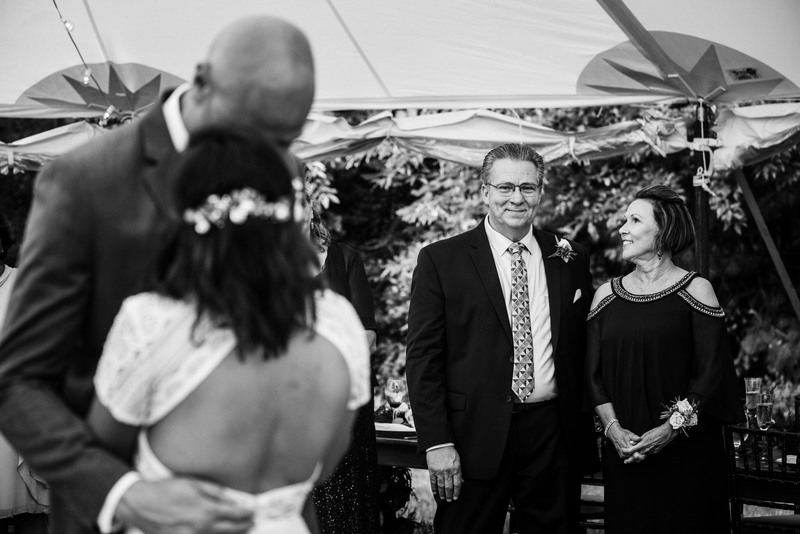 This is such a special time in our life and we wanted to share it with our loved ones without any distractions or extraneous obligations that could take away from the experience we wanted to have together. 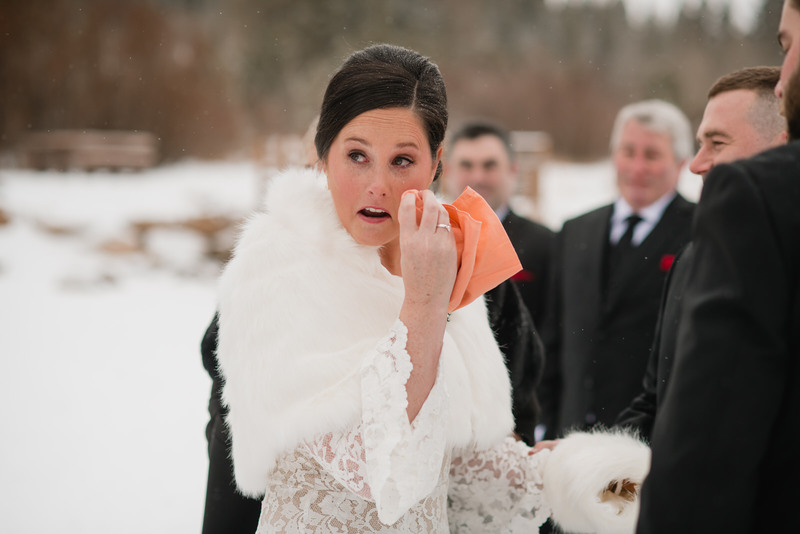 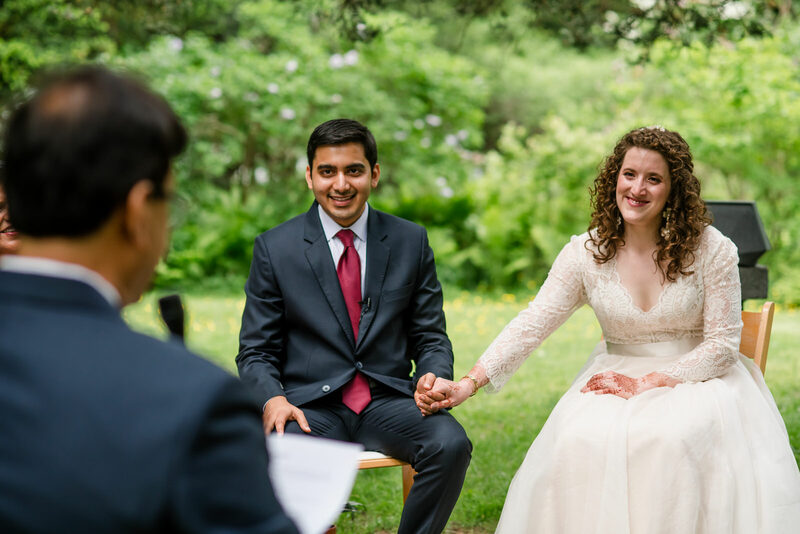 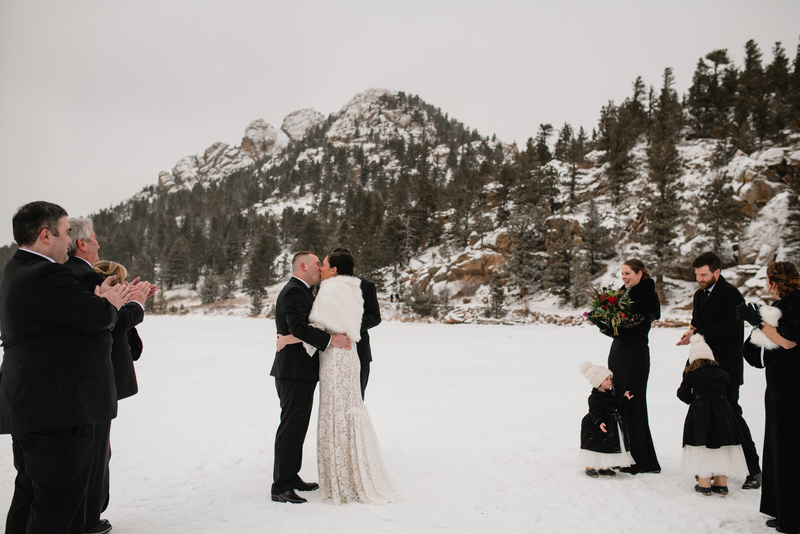 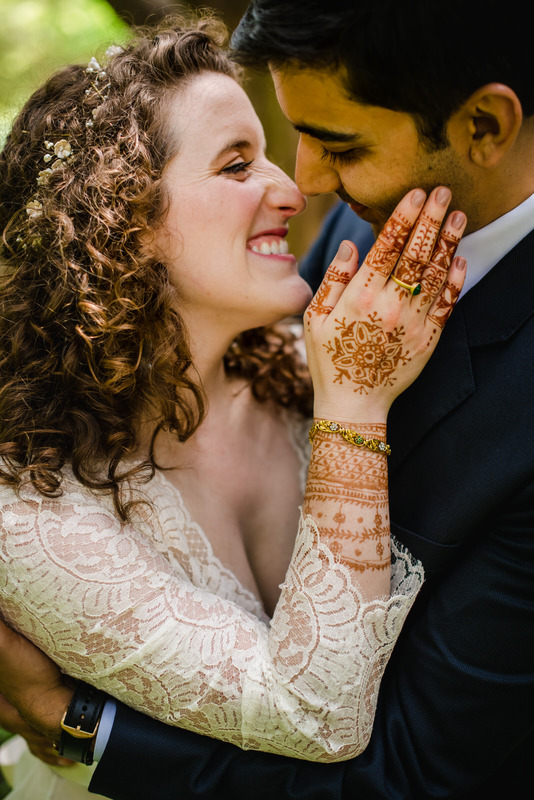 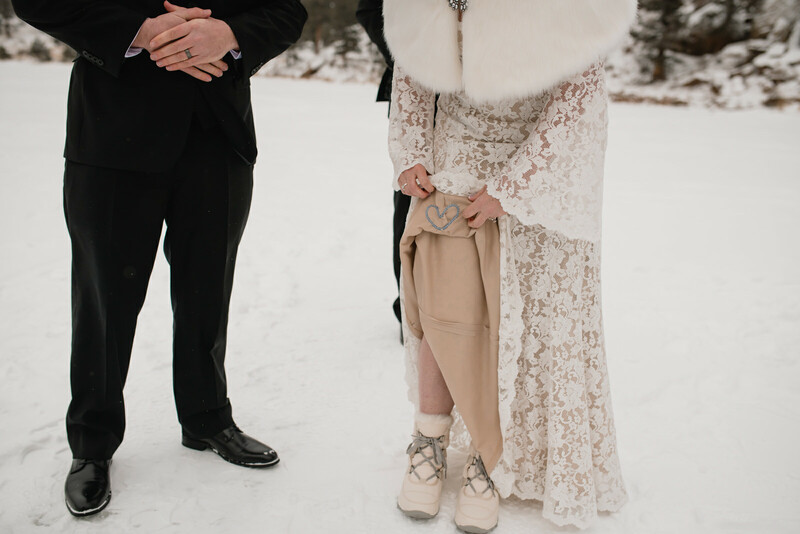 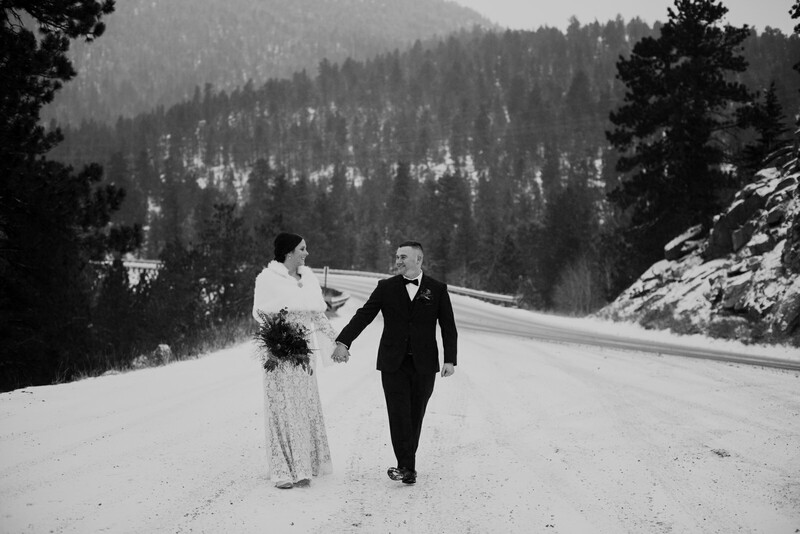 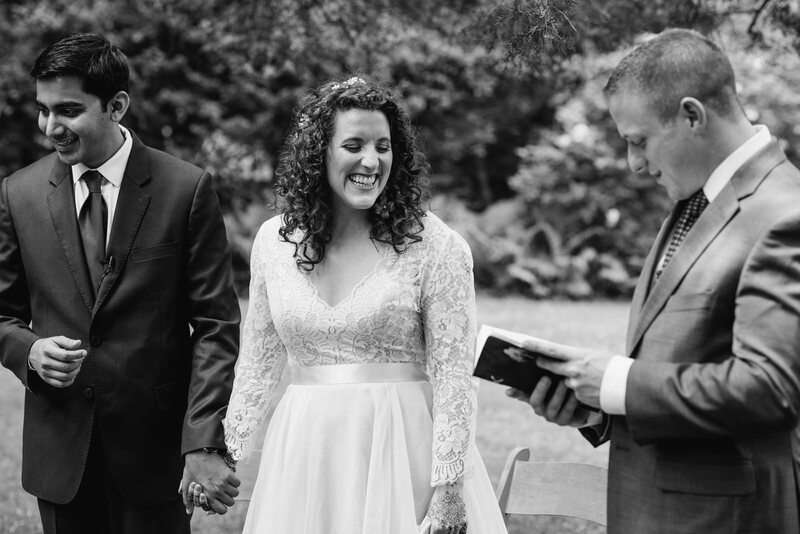 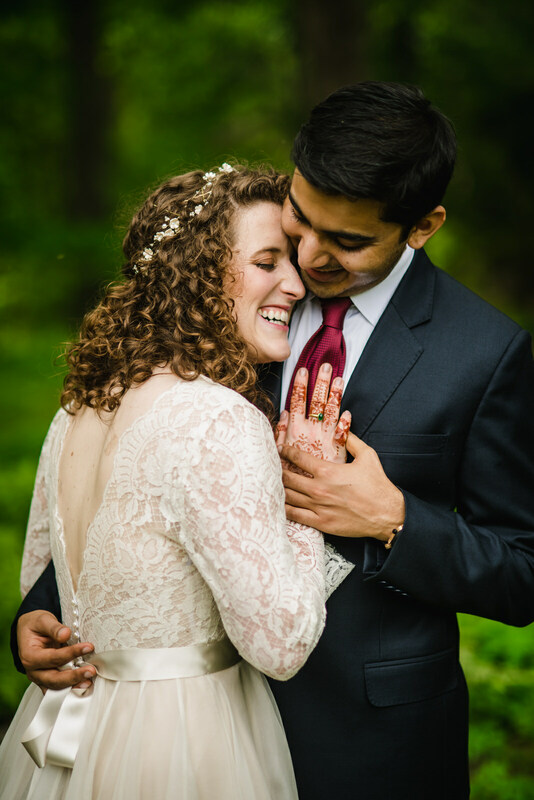 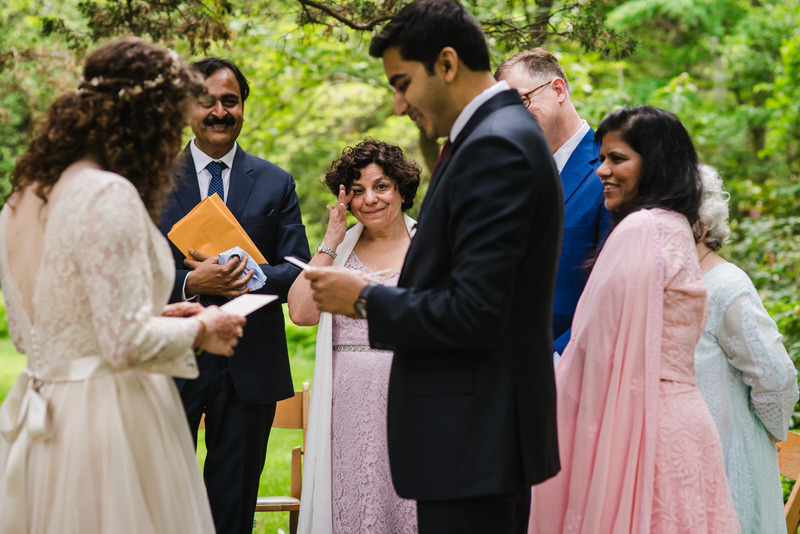 We wrote the ceremony together, incorporating different traditions that brought us joy. 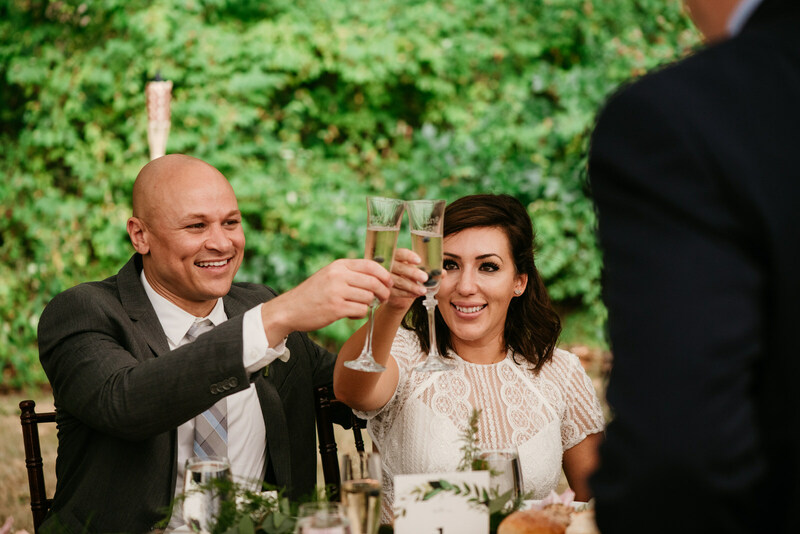 We made it so that every part of the day would be a celebration! 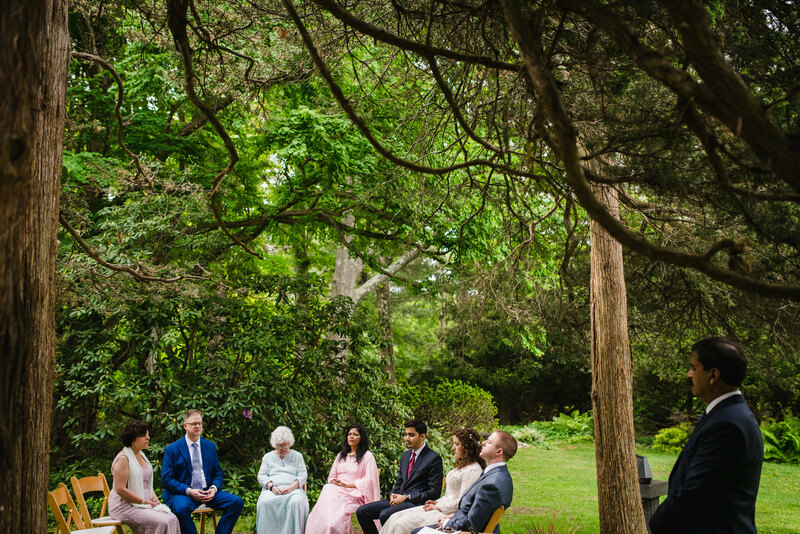 Prem’s father led us in a meditation, setting a tone of loving gratitude and peacefulness. 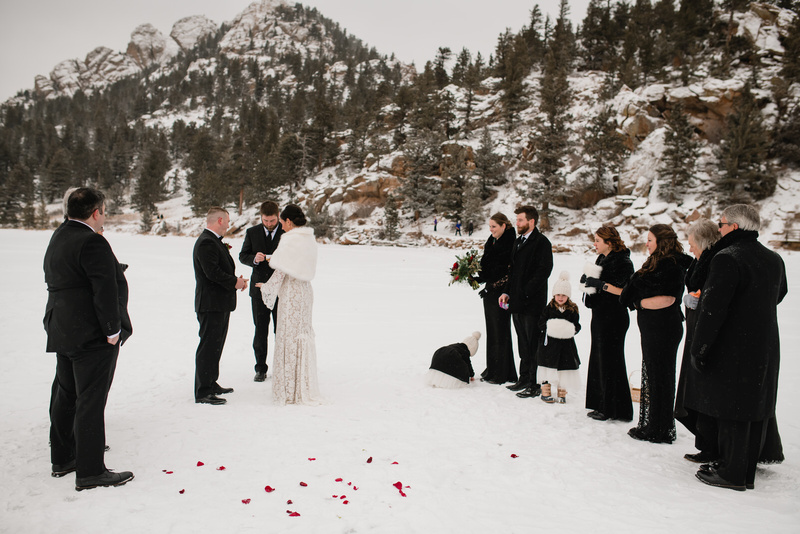 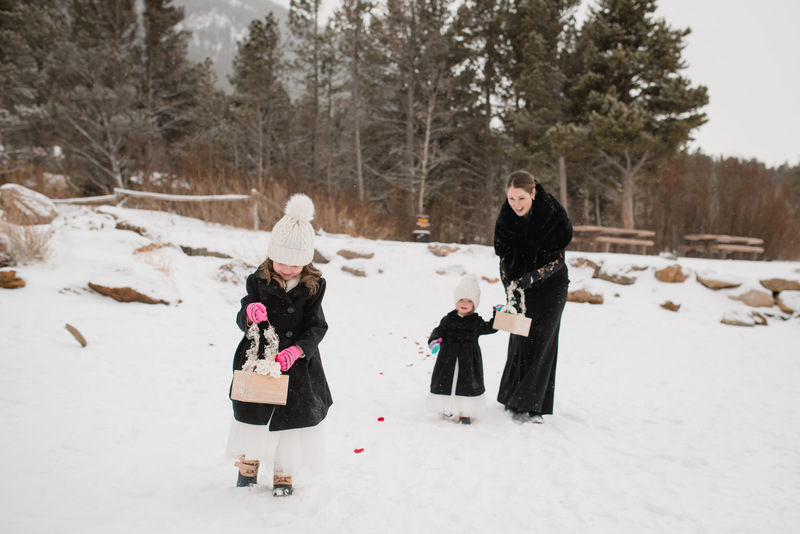 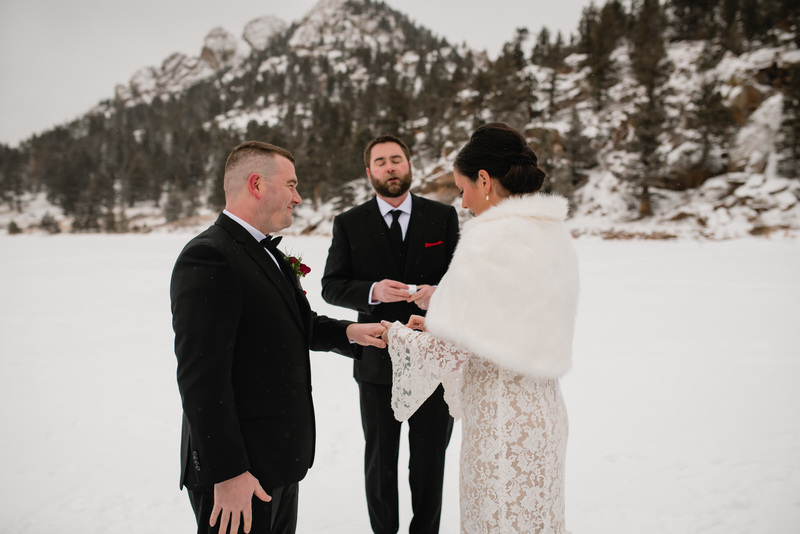 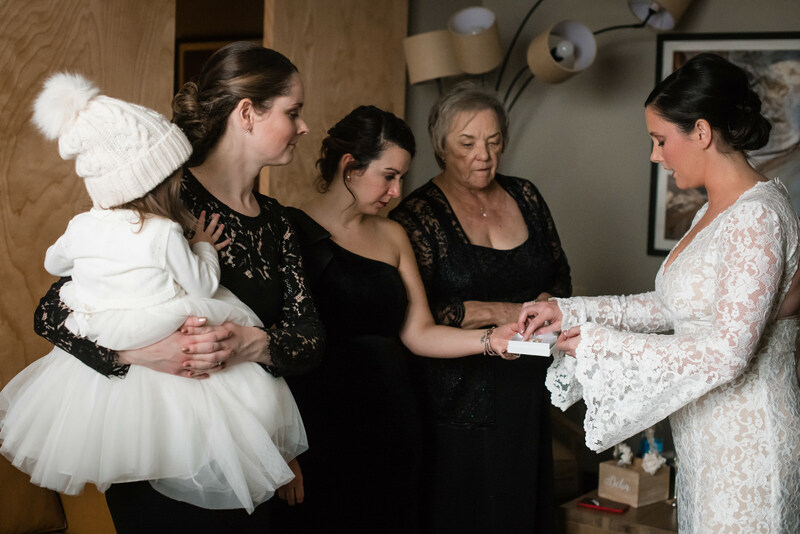 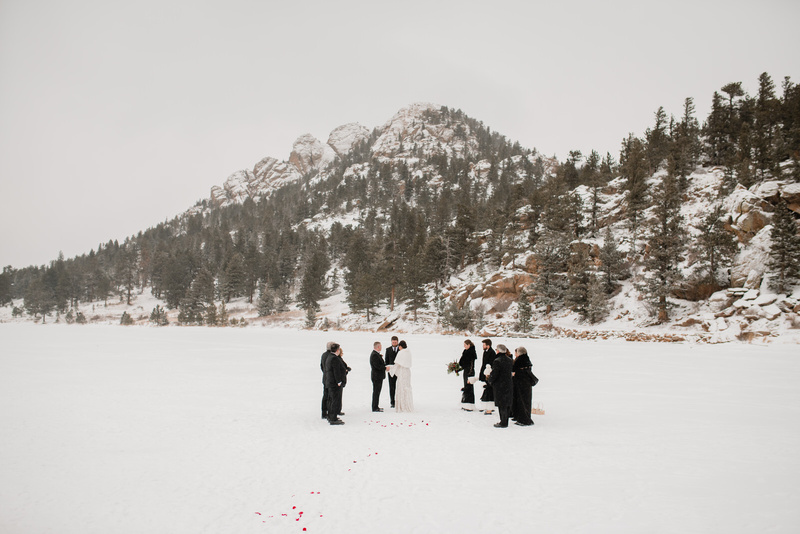 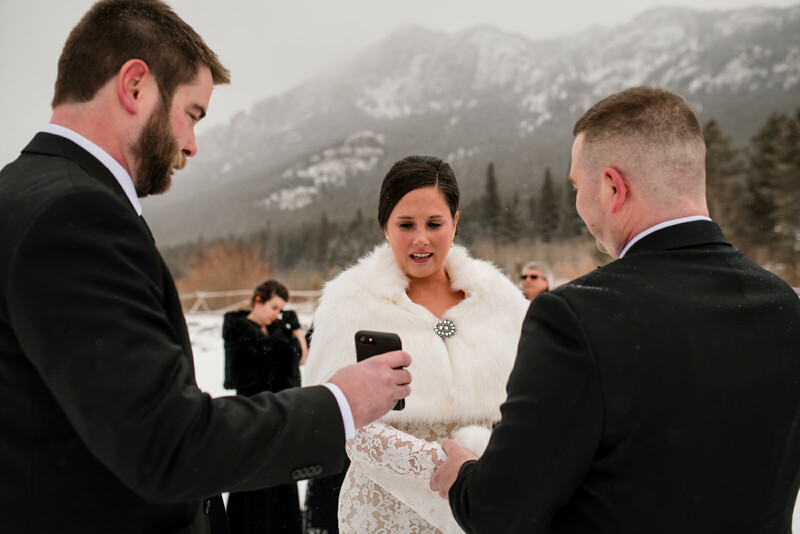 We asked each family member to share a passage, song, poem, or other form of expression that rang true to them as part of a ring warming ritual. 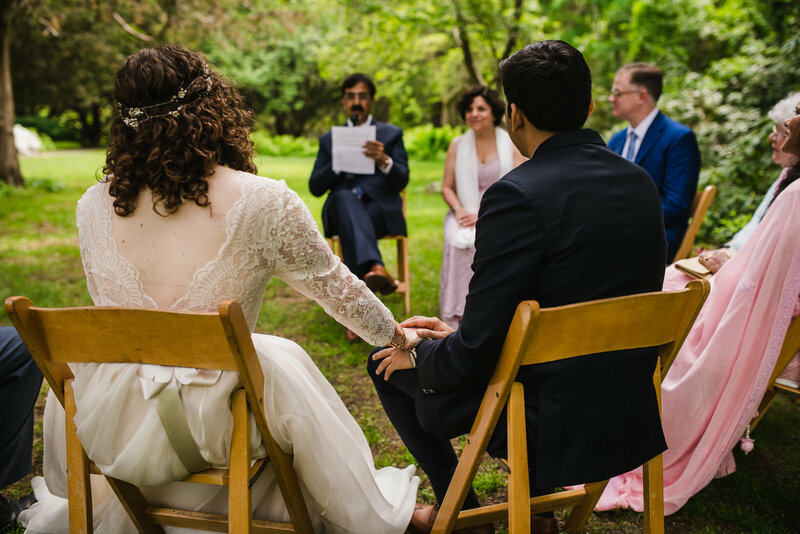 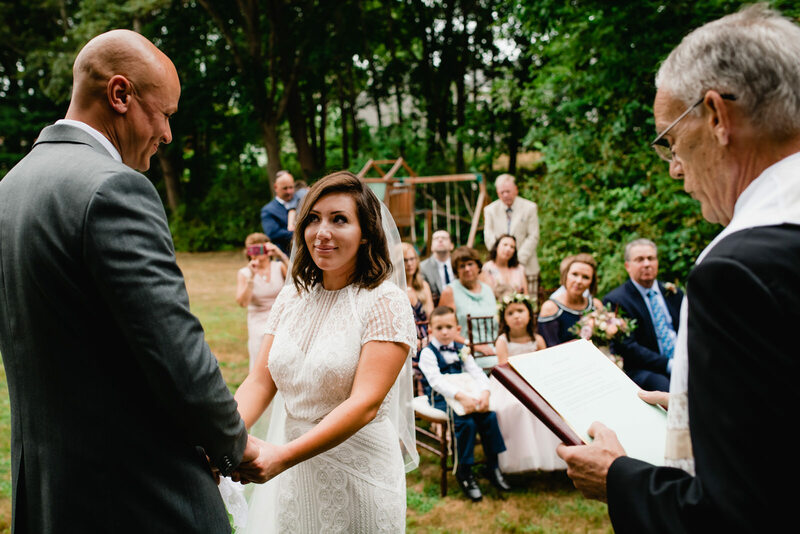 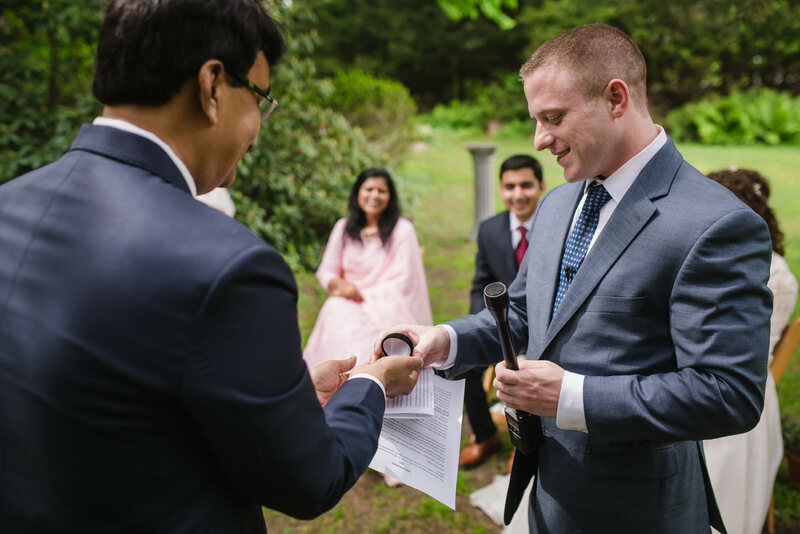 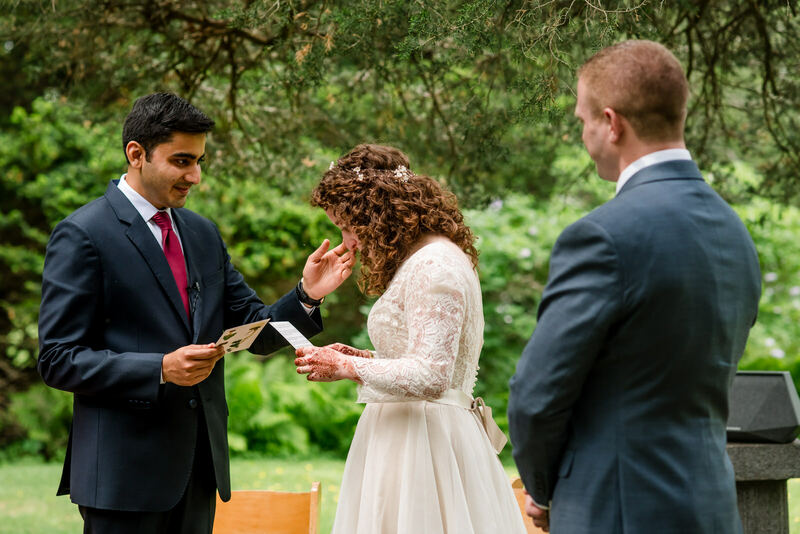 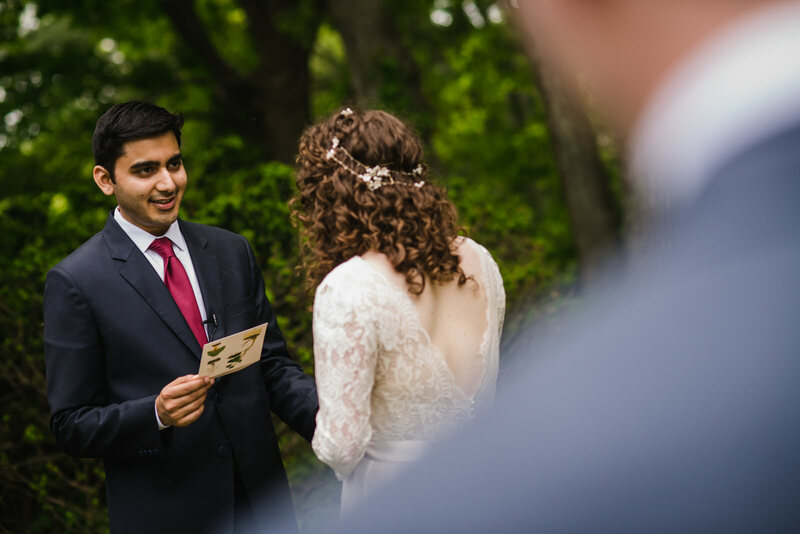 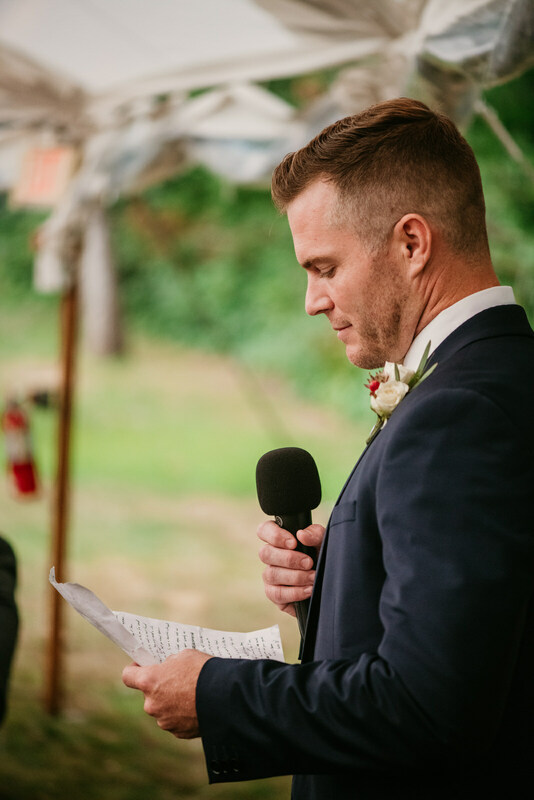 We read memories of our journey together as part of our “I do’s,” and recited vows that we wrote together from letters we had exchanged over the years. 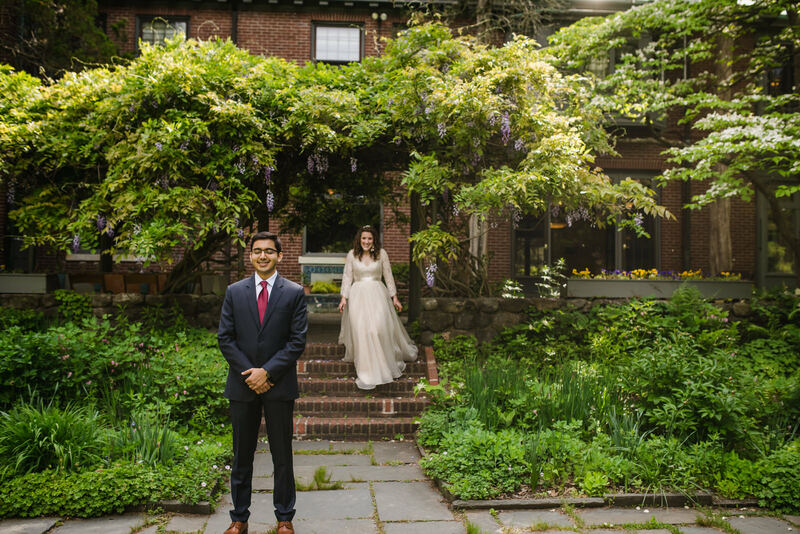 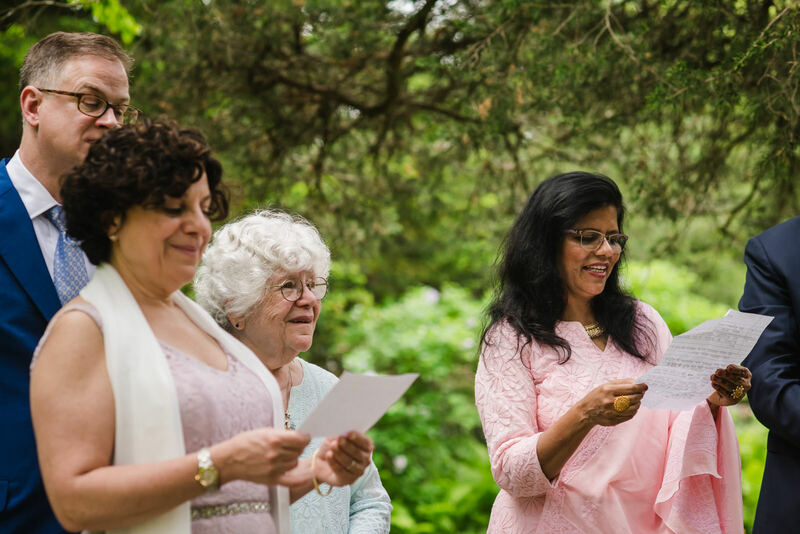 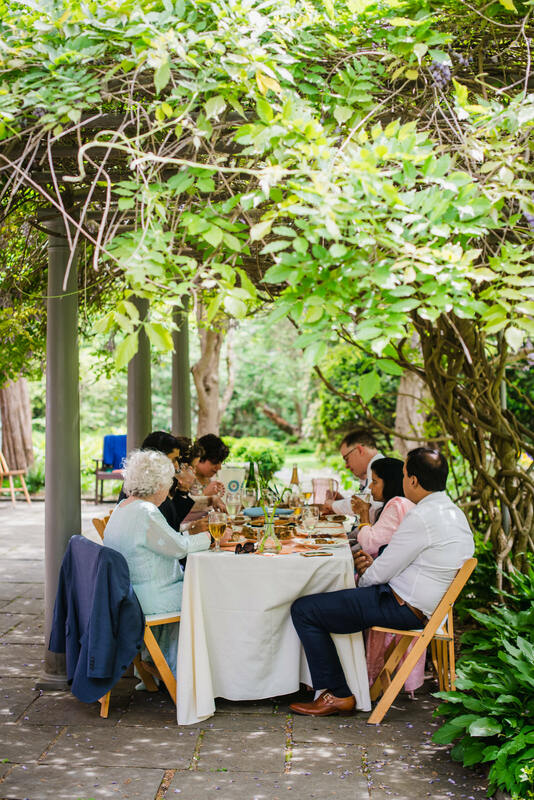 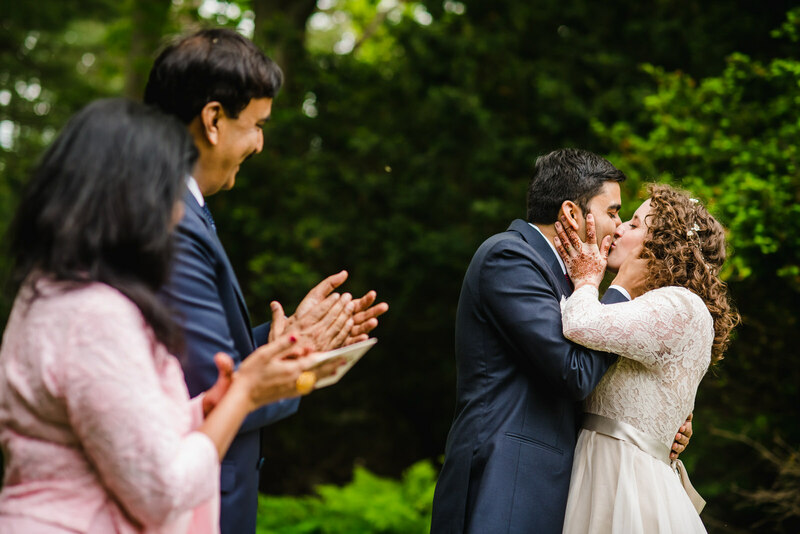 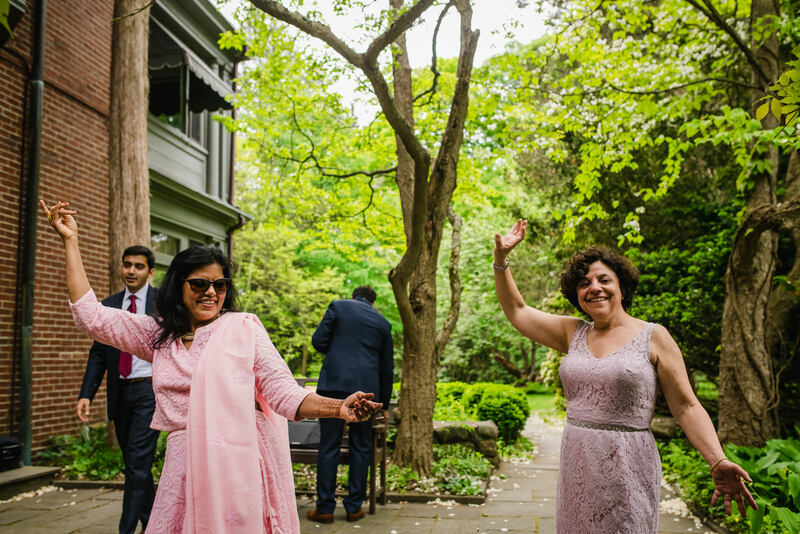 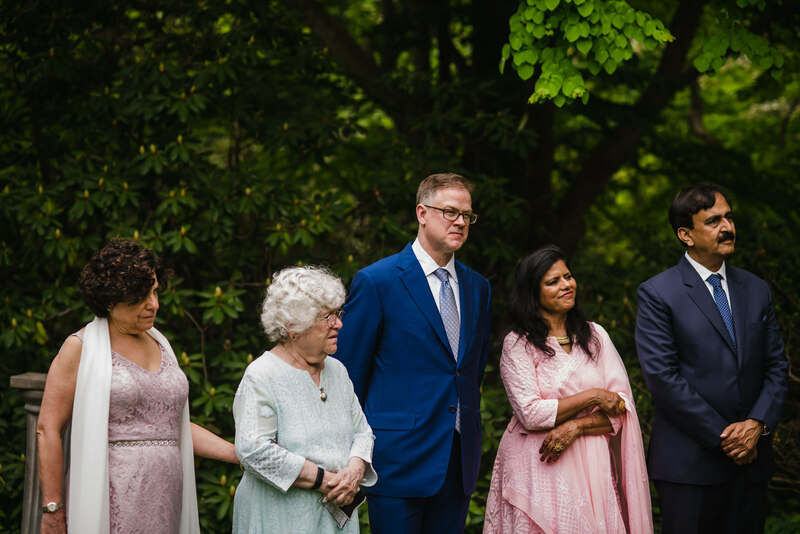 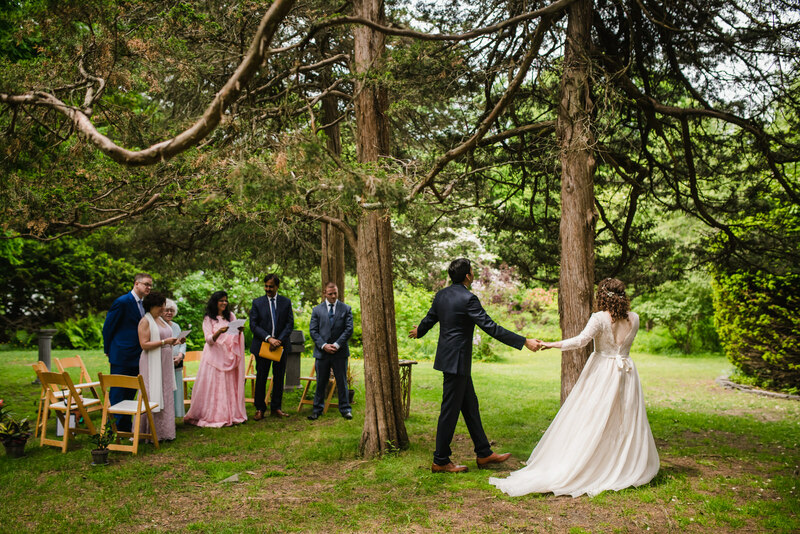 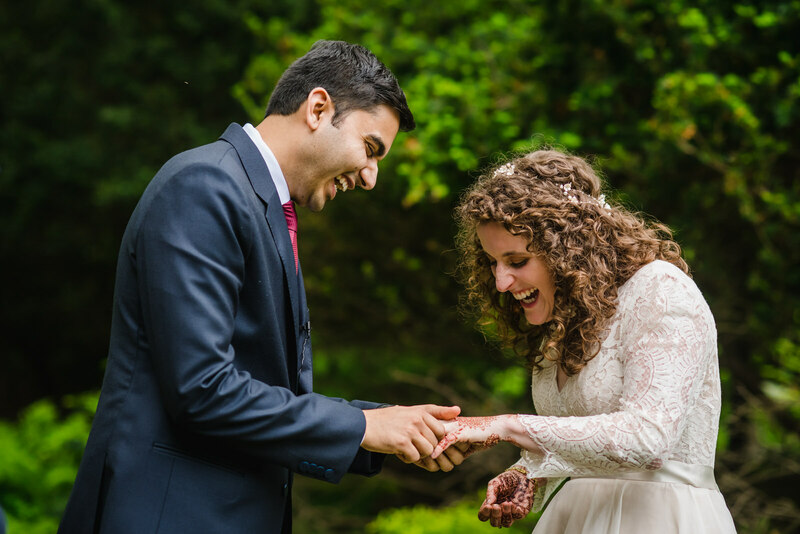 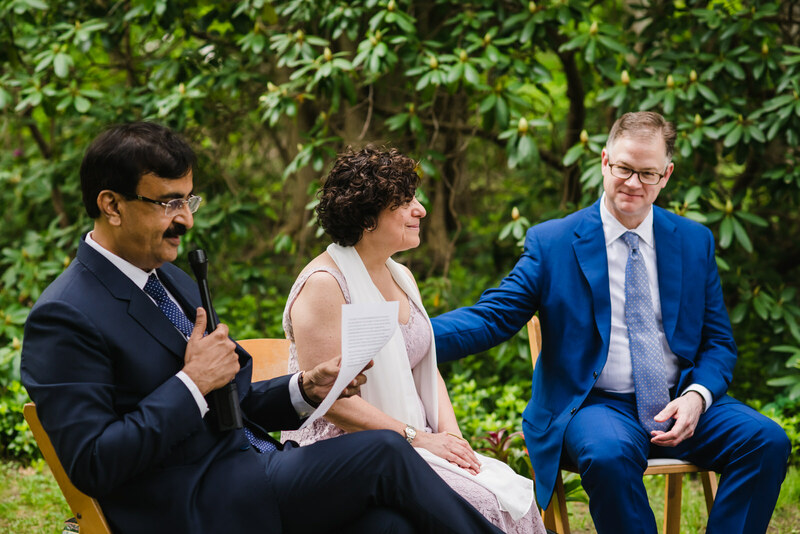 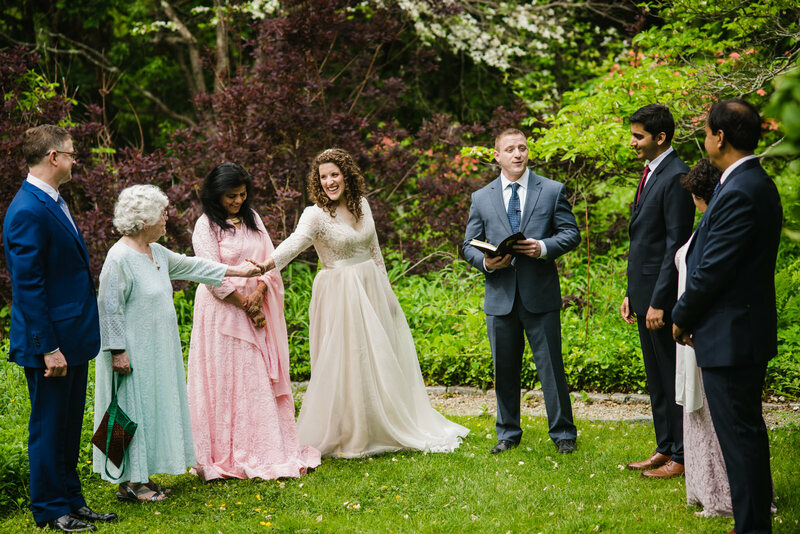 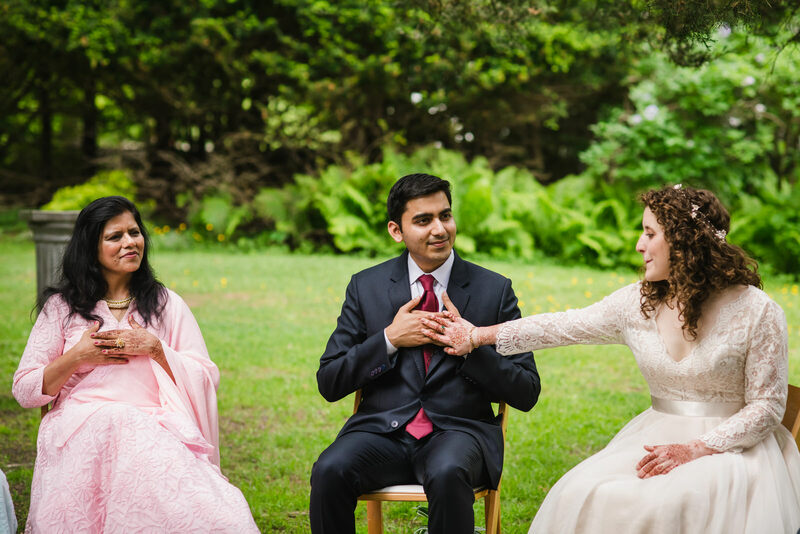 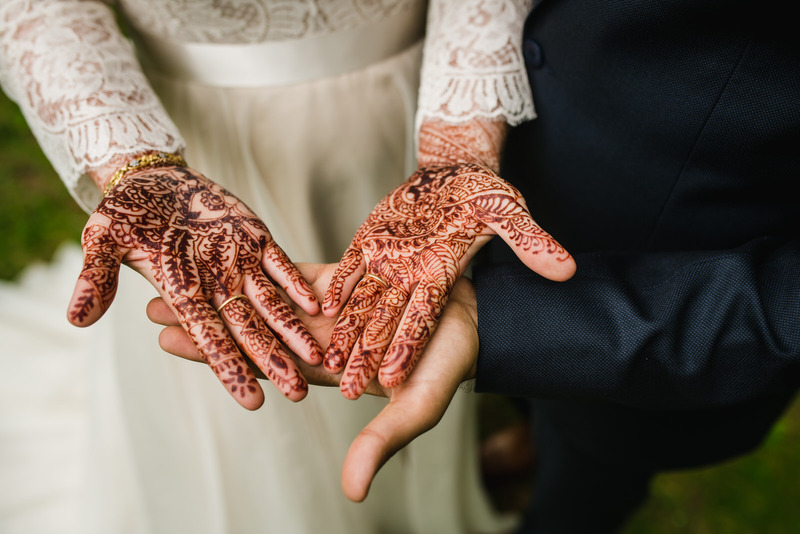 We asked our moms to recite the “saat phere,” or “seven steps to marriage” ritual in Hindi and English as we took rounds around two beautiful trees in the garden where we meditated together and shared good wishes. 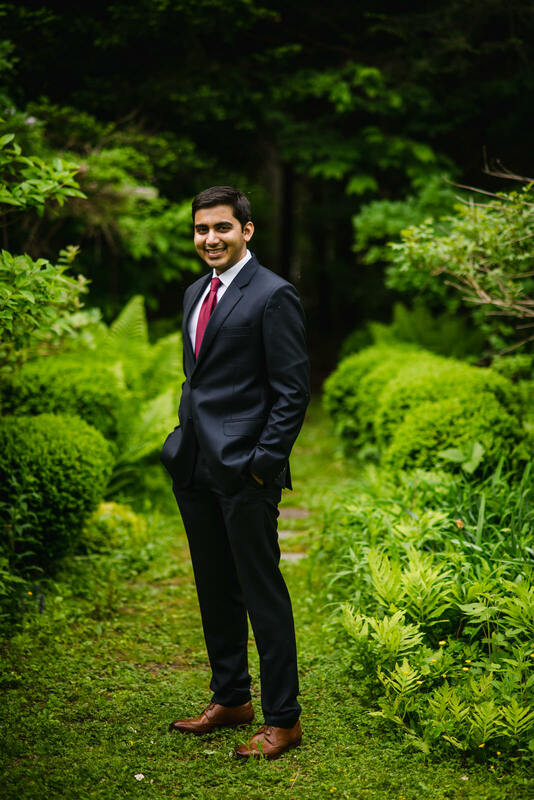 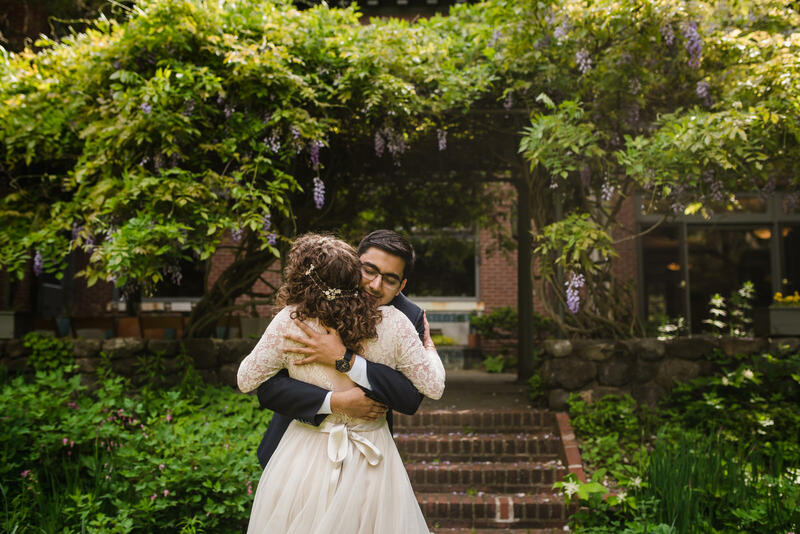 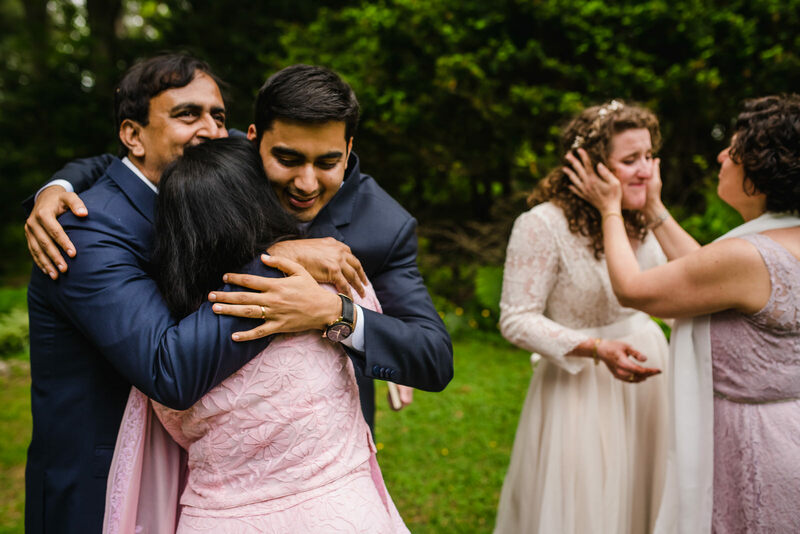 Vedika’s brother officiated the ceremony, and we knew endless hugs and dancing would inevitably follow the pronouncement. 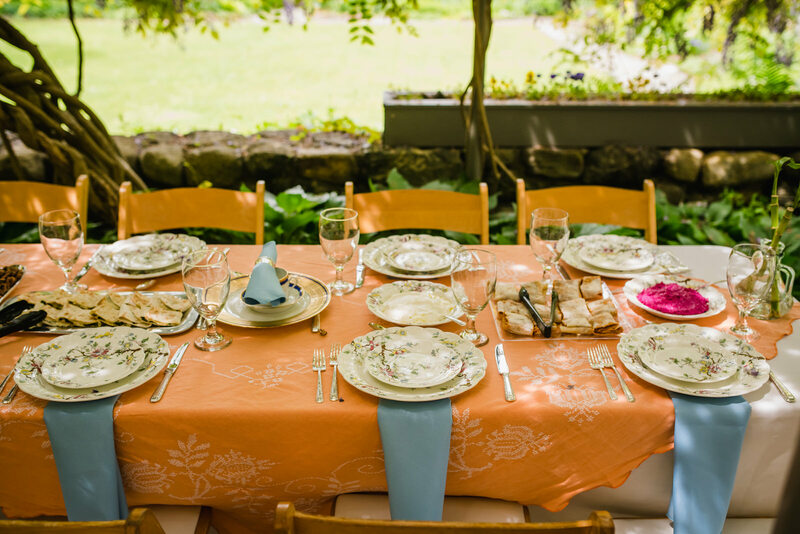 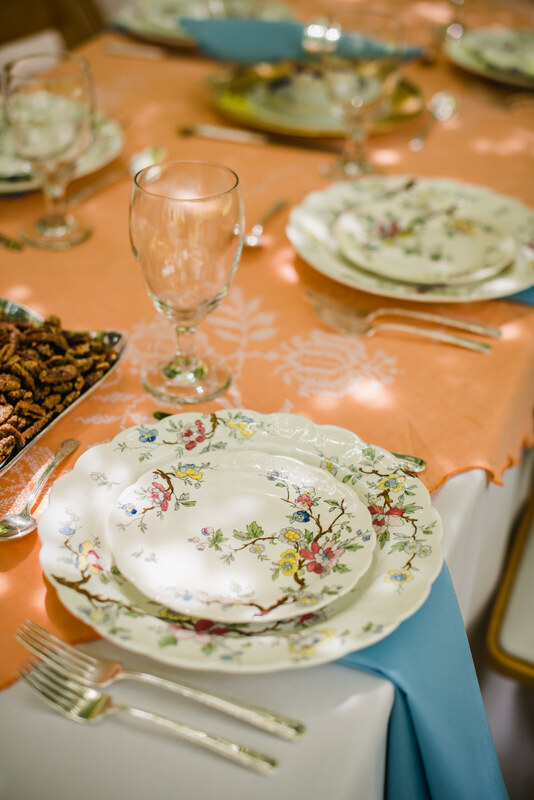 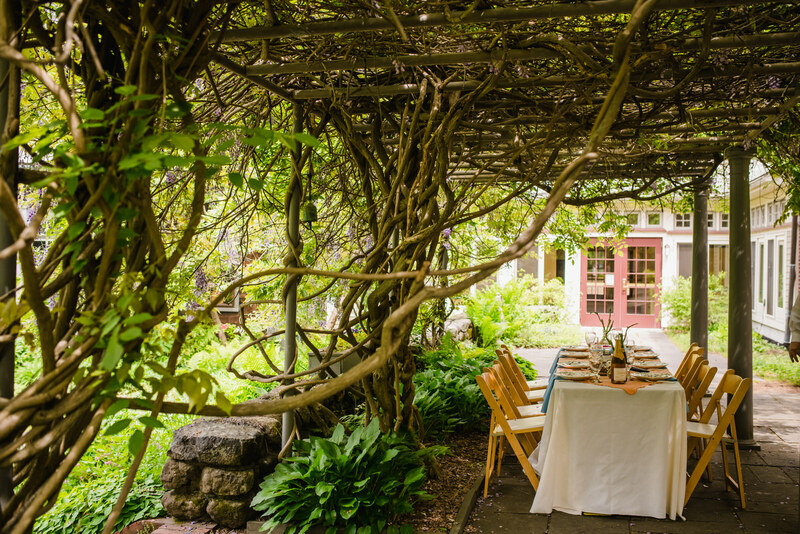 We ordered lunch from one of our favorite restaurants and our table was pieced together with family heirlooms under a lilac trellis. 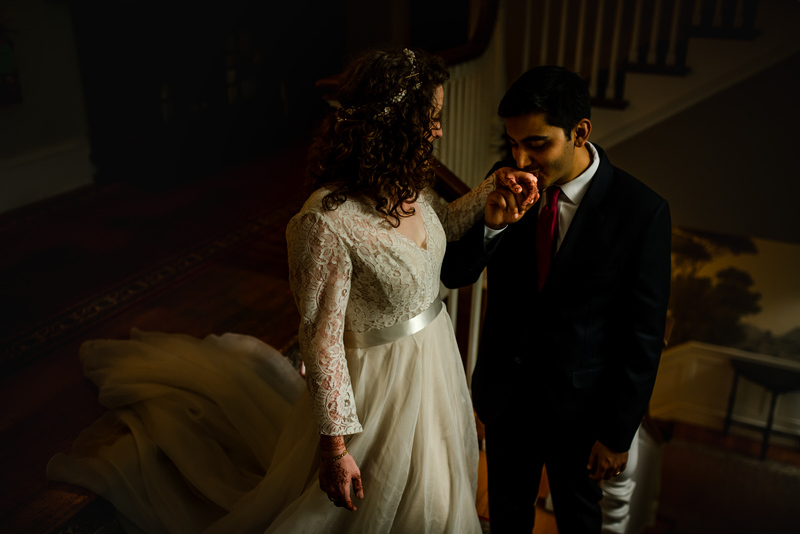 The day was like a dream, and it has been a dream ever since! 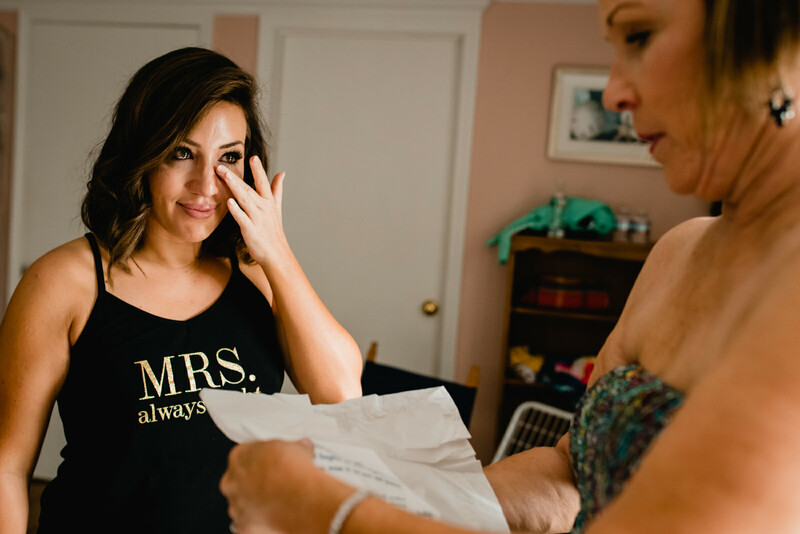 What were you most excited about before the wedding? 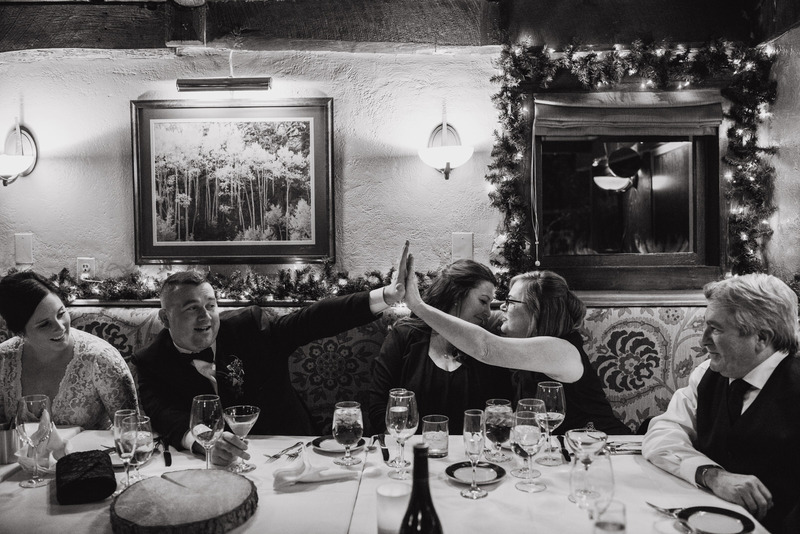 We were of course most excited to get married to each other! 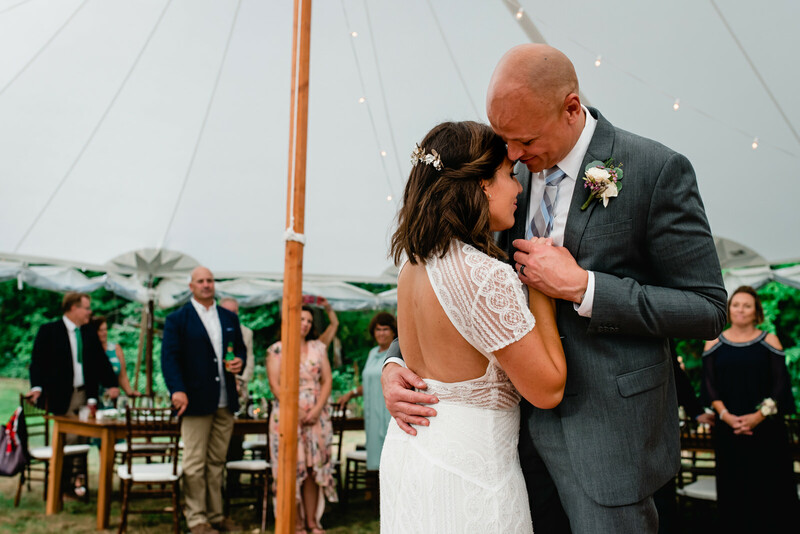 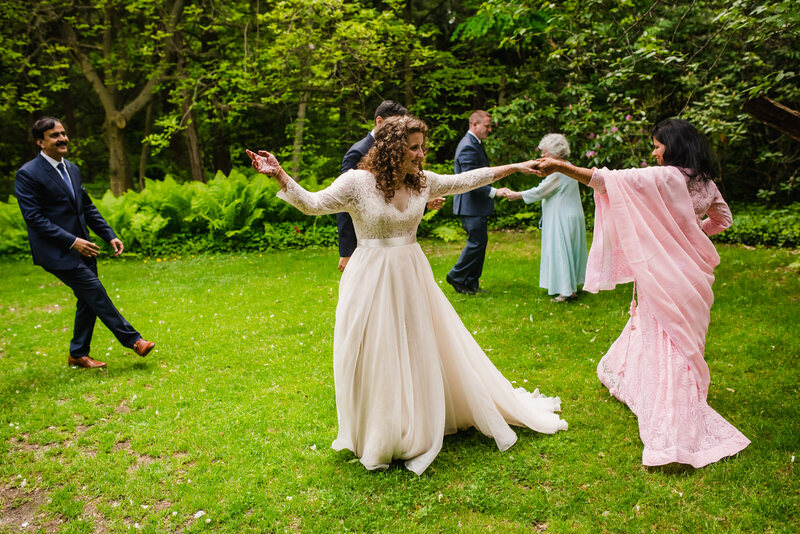 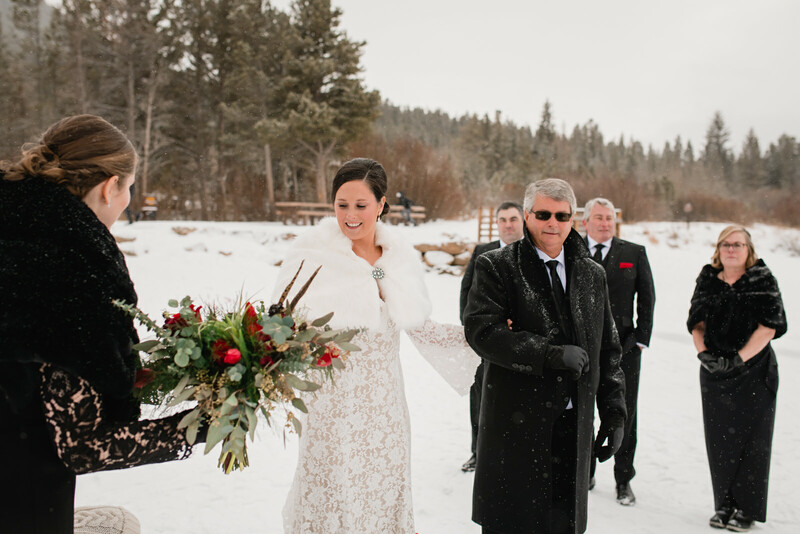 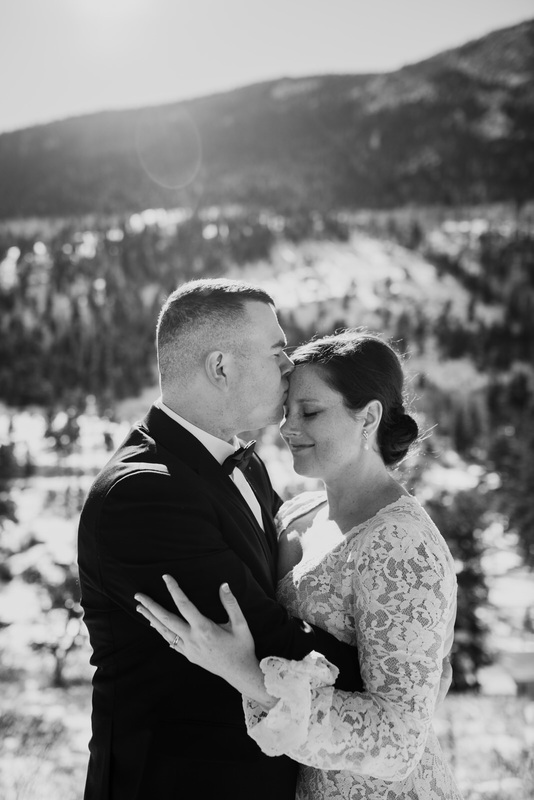 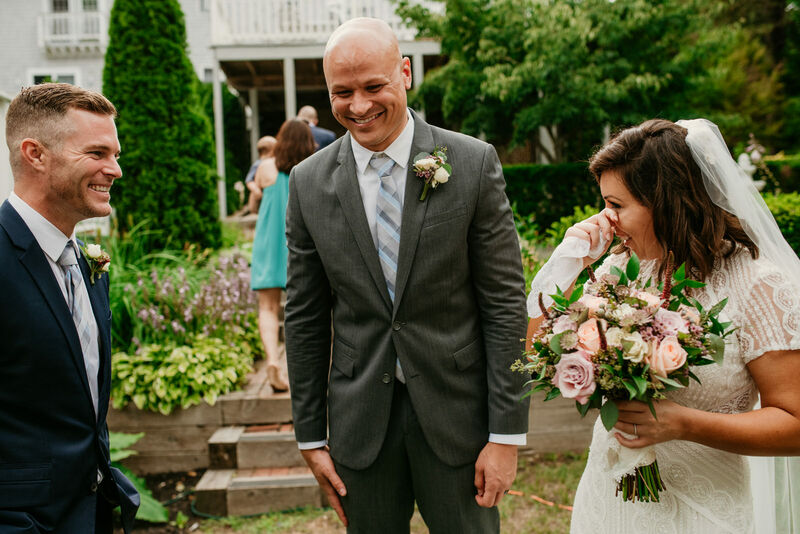 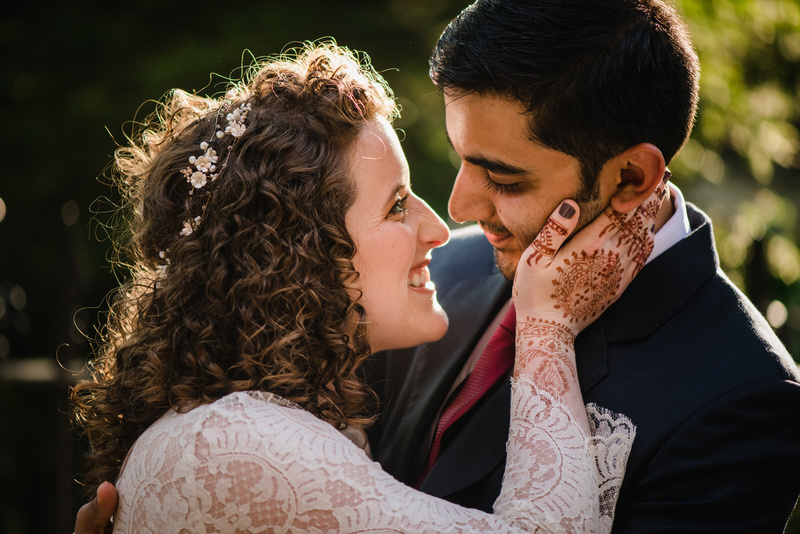 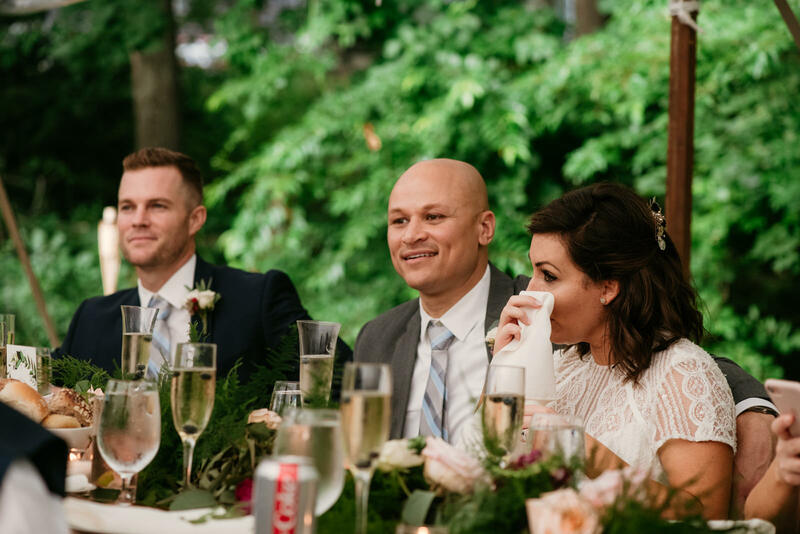 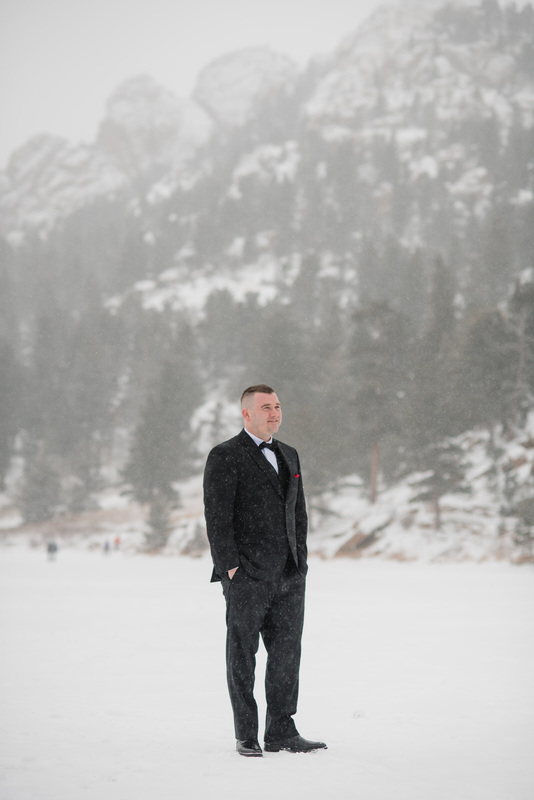 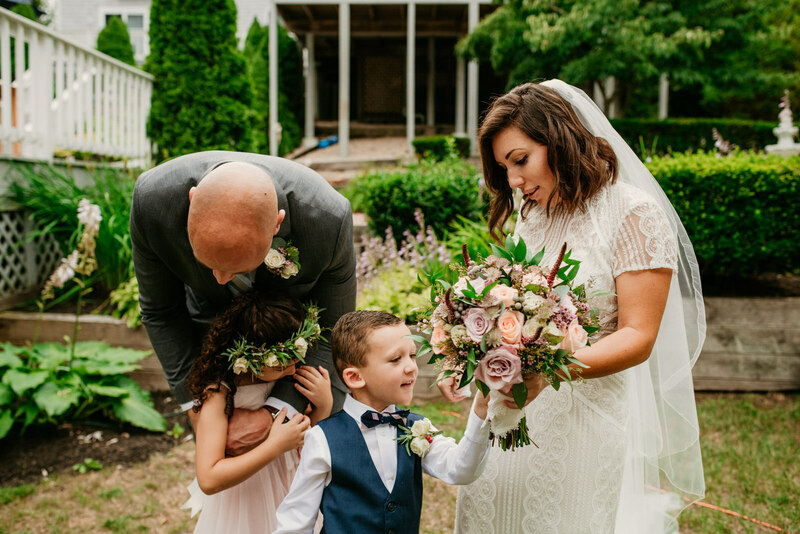 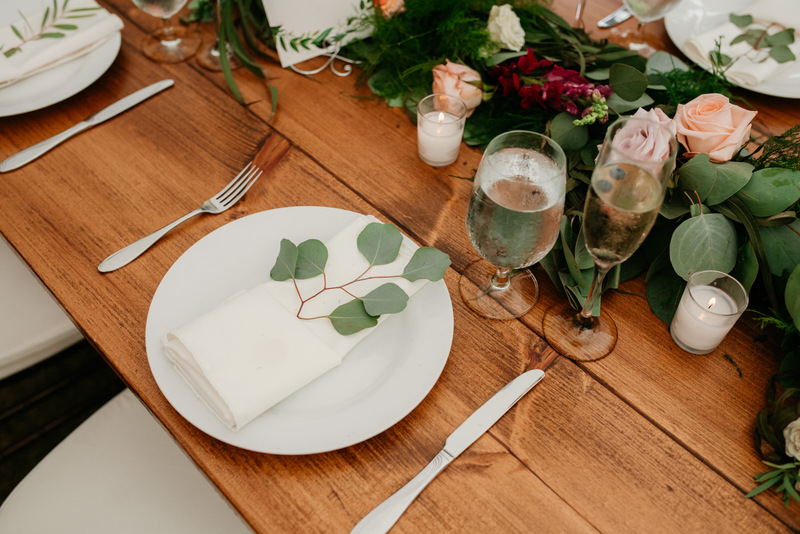 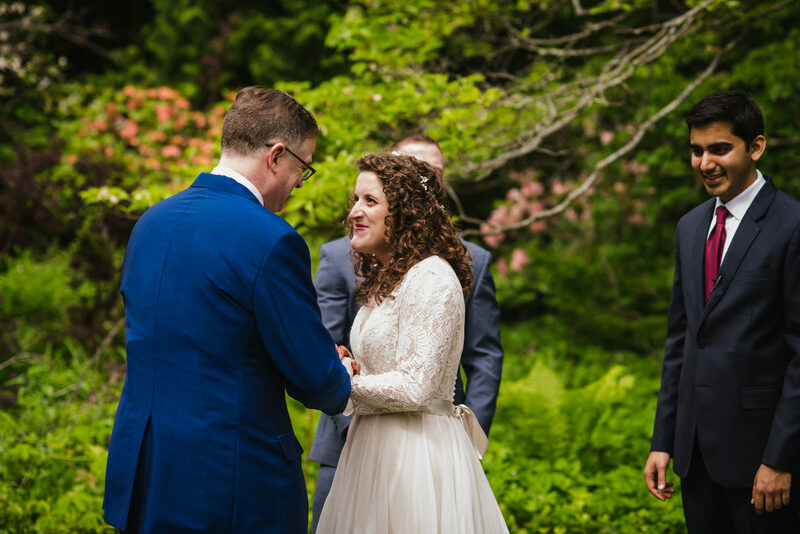 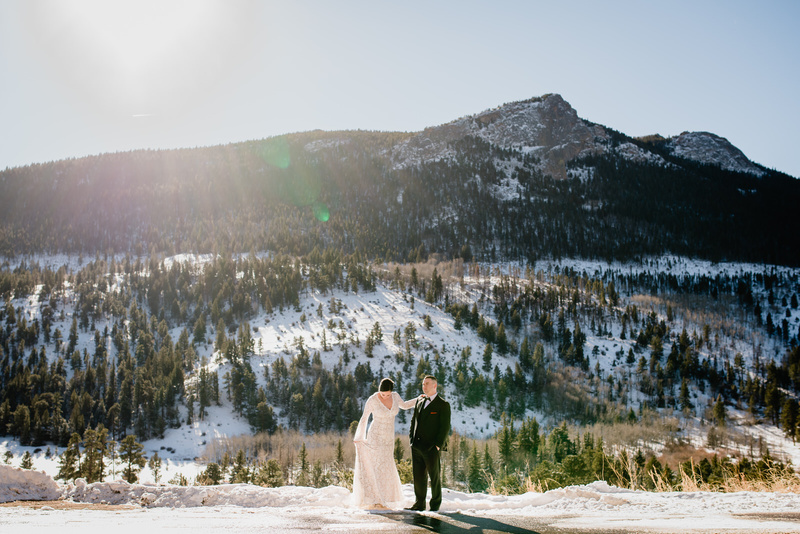 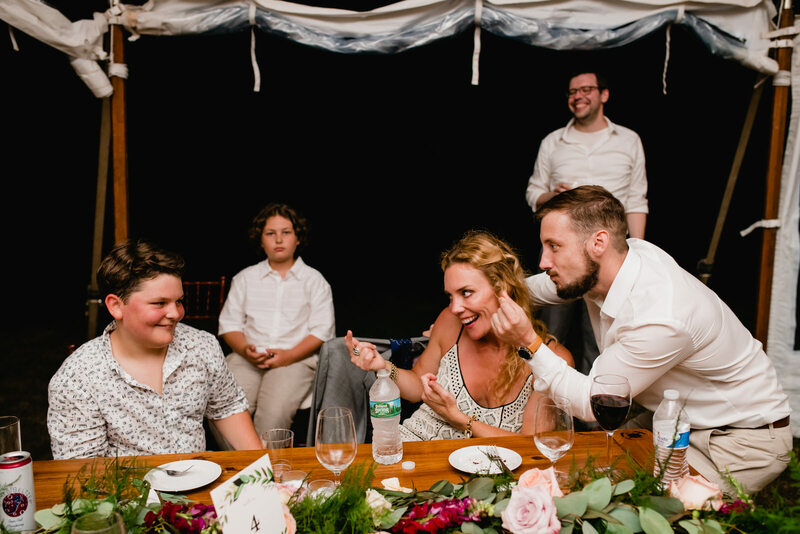 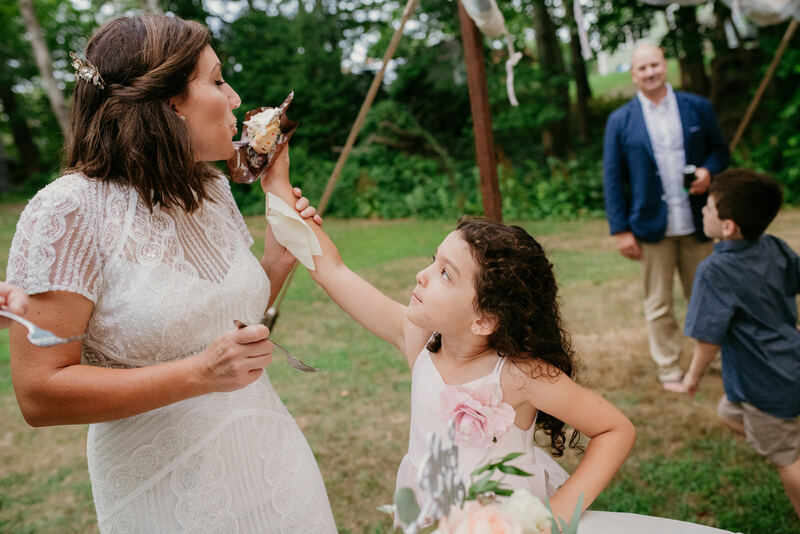 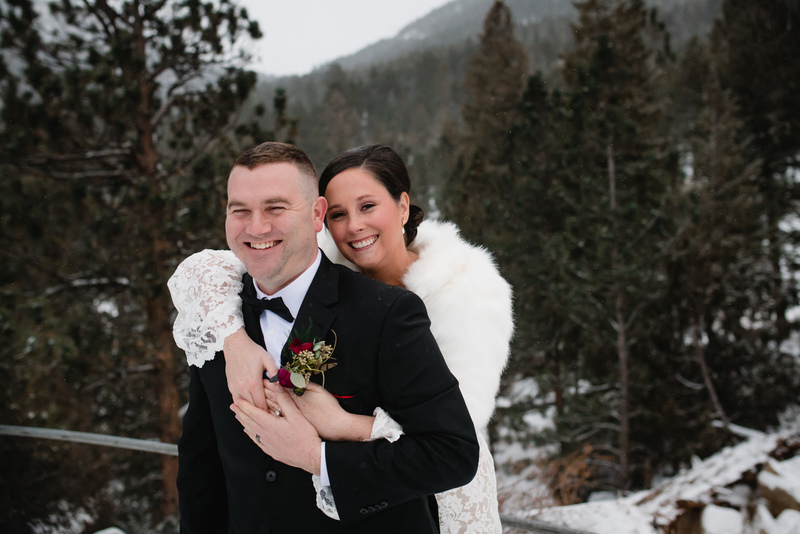 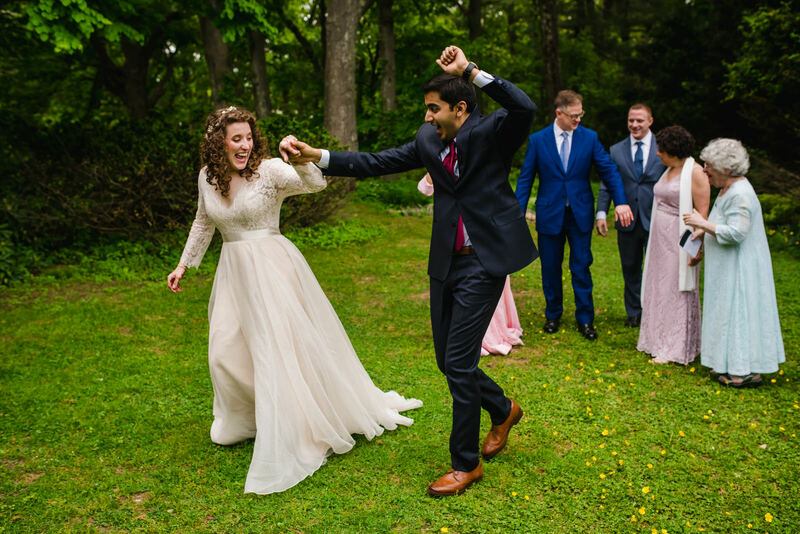 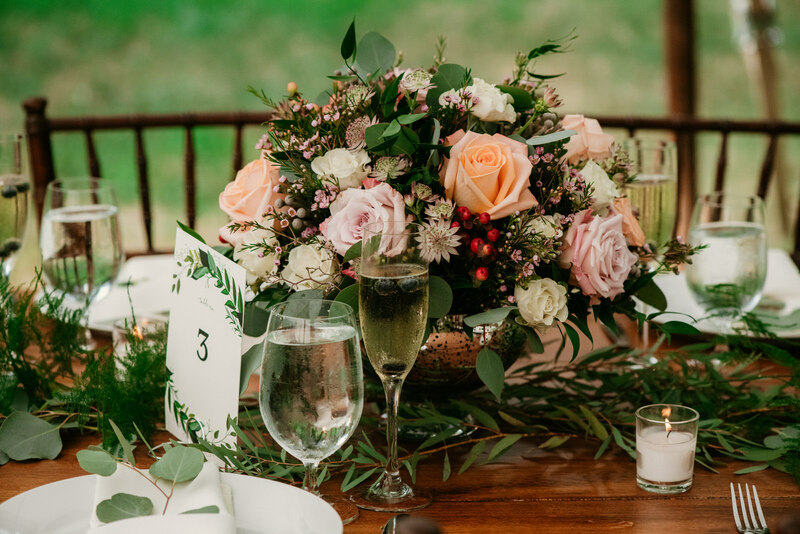 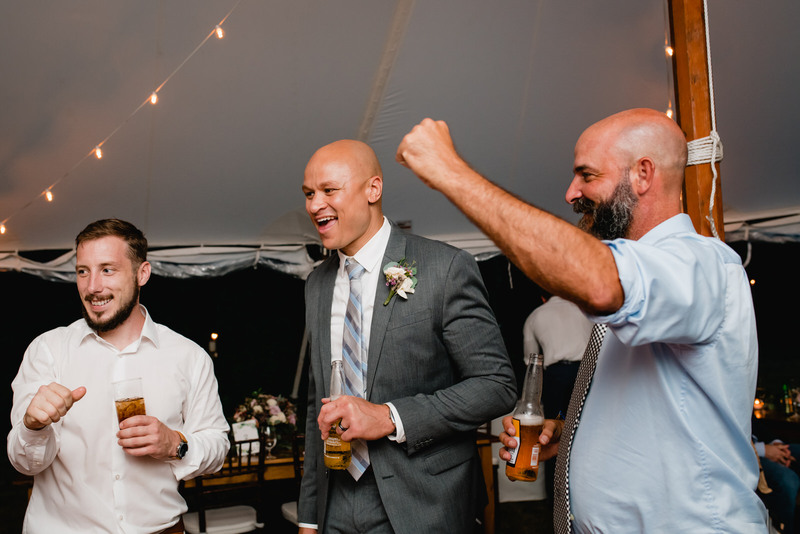 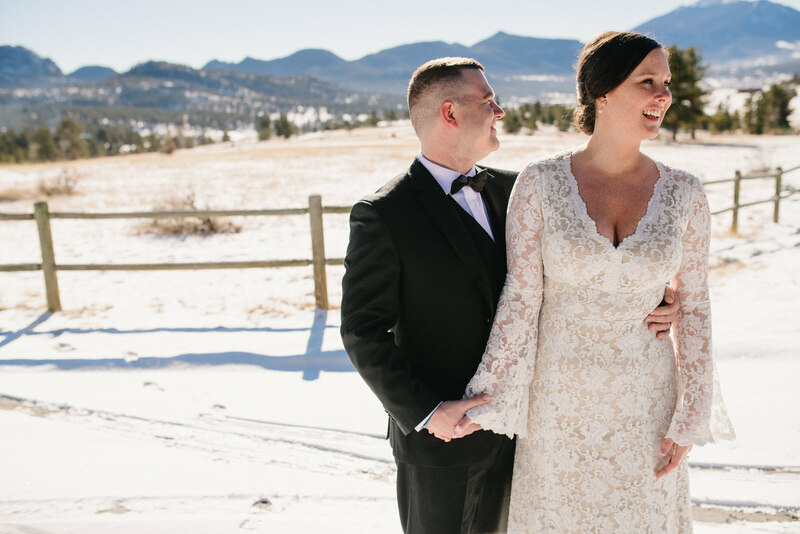 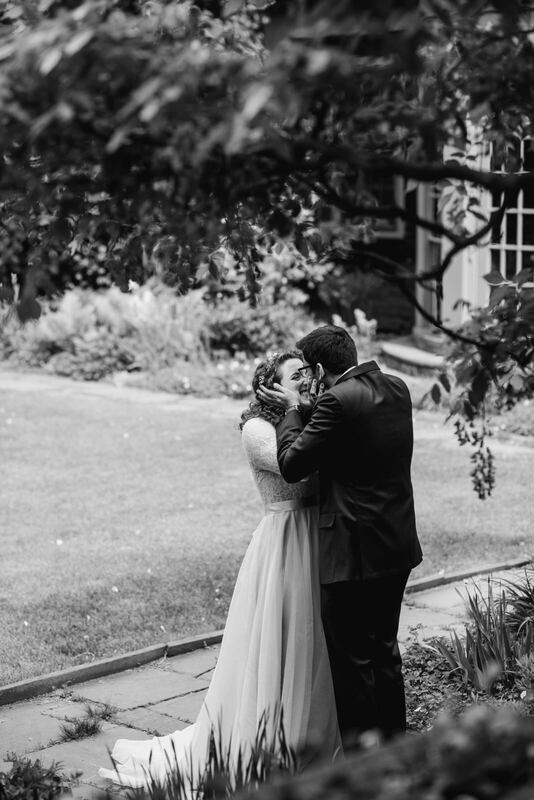 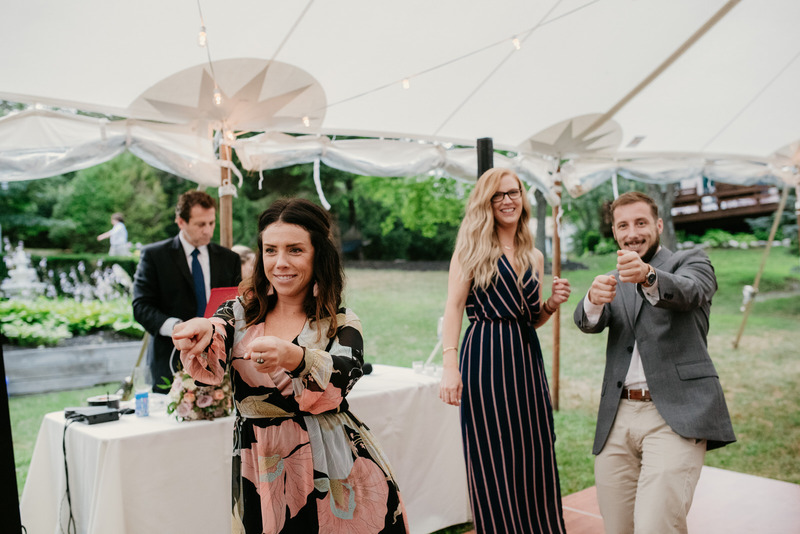 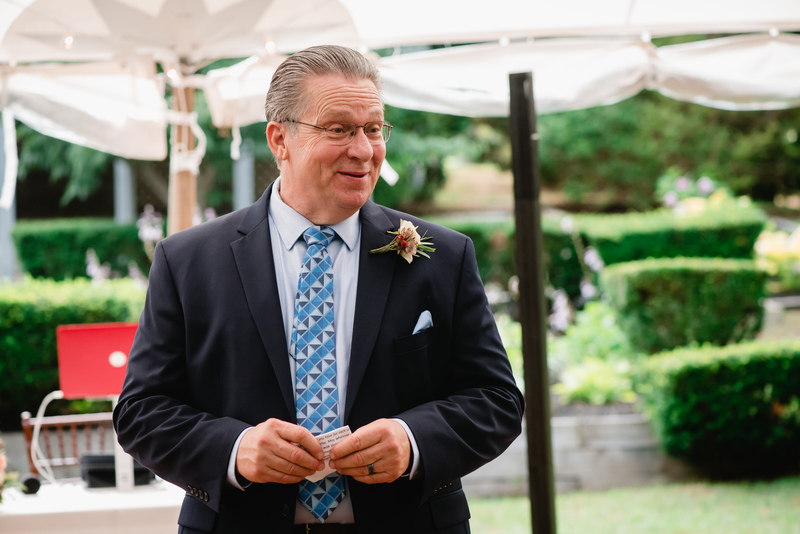 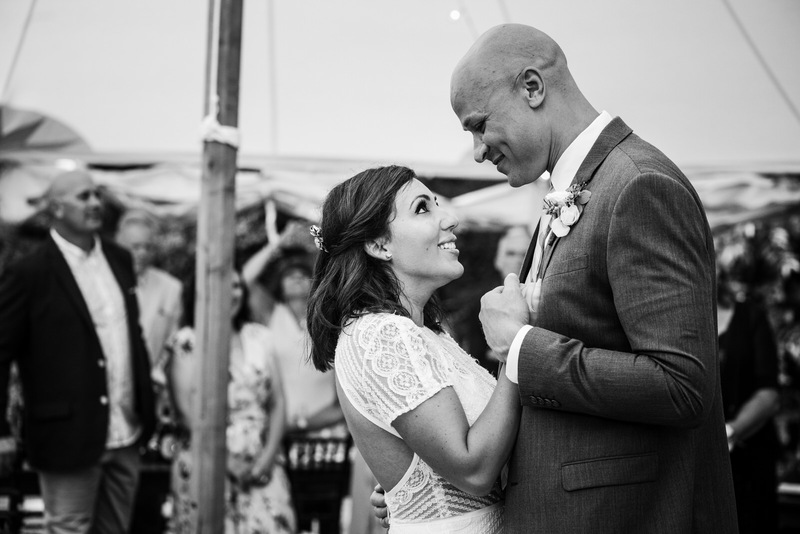 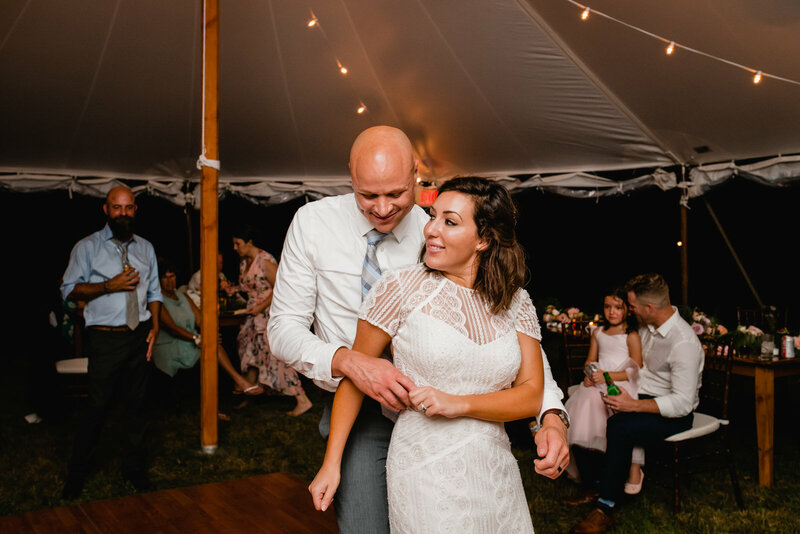 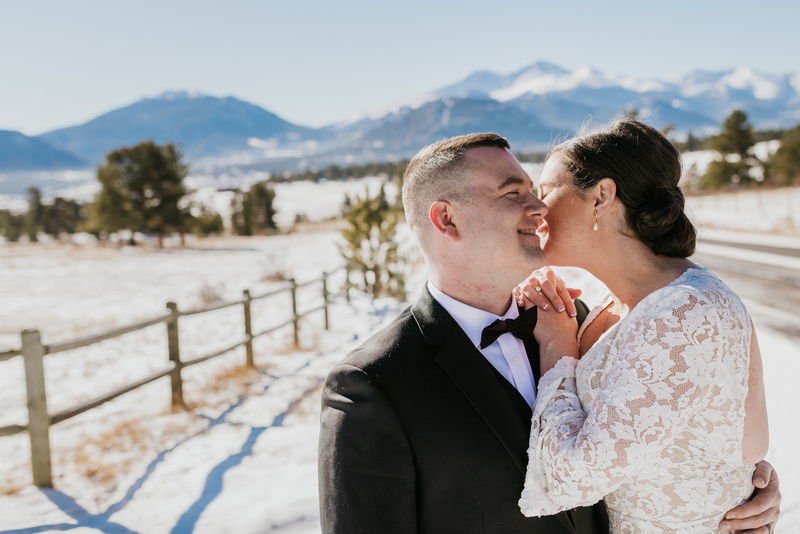 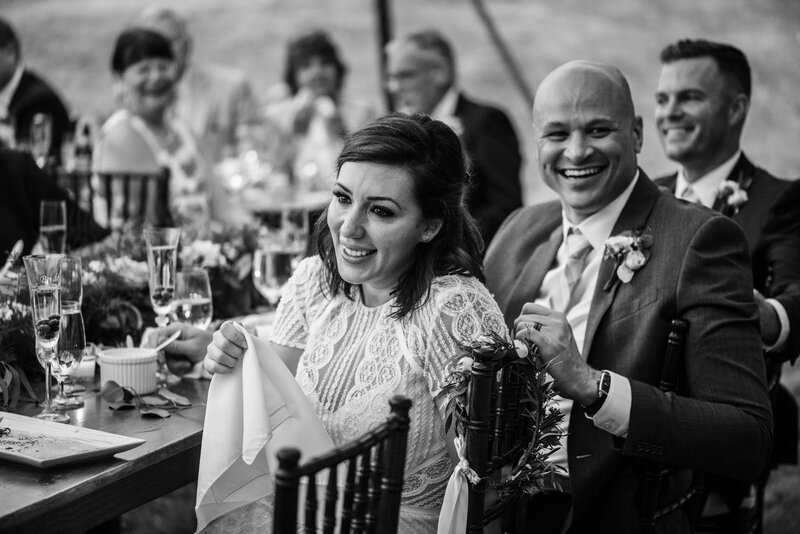 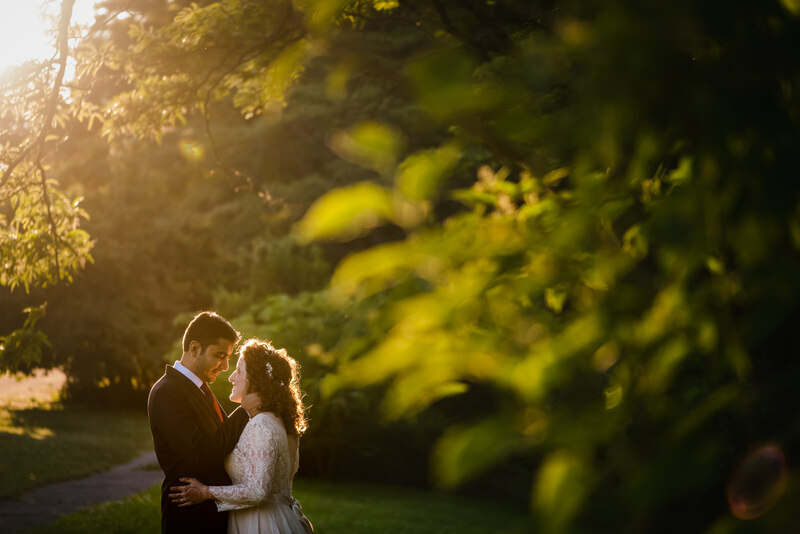 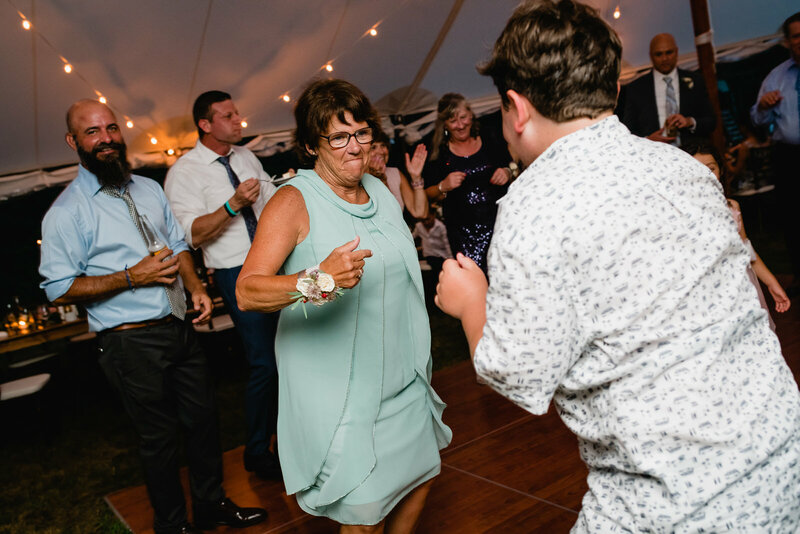 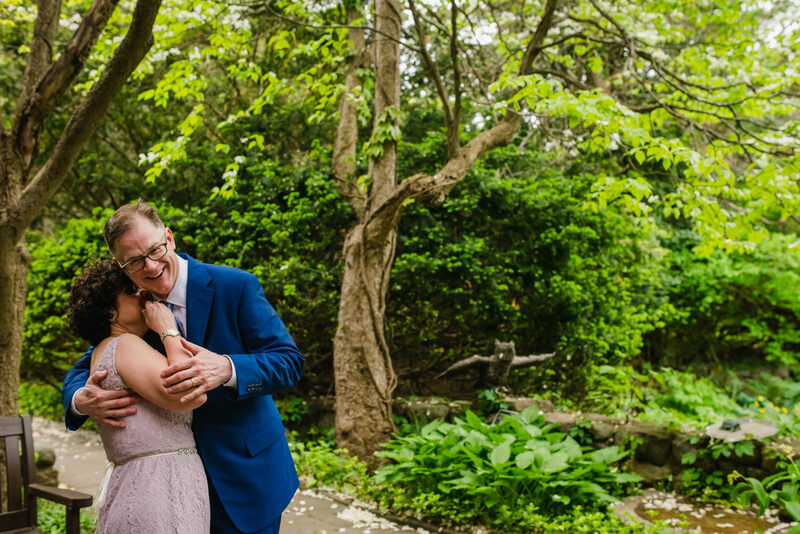 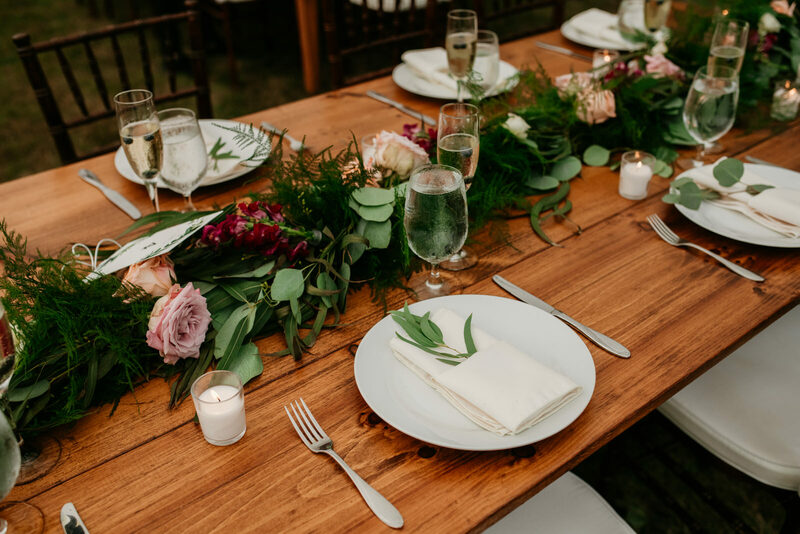 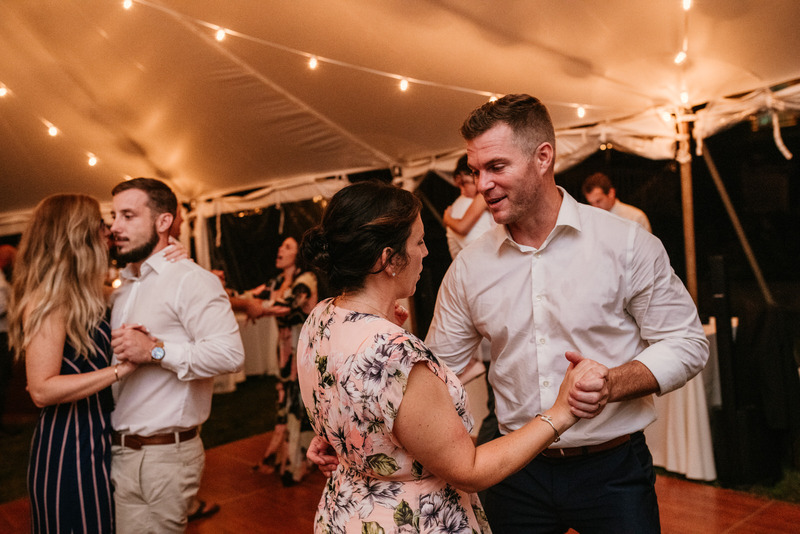 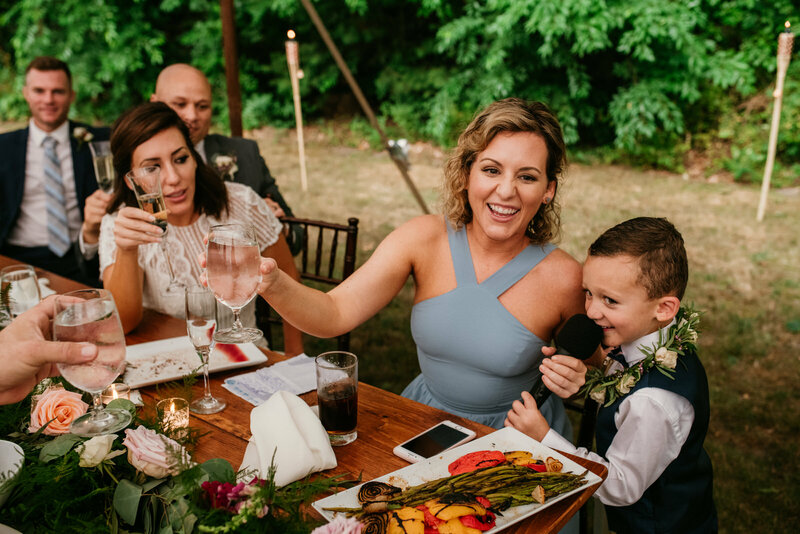 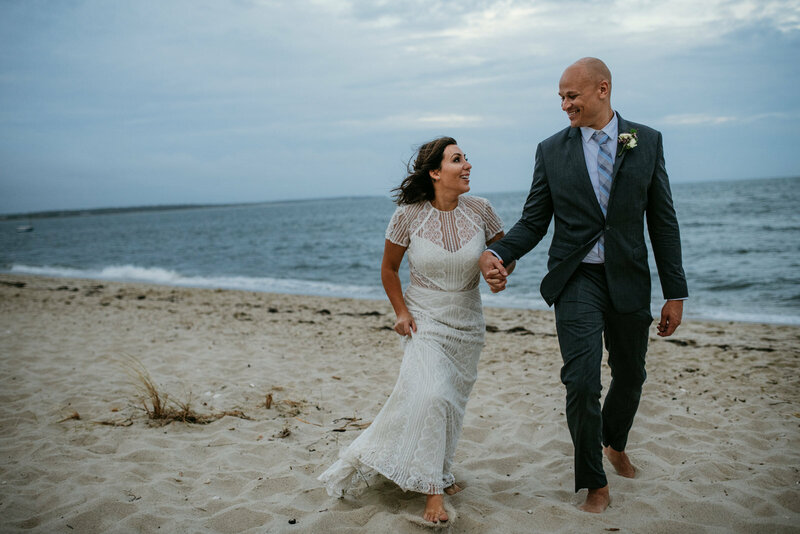 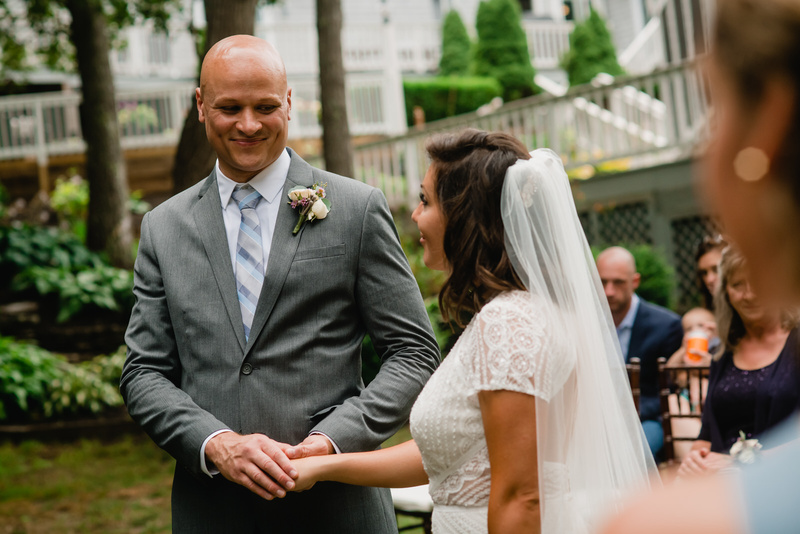 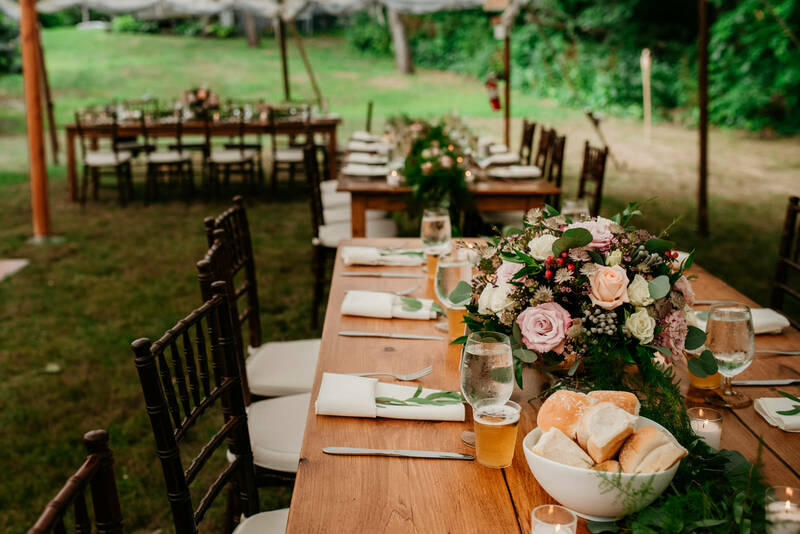 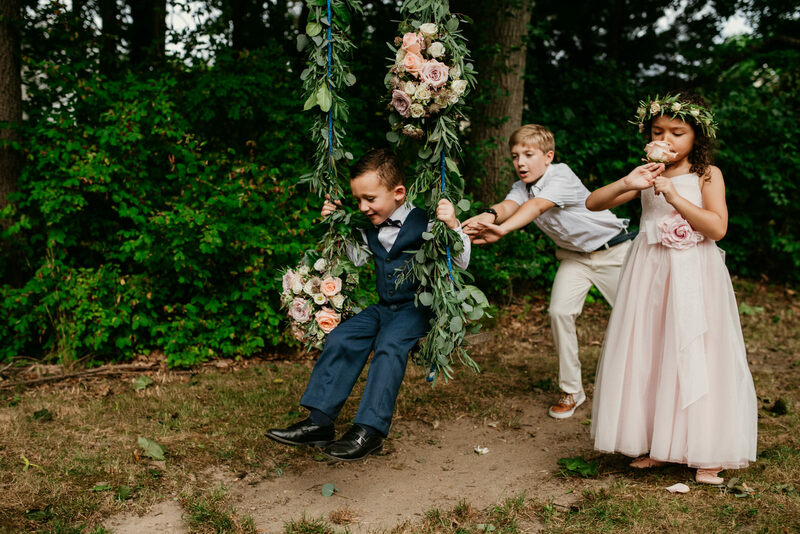 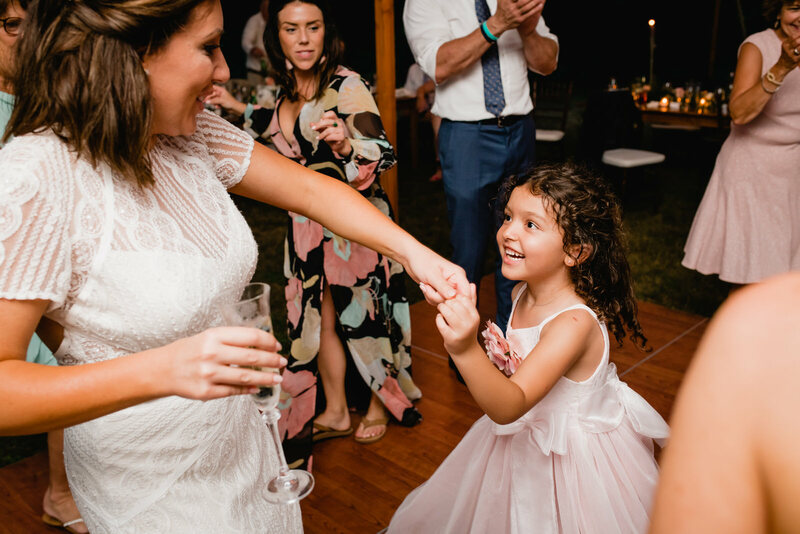 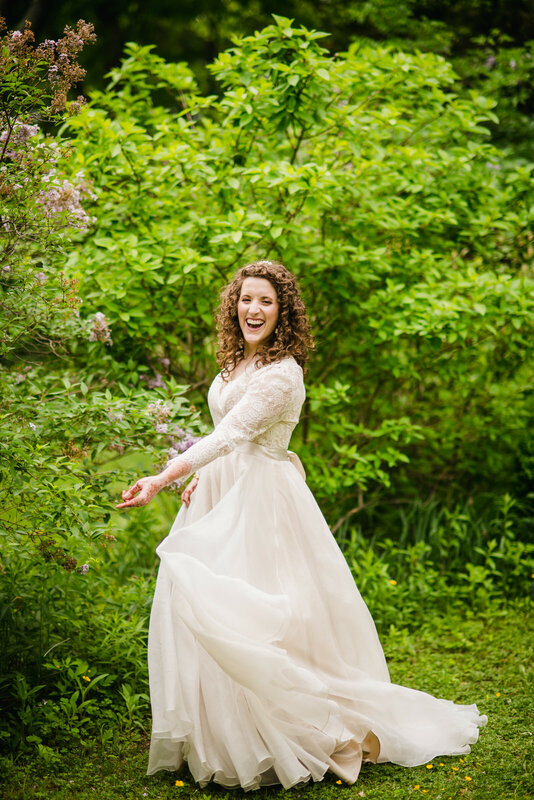 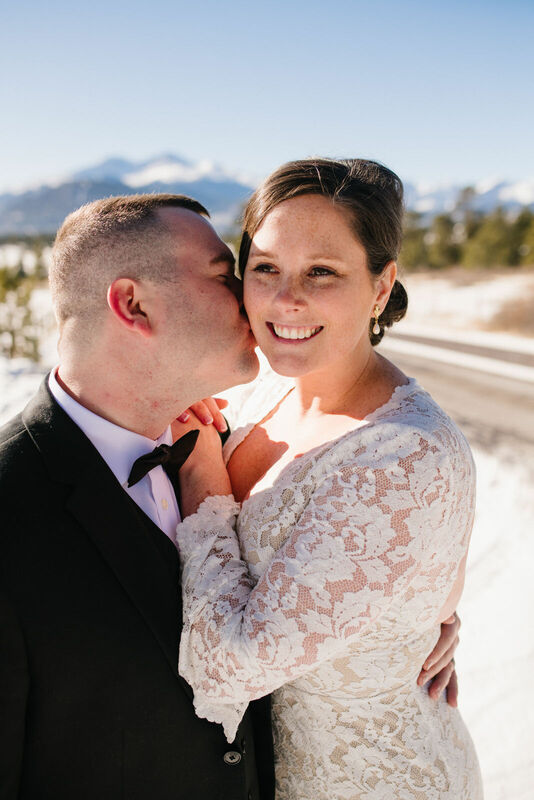 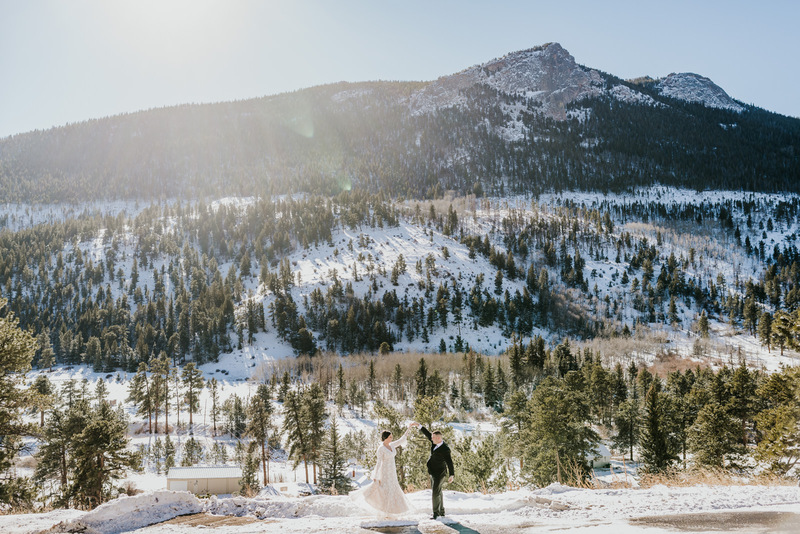 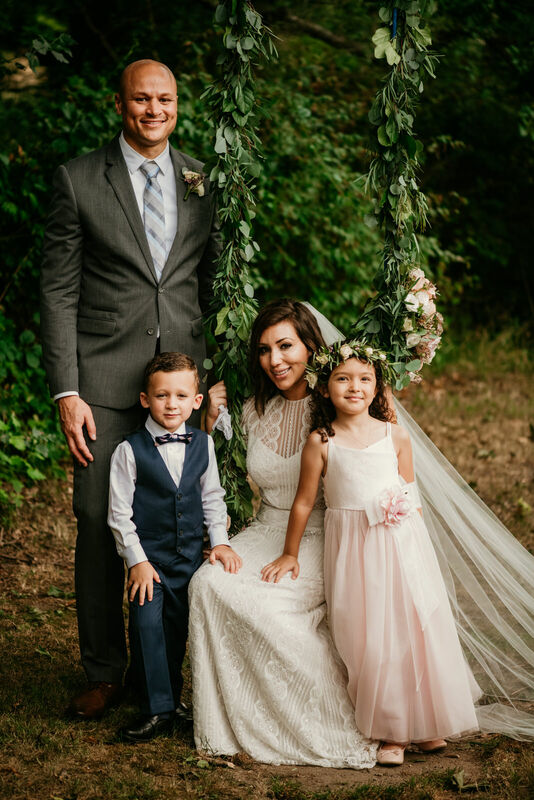 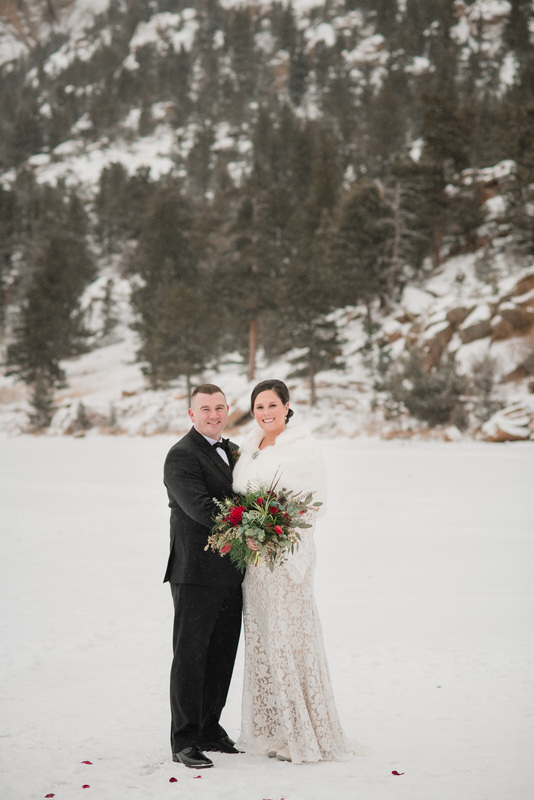 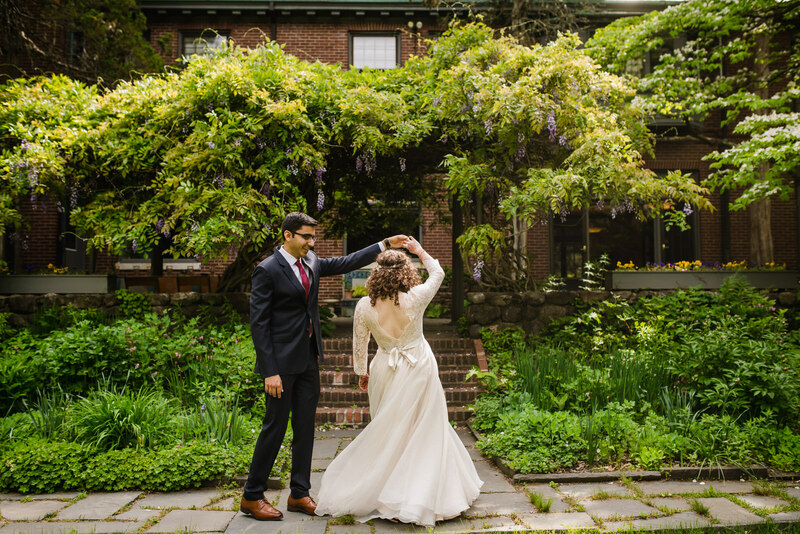 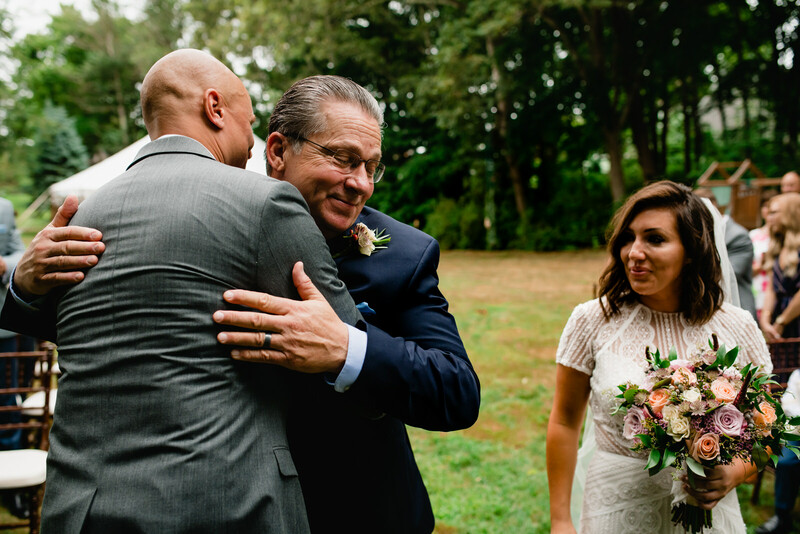 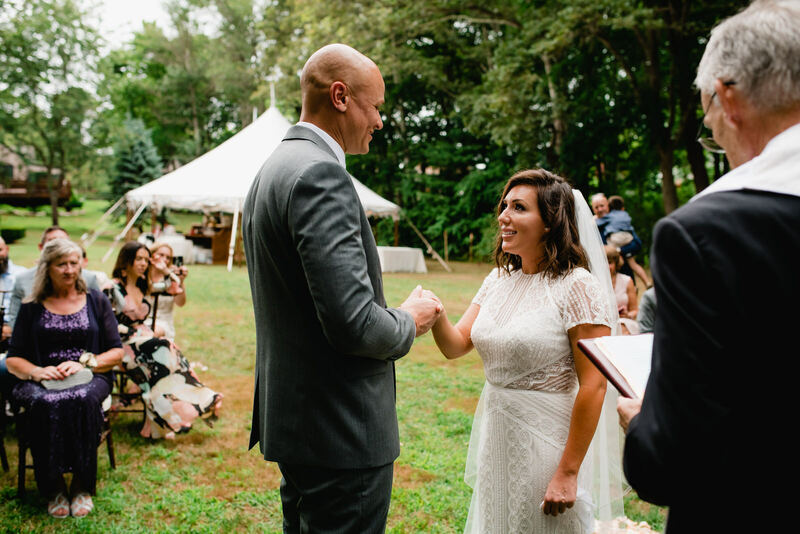 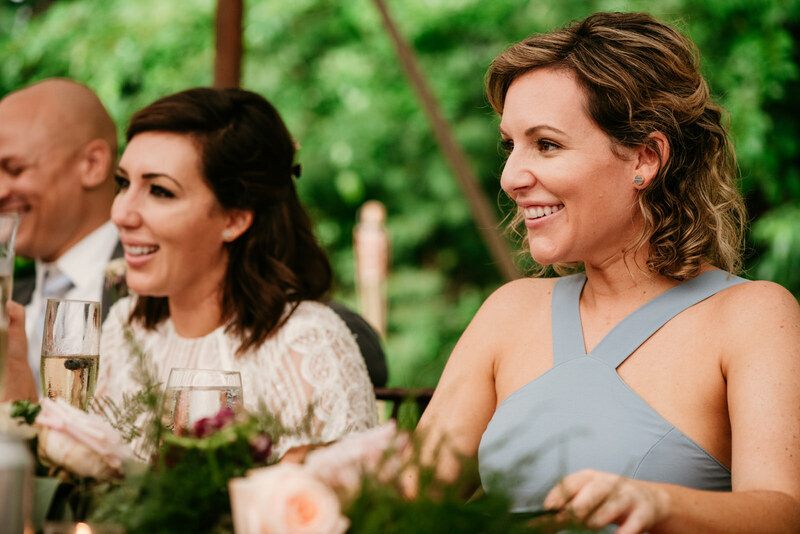 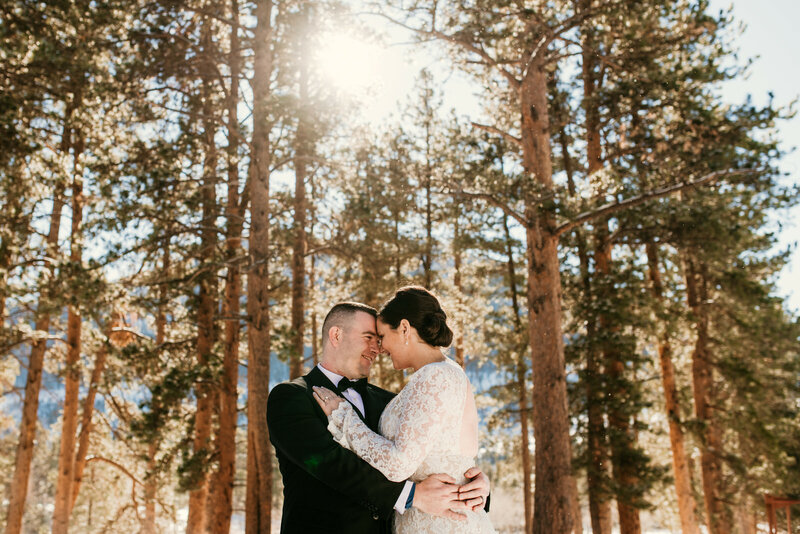 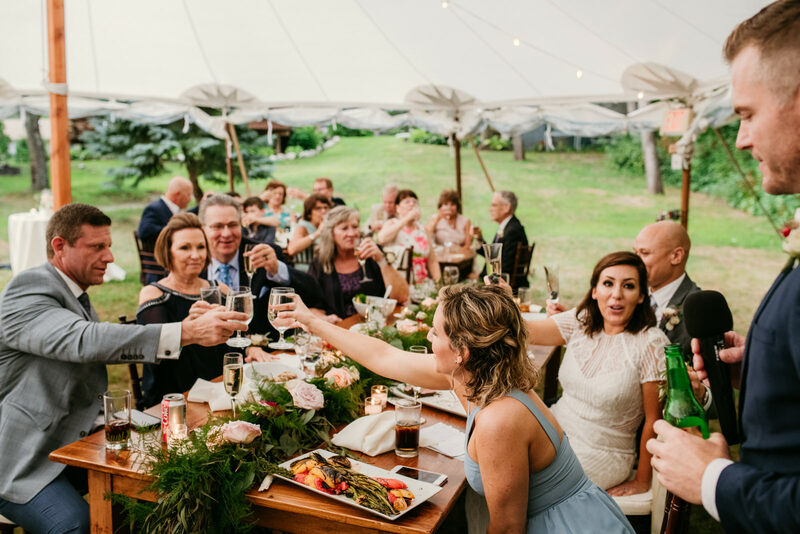 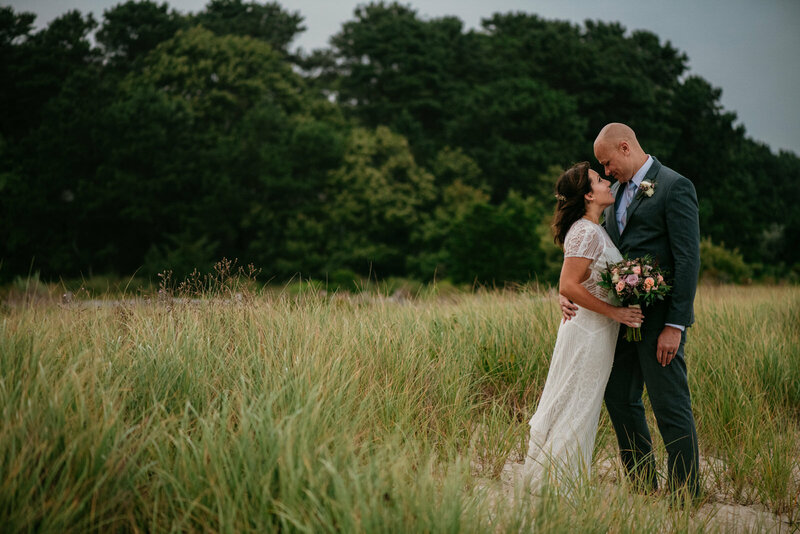 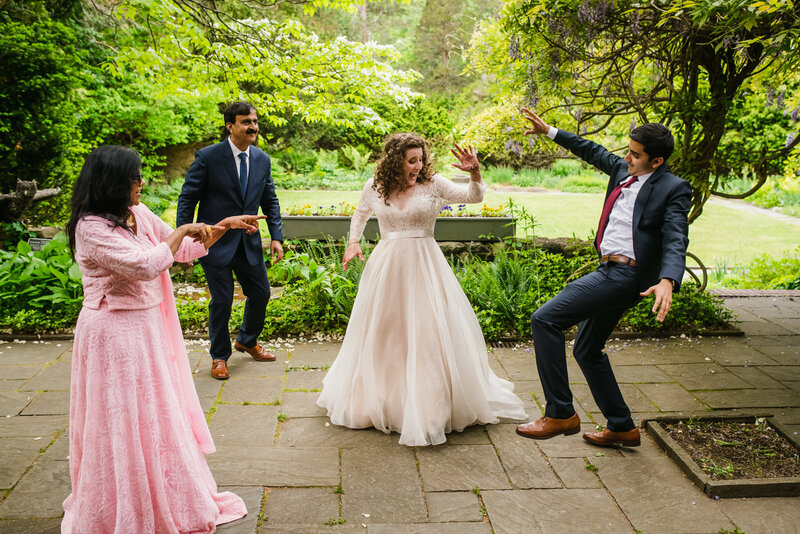 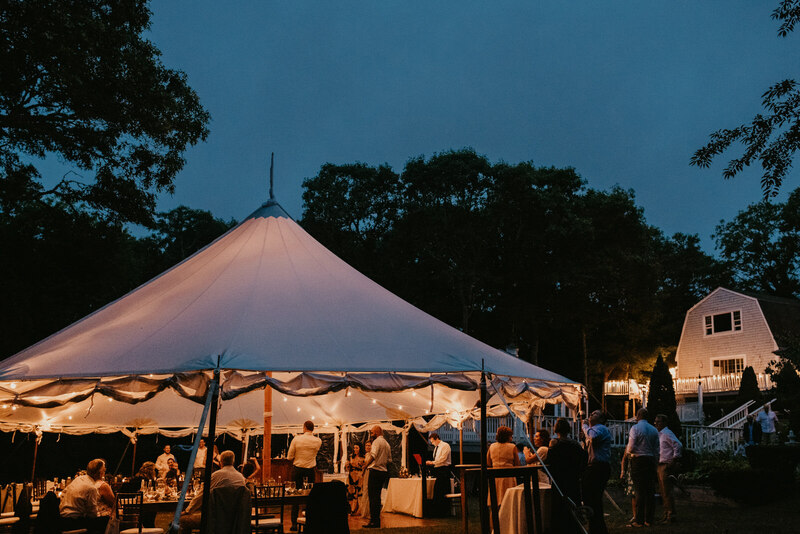 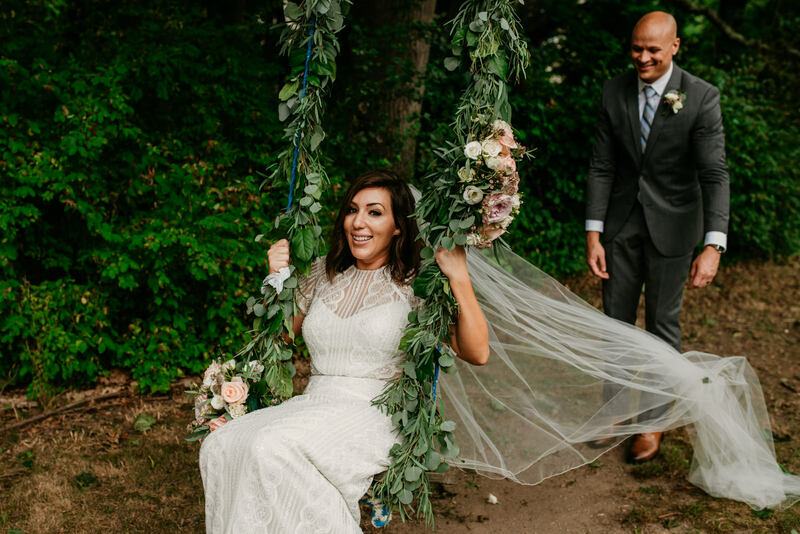 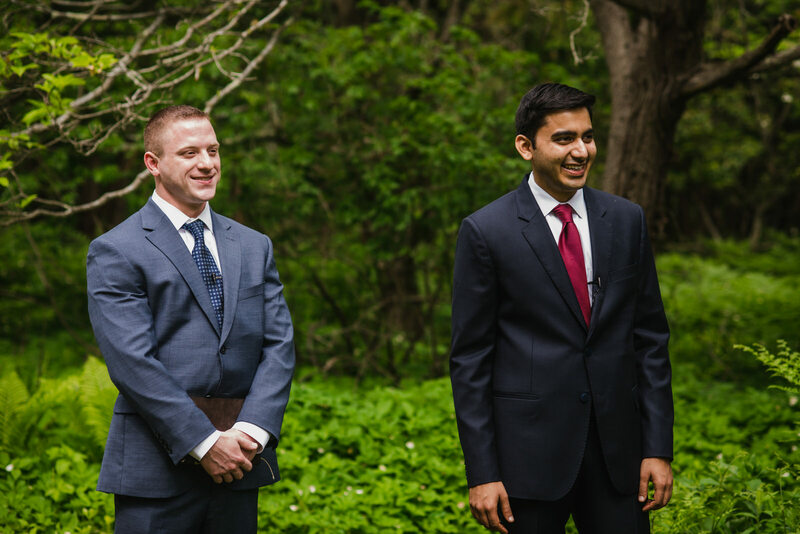 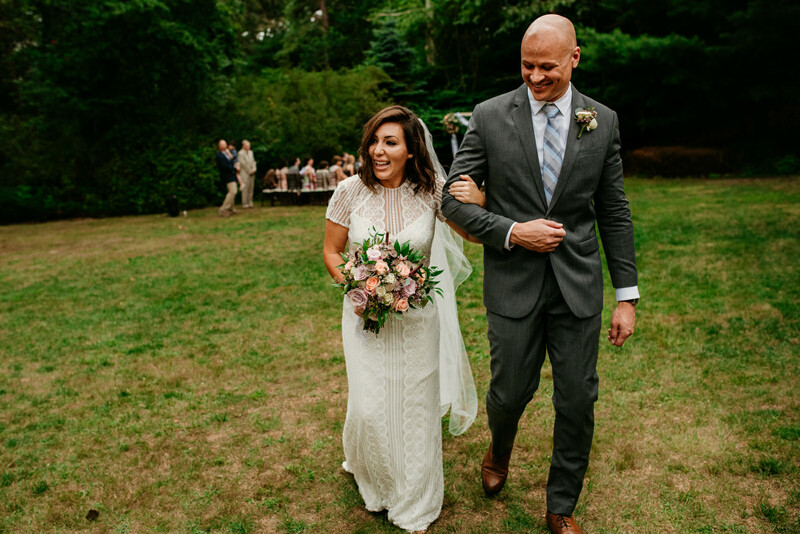 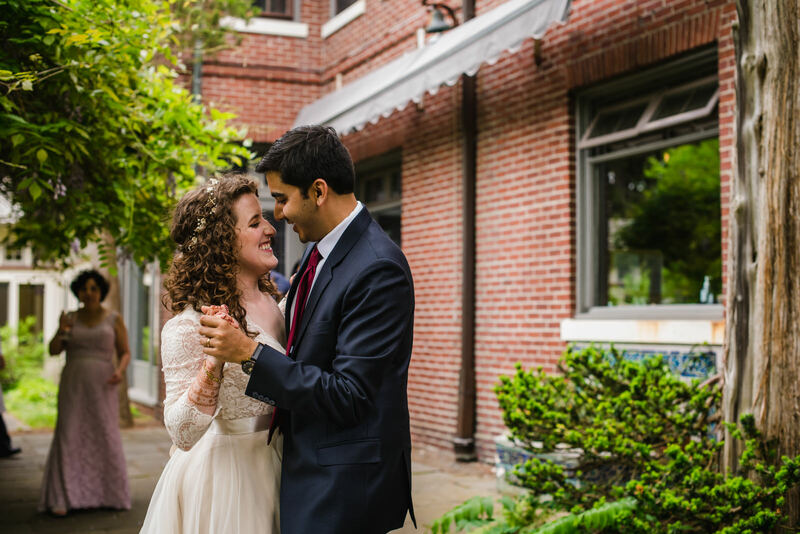 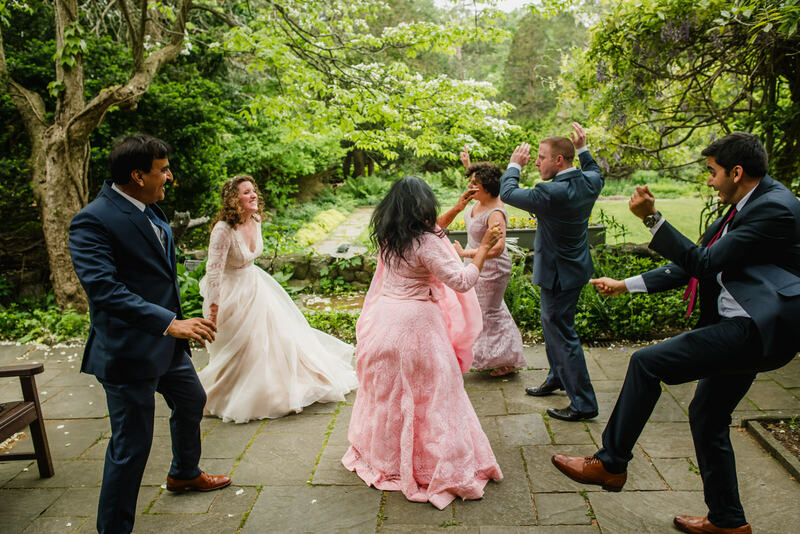 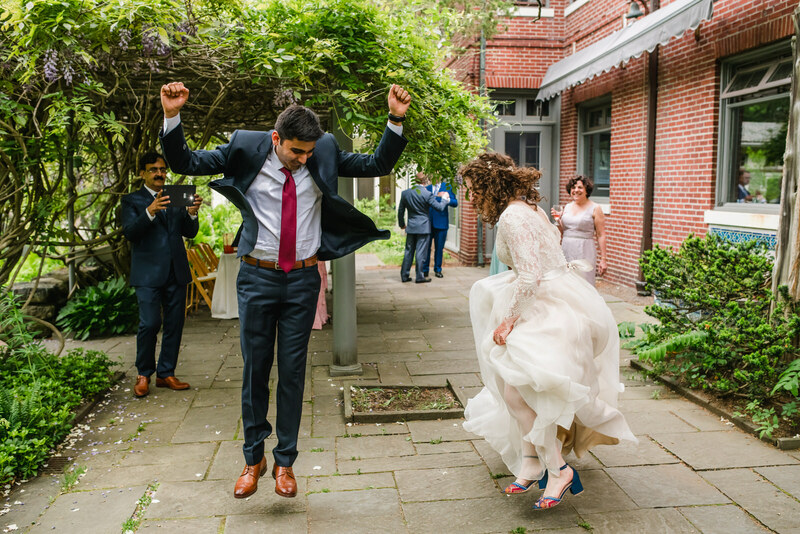 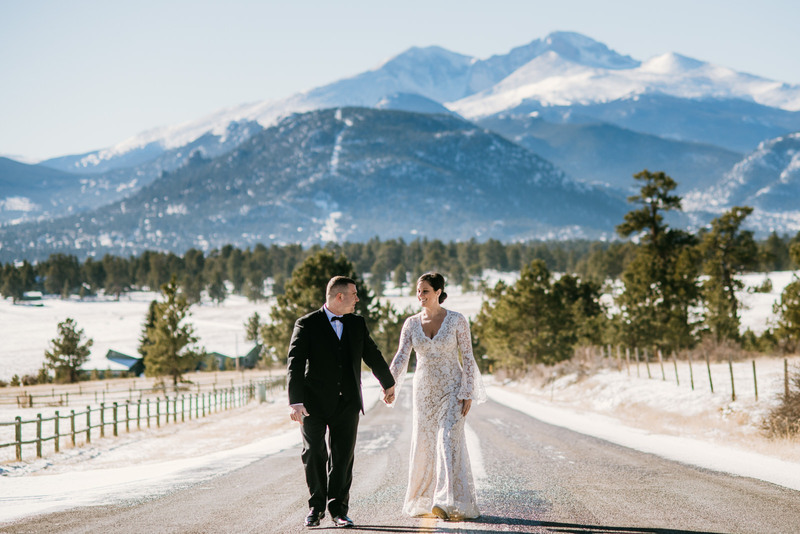 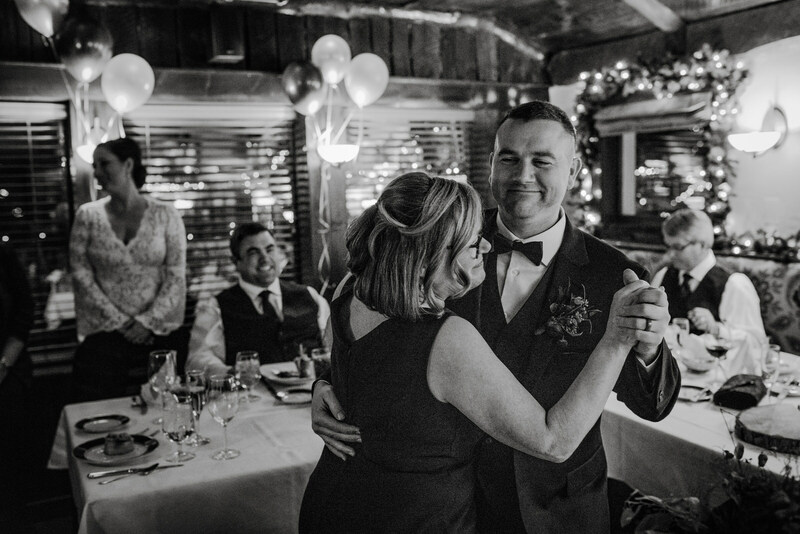 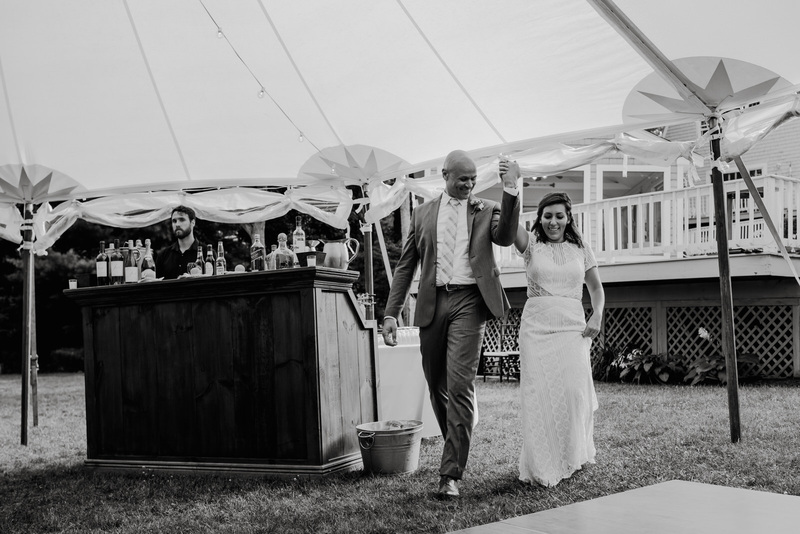 We love to dance, spend time in the outdoors, eat good food, and enjoy with family, so we’re not sure there was anything about our wedding that we weren’t excited about! 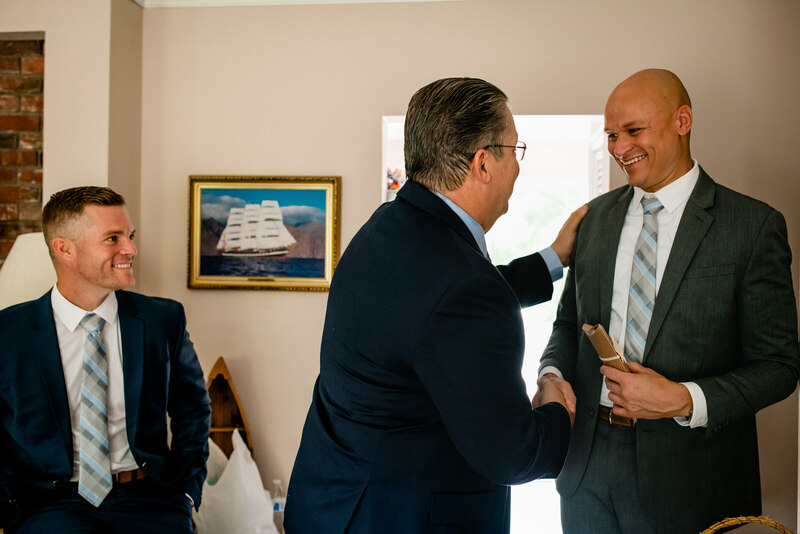 We put our hearts into the ceremony and fell in love with the environment at Habitat, but we were probably most excited to have our families together on this joyous day. 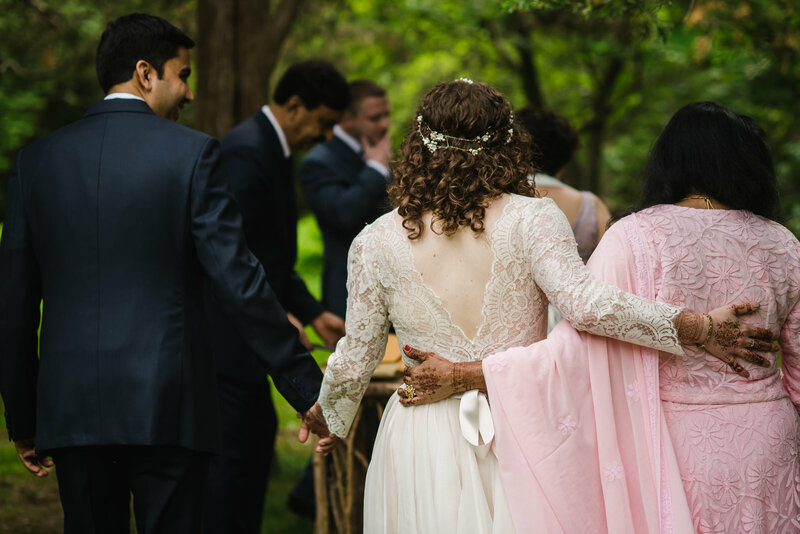 We had been anticipating Prem’s parents meeting Vedika’s grandmother for quite some time, and when the moment finally came it was absolutely beautiful. 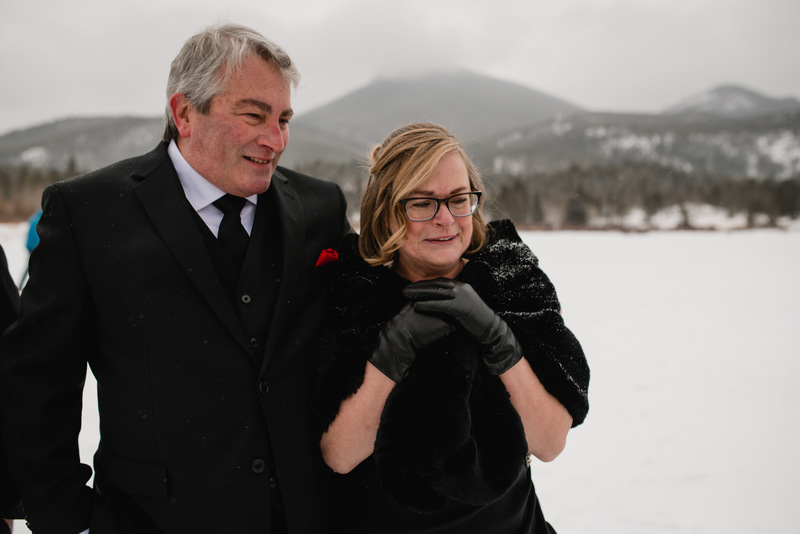 Did anything happened that you weren’t expecting? 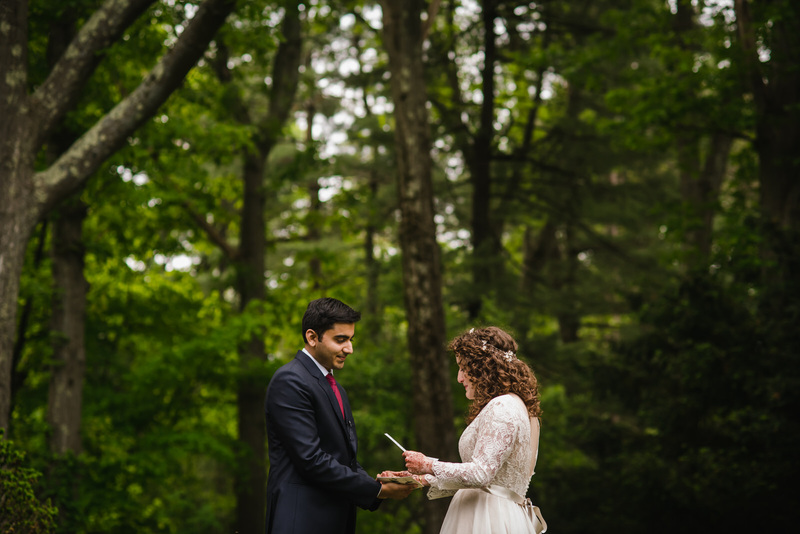 After we left Habitat and got home, we were both surprised at how fast the day seemed to have flown by. 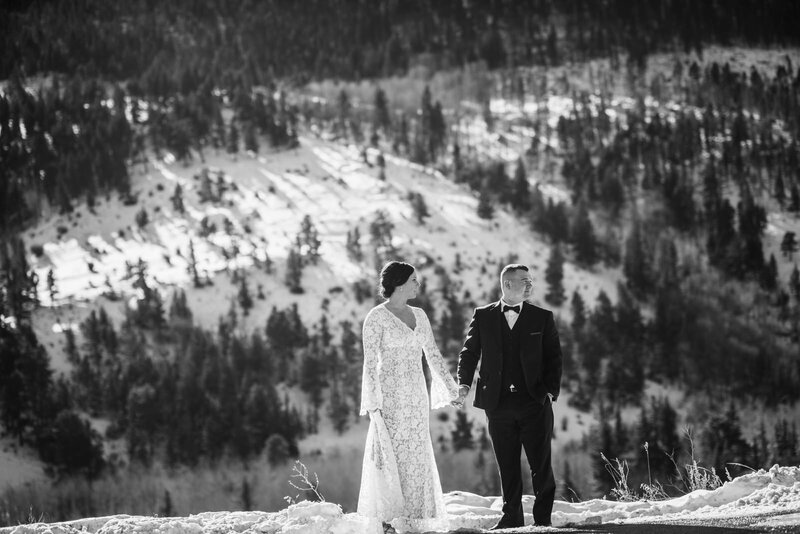 We are so grateful that we have these beautiful images to look back on. 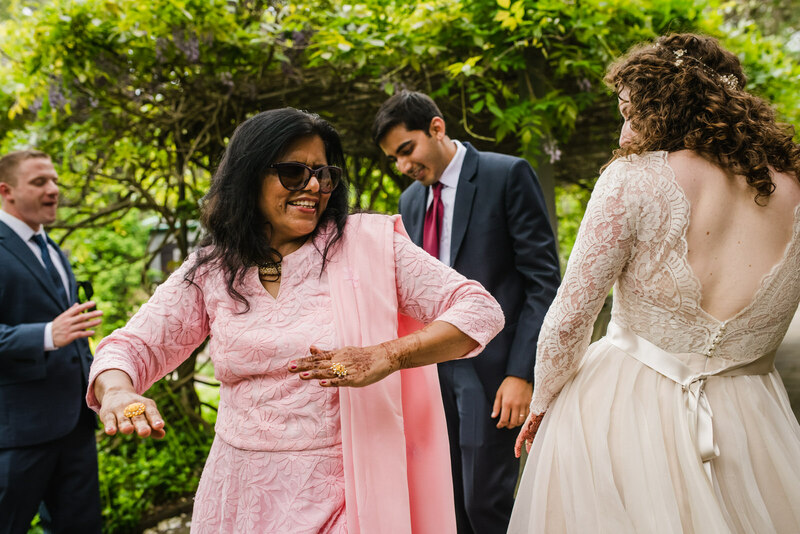 Watching Vedika’s parents dance to Hindi music and Prem’s parents dance to classic rock were moments filled with laughter and let-go that we hadn’t anticipated. 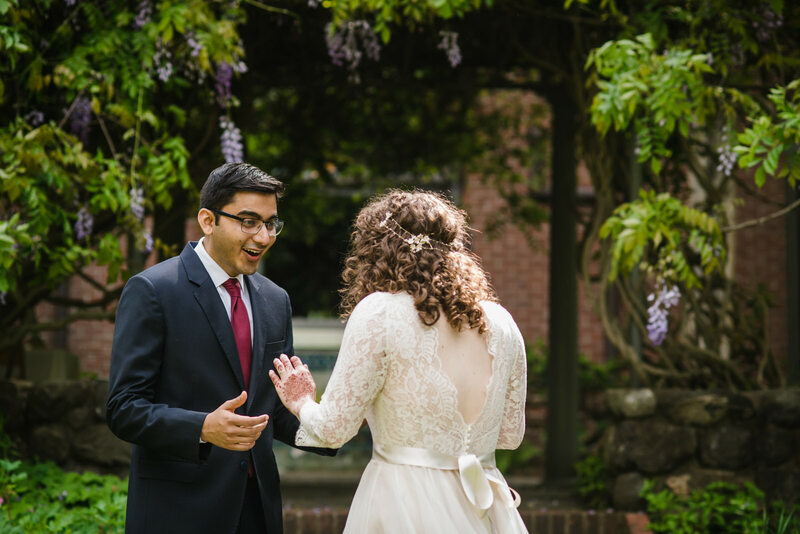 We also couldn’t have expected to get married on such a beautiful day, and are so grateful for that wonderful addition! 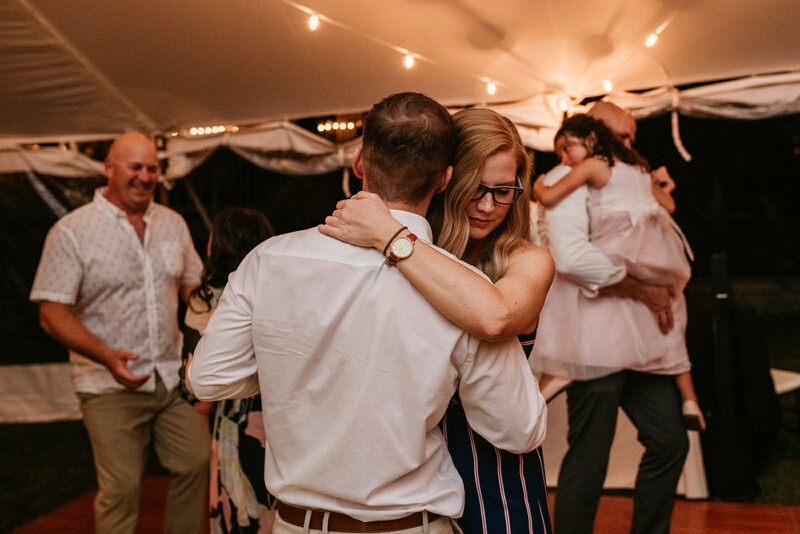 We always come back to images of laughter, hugs, and dancing. 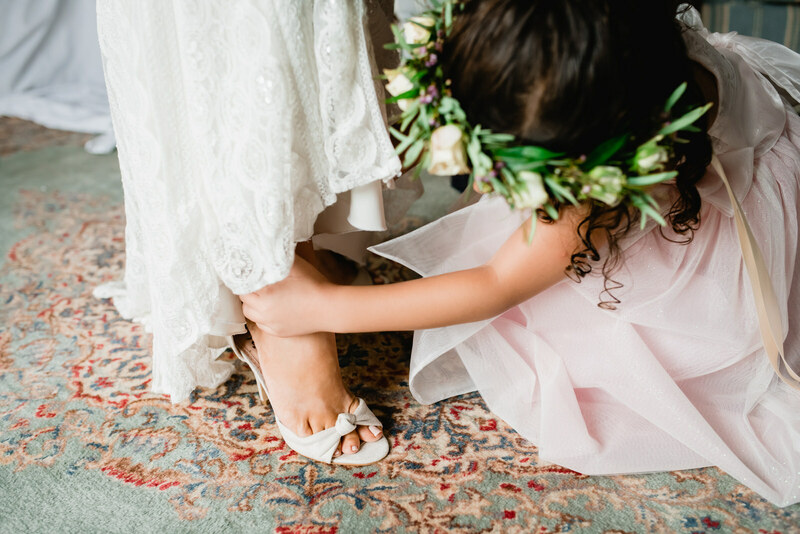 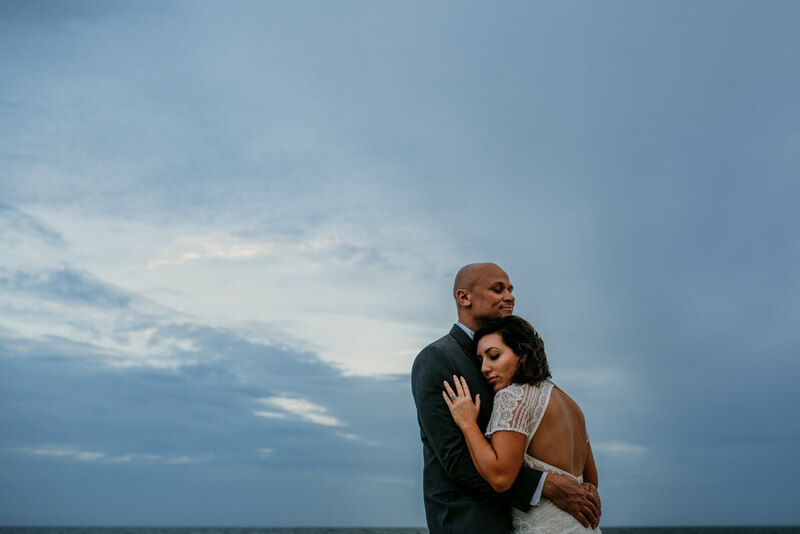 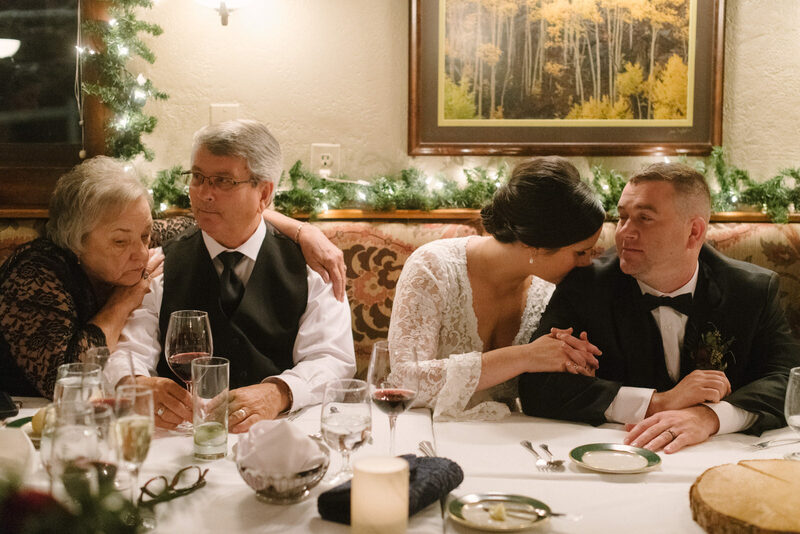 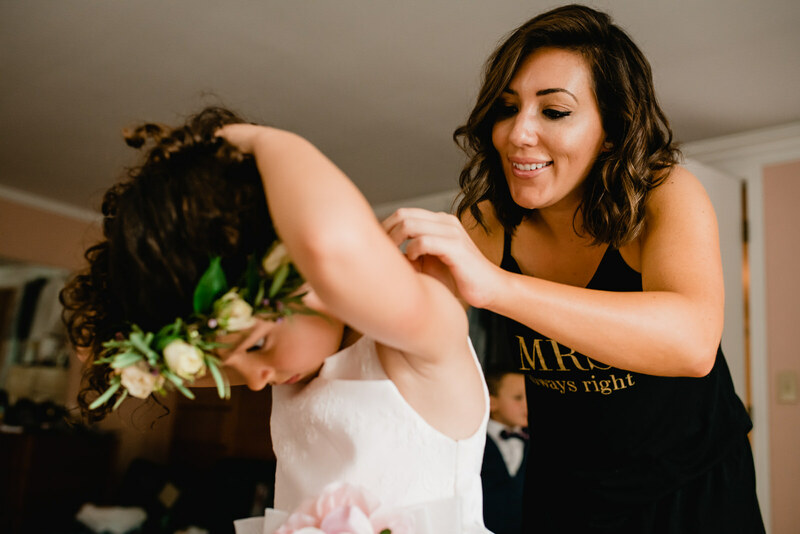 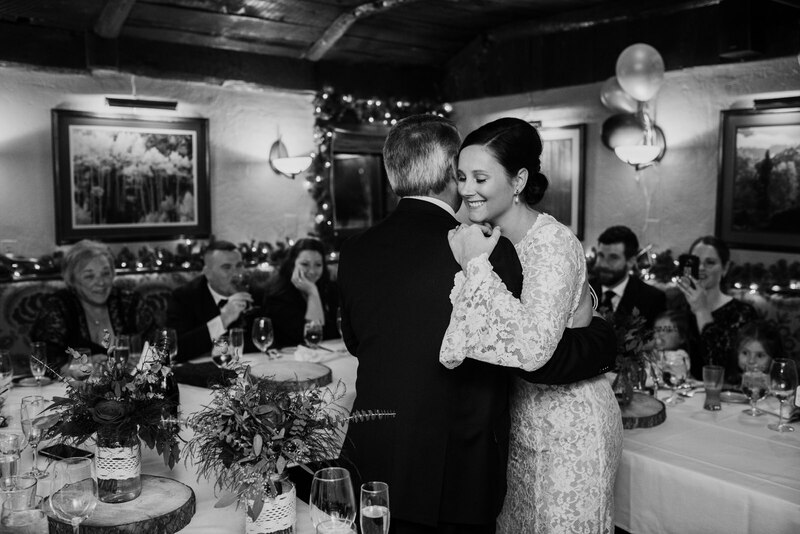 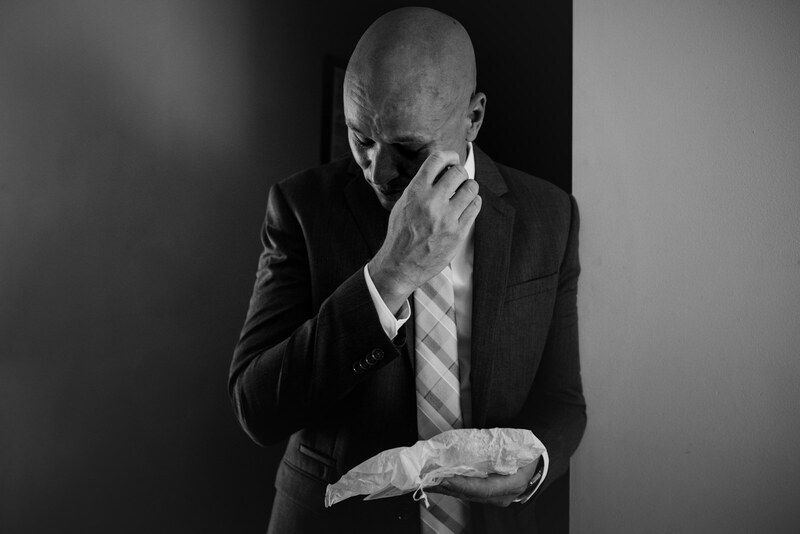 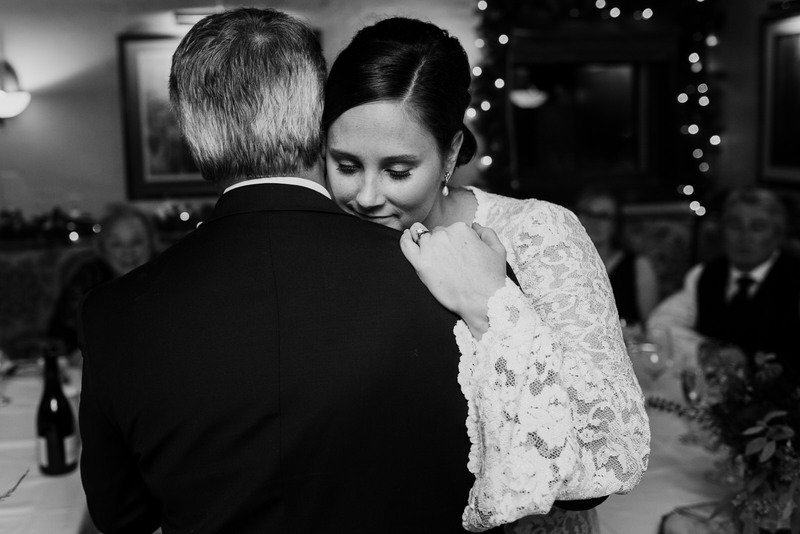 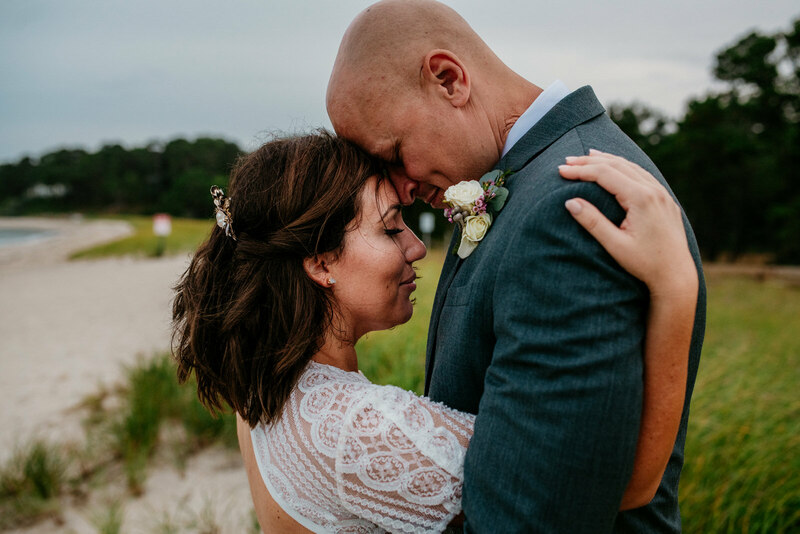 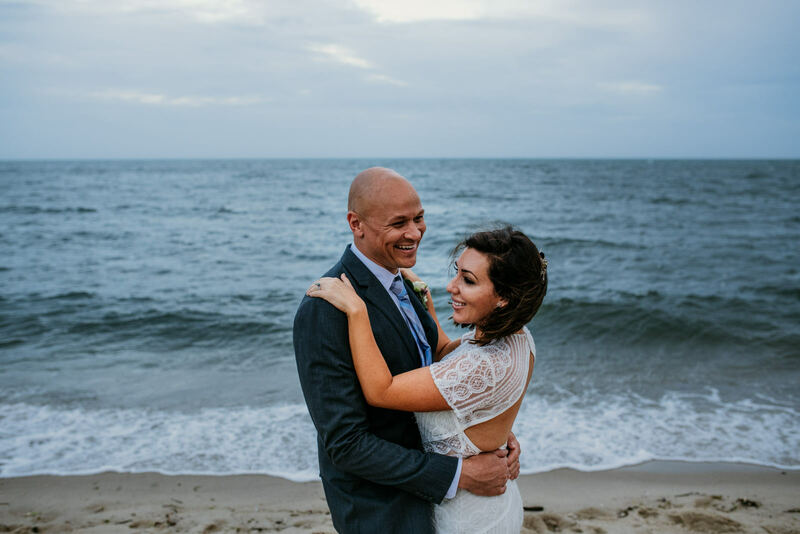 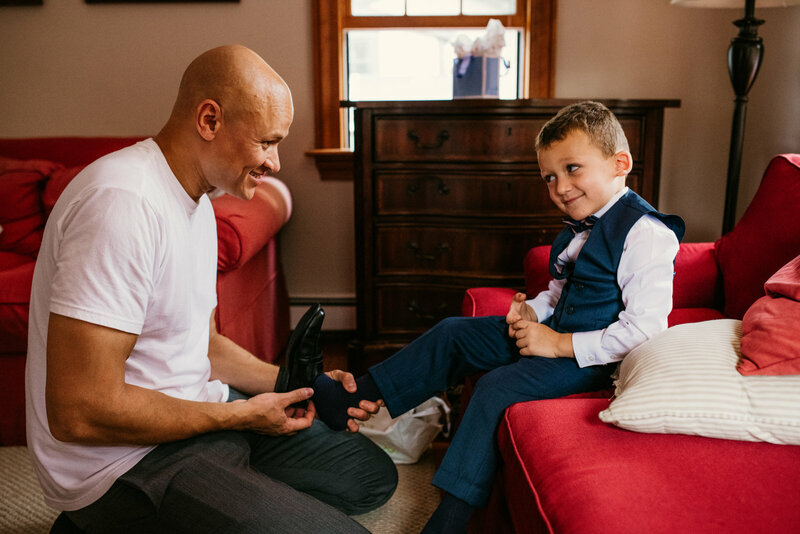 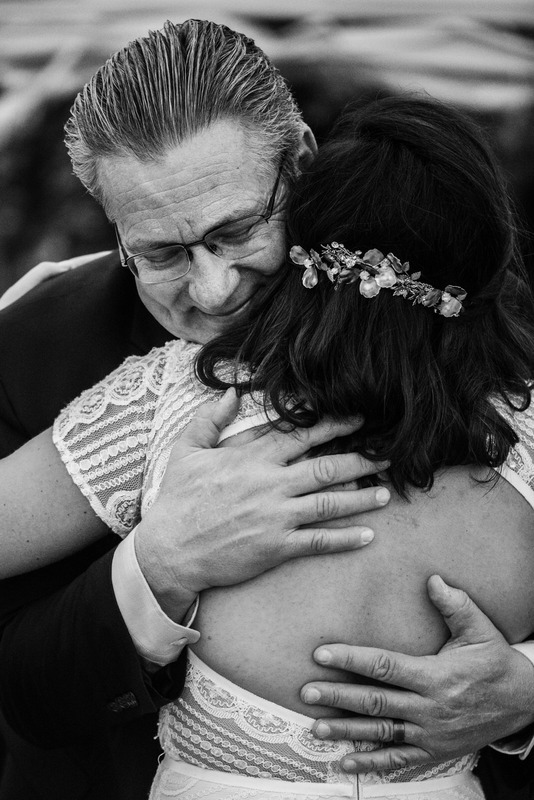 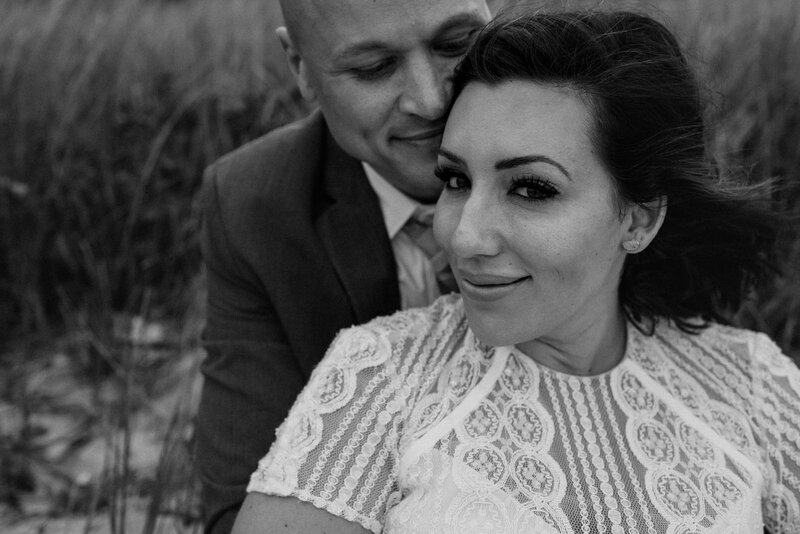 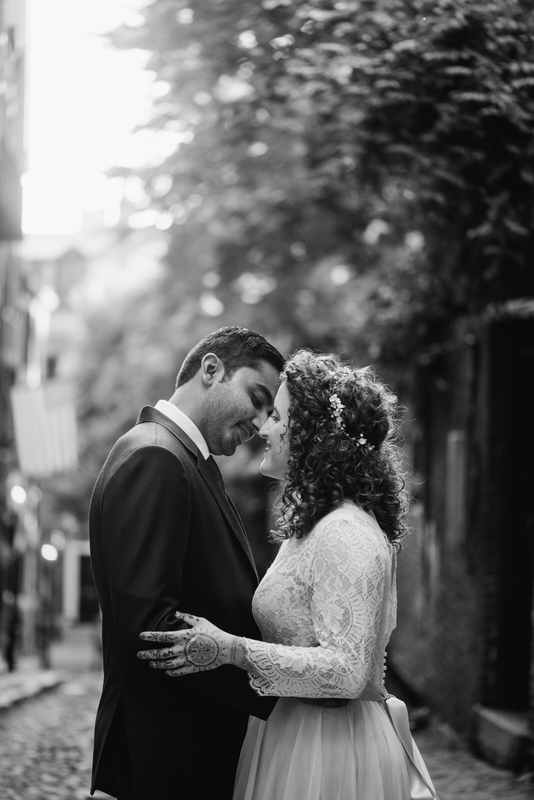 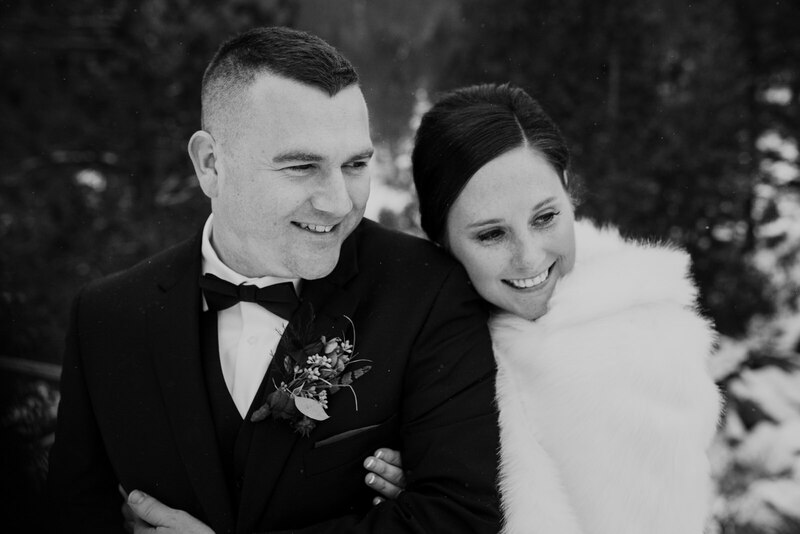 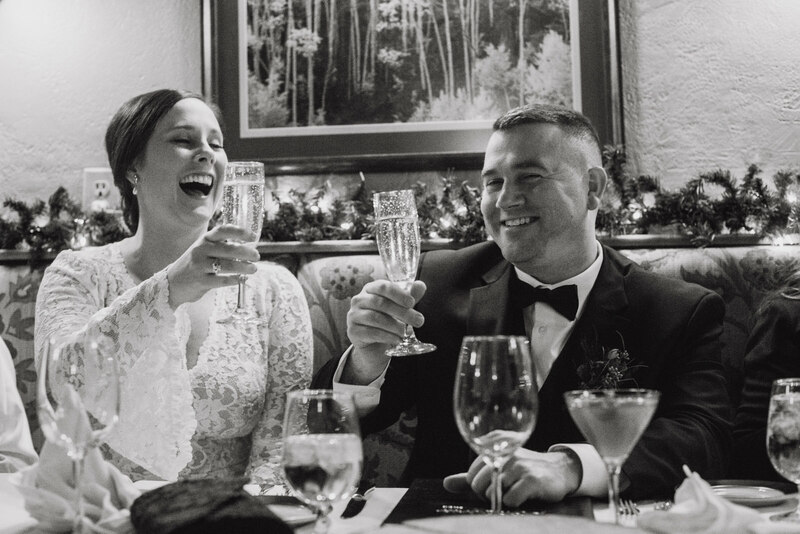 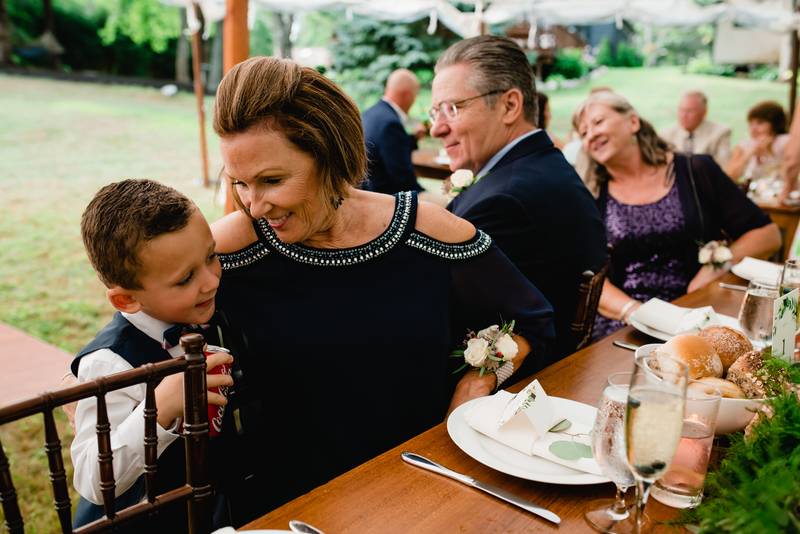 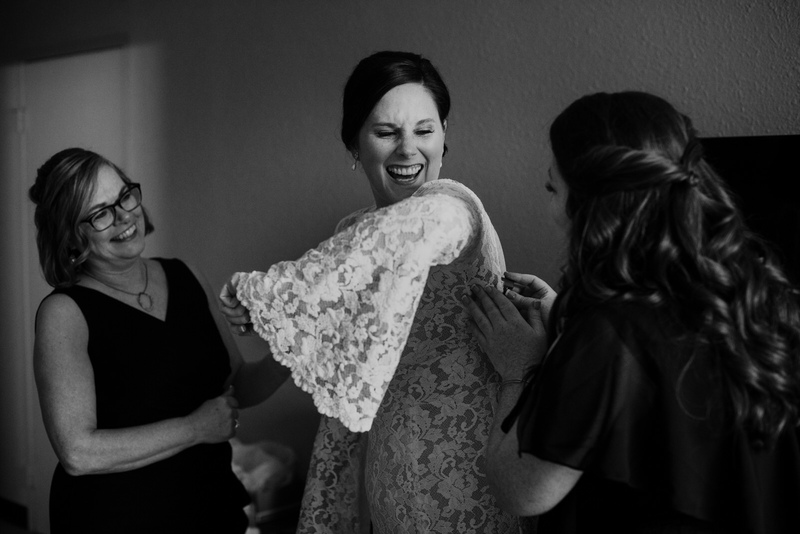 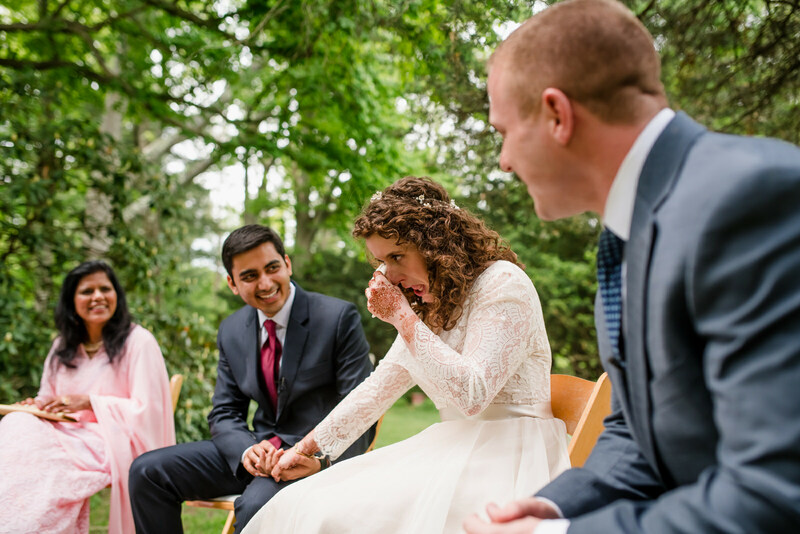 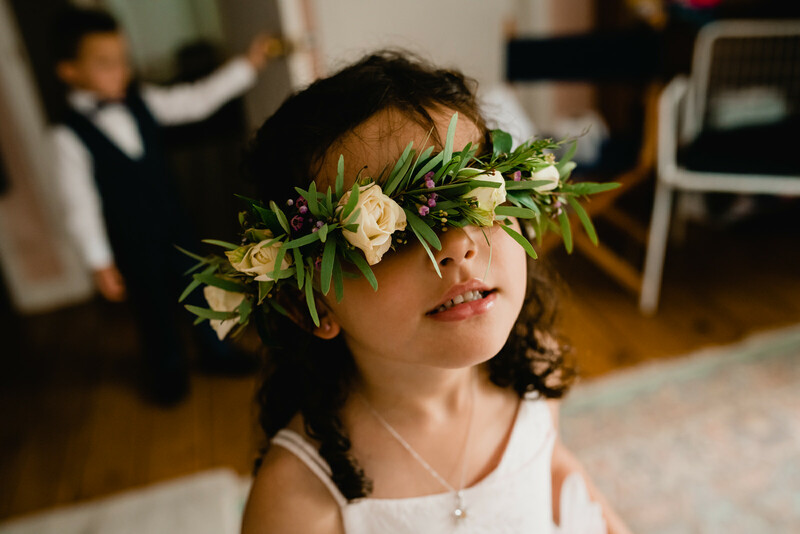 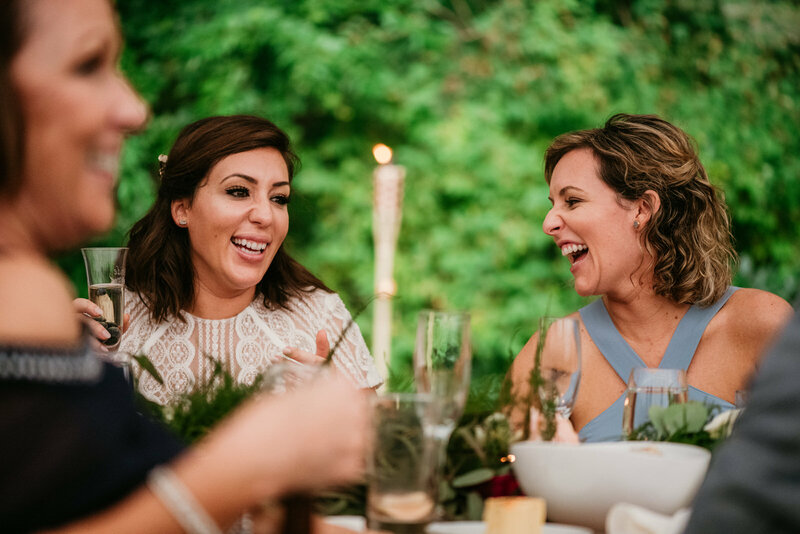 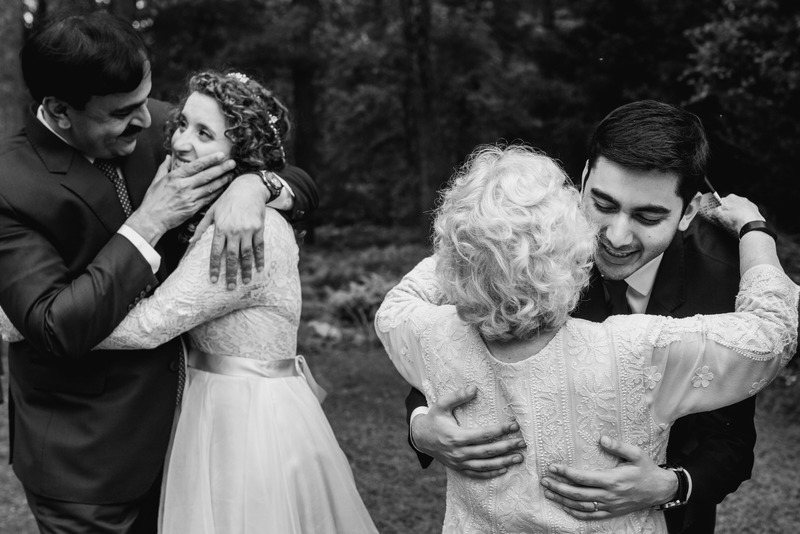 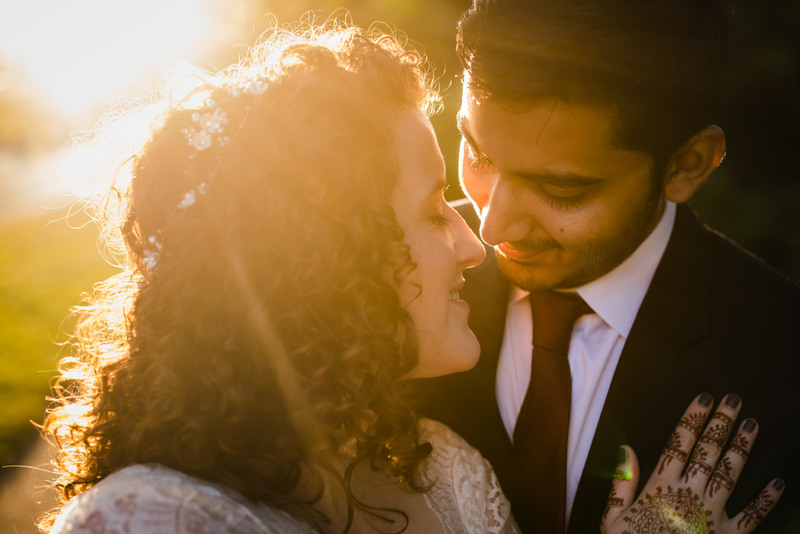 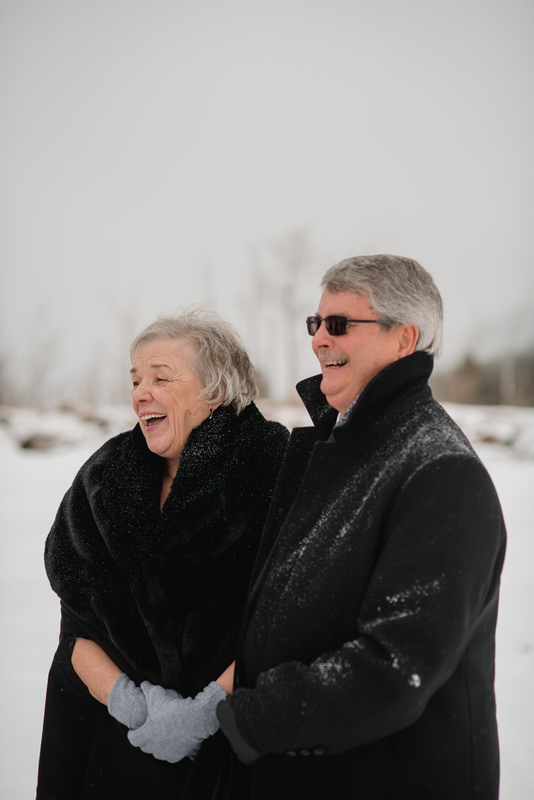 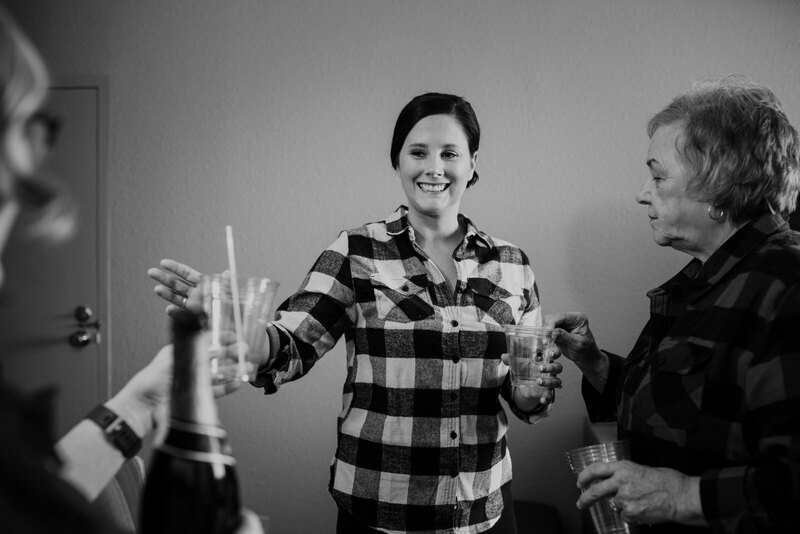 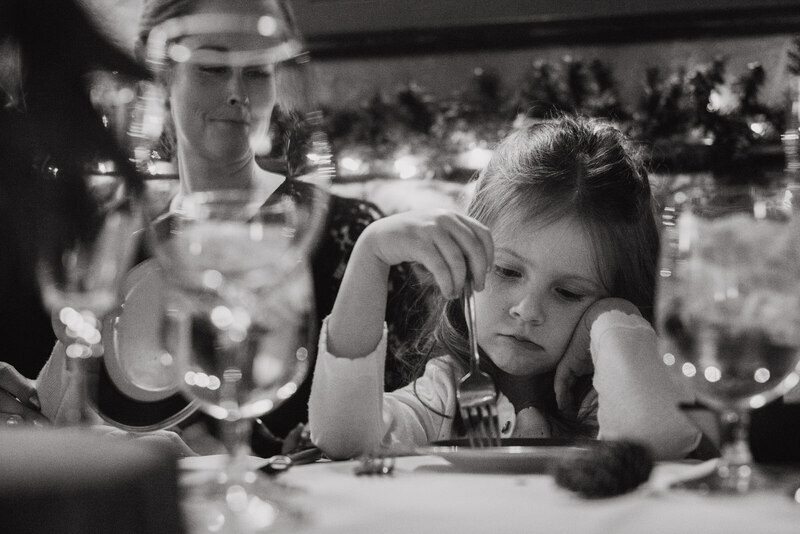 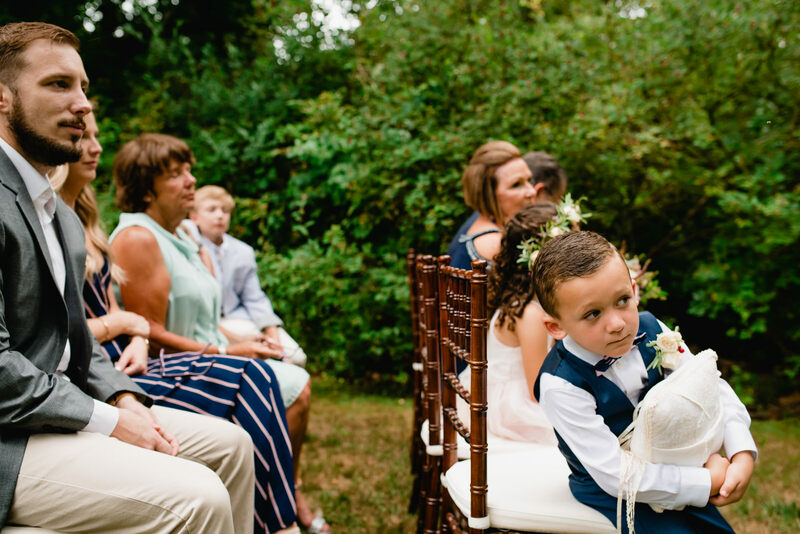 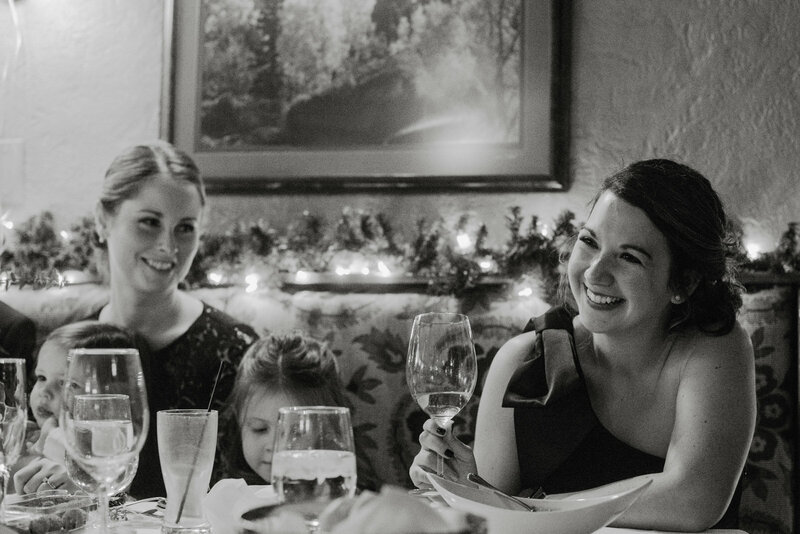 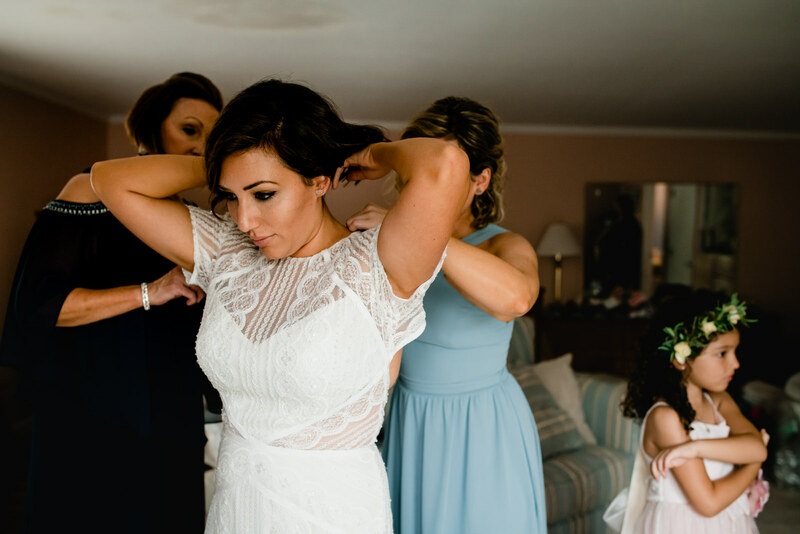 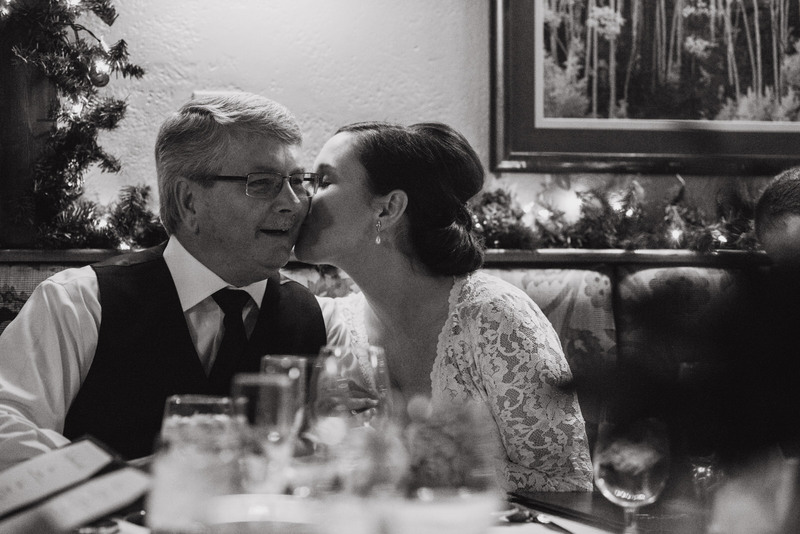 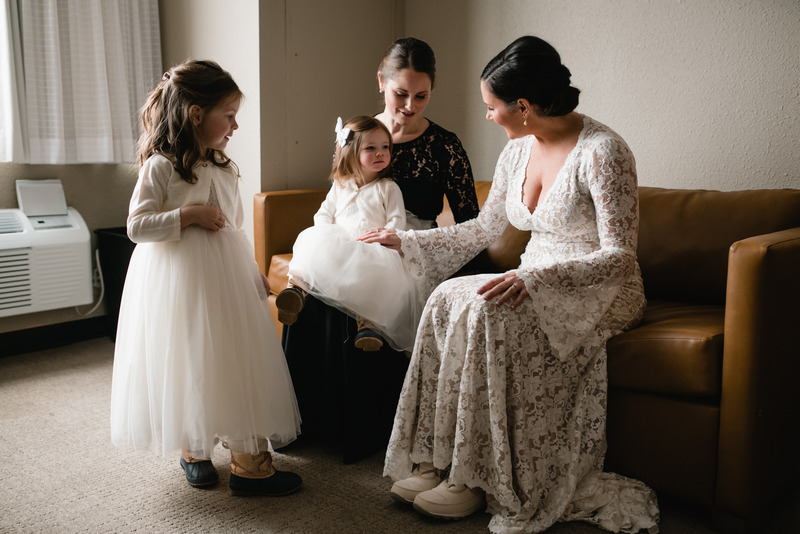 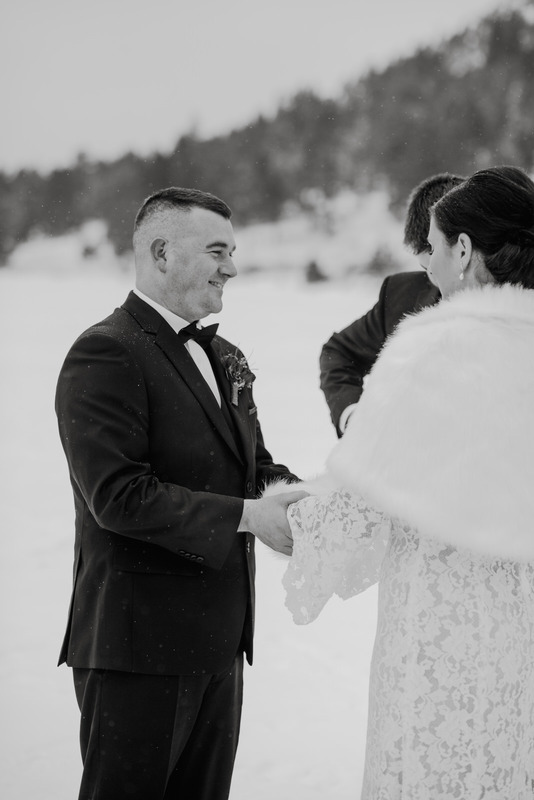 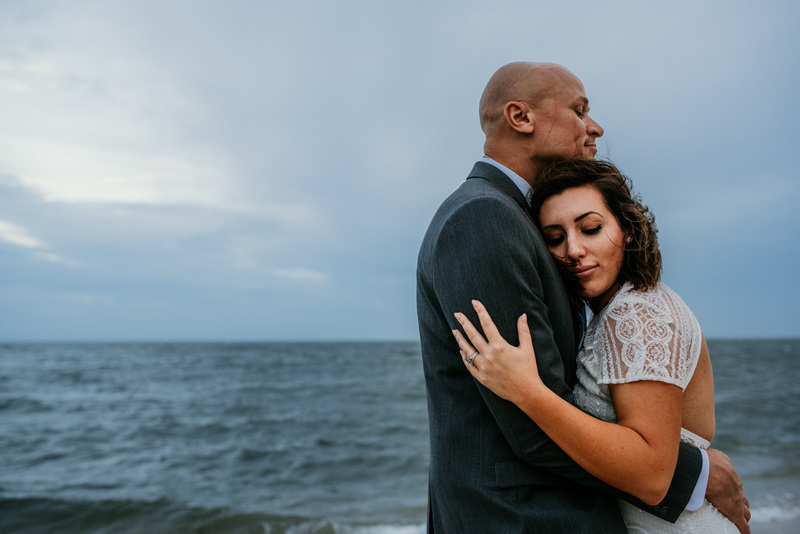 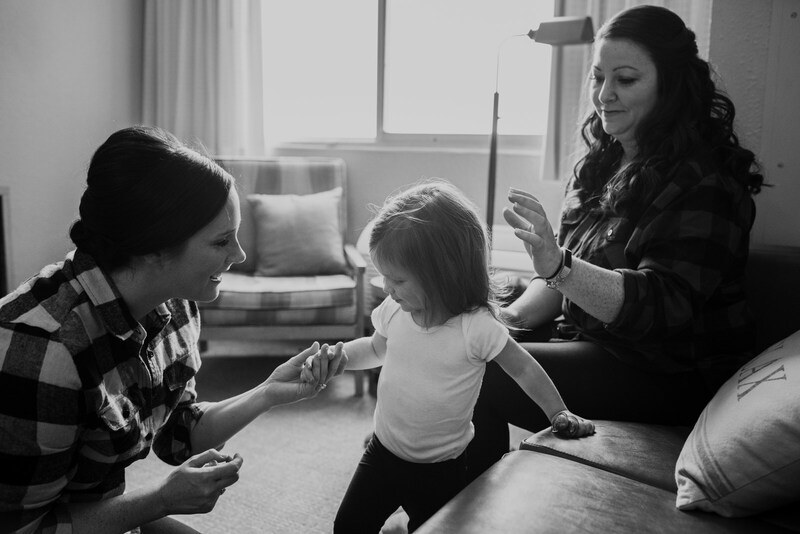 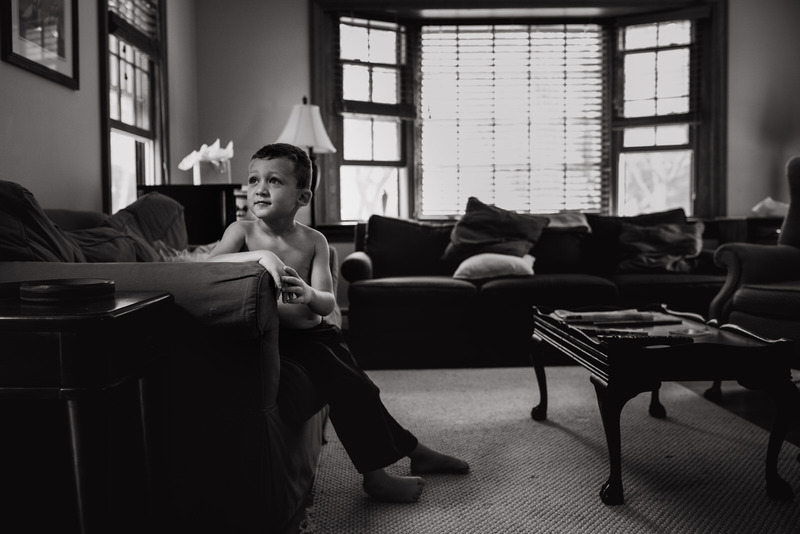 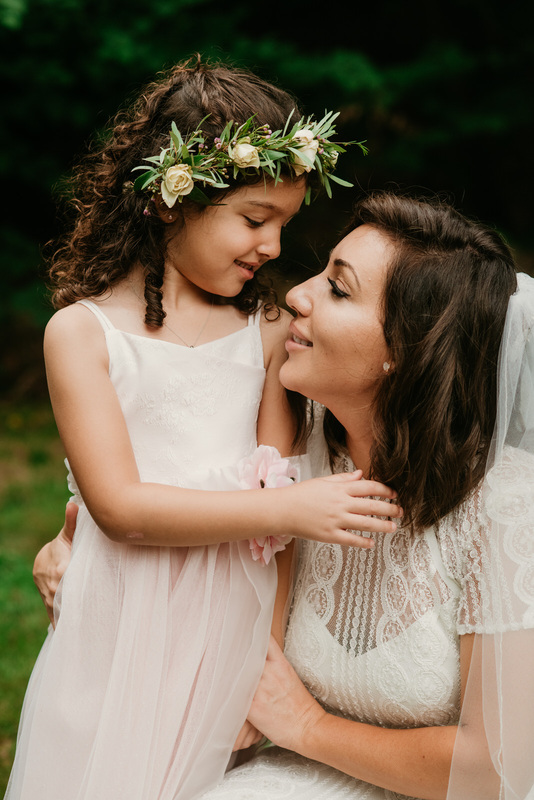 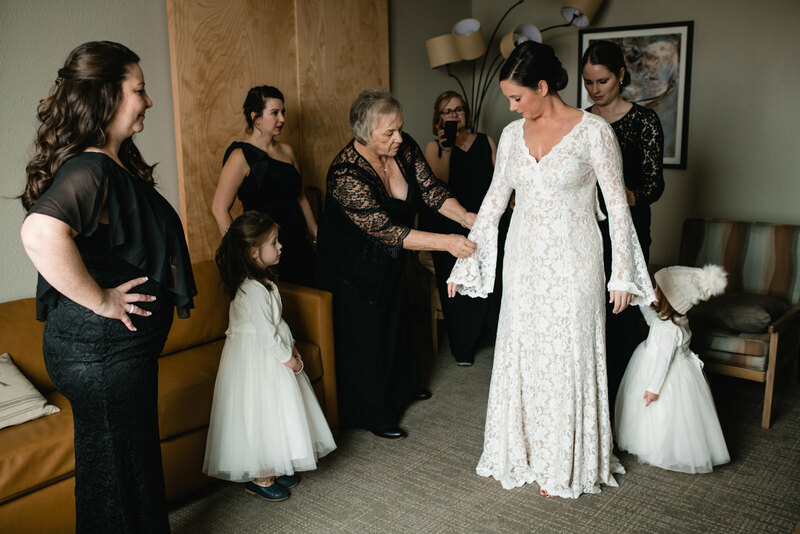 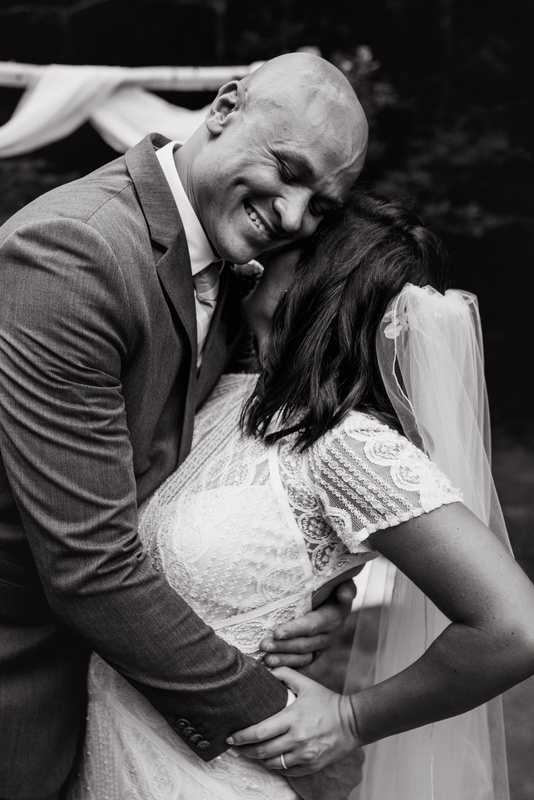 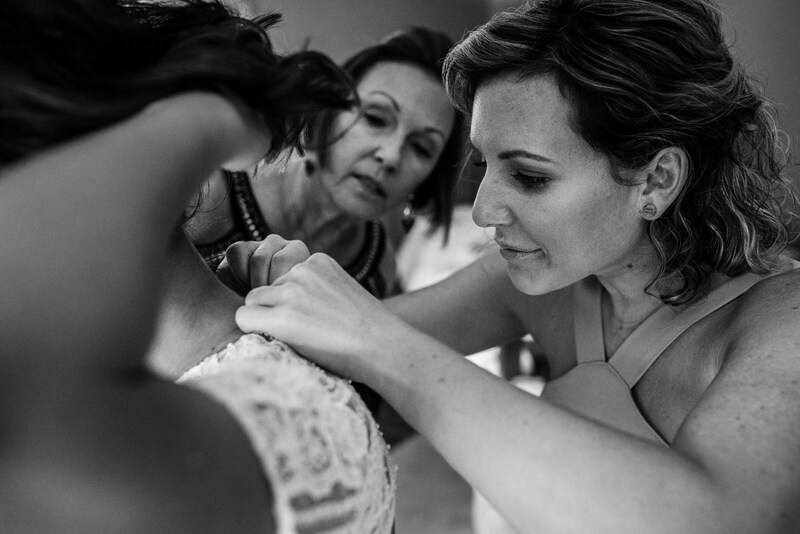 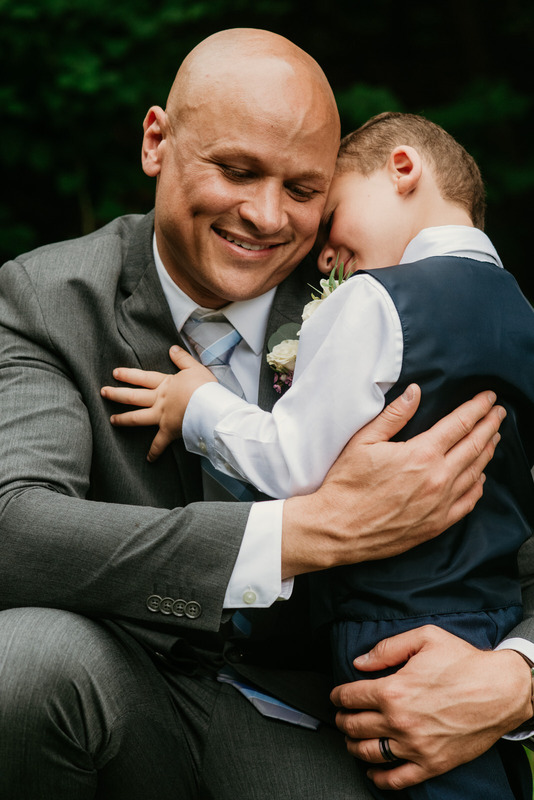 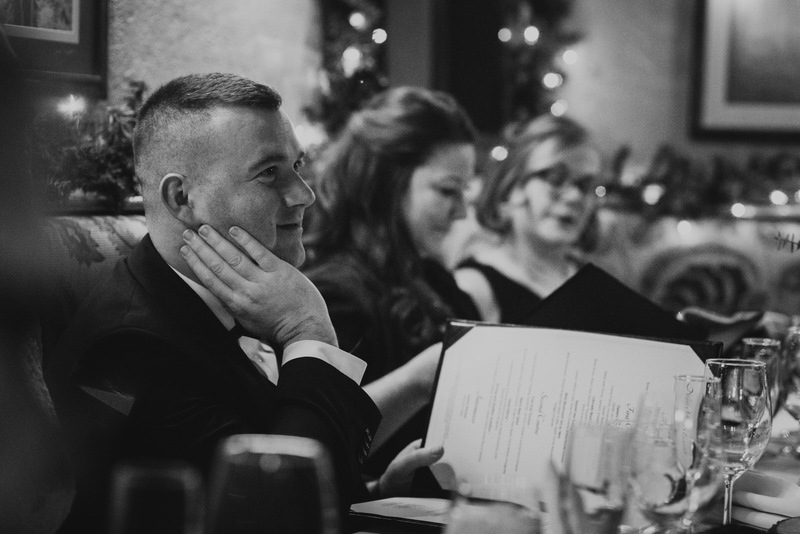 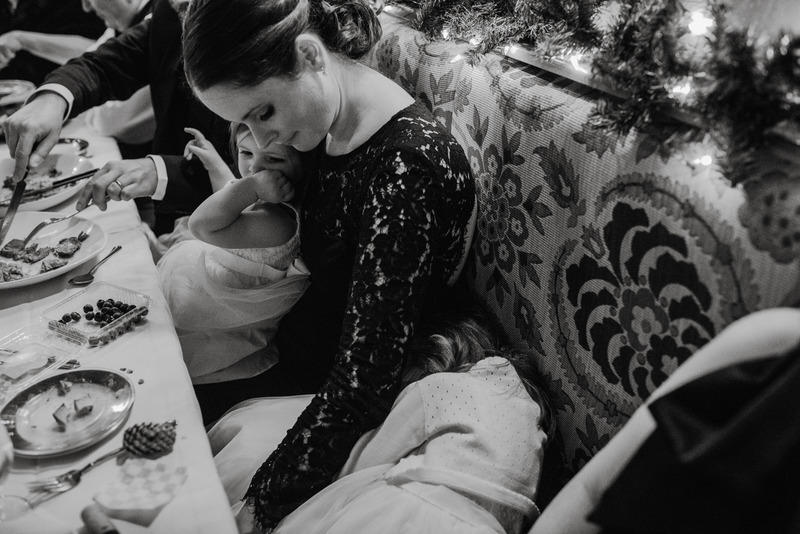 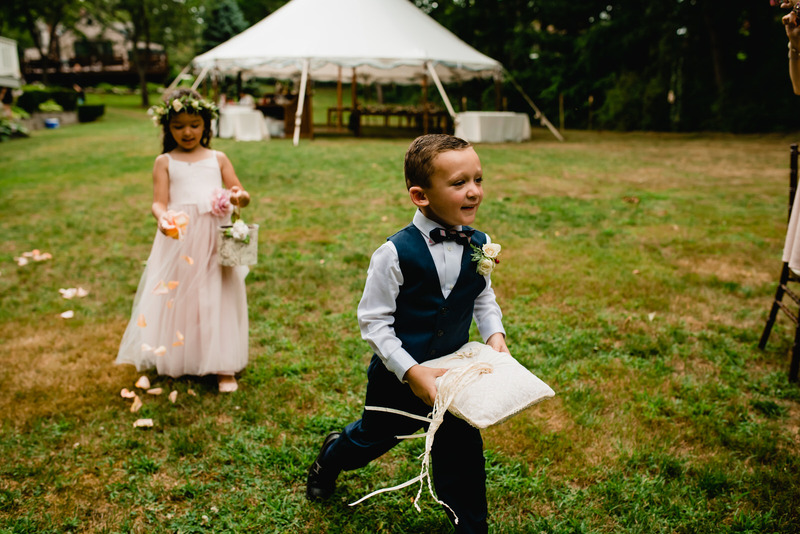 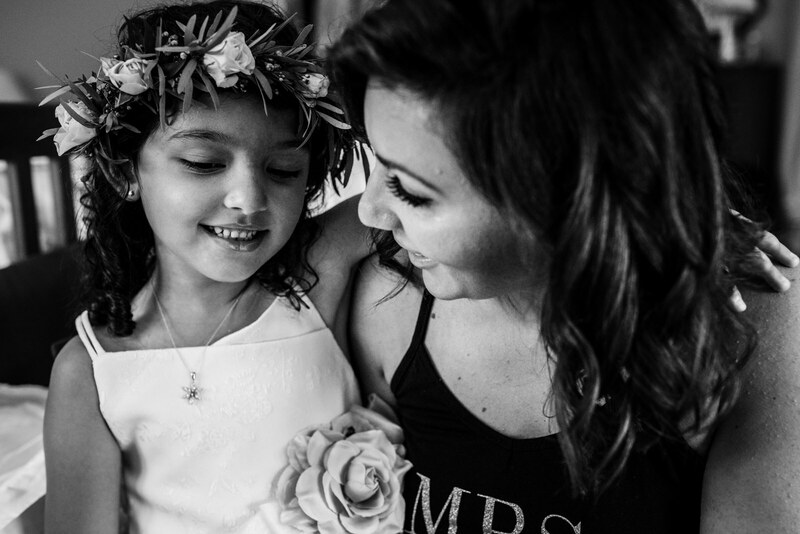 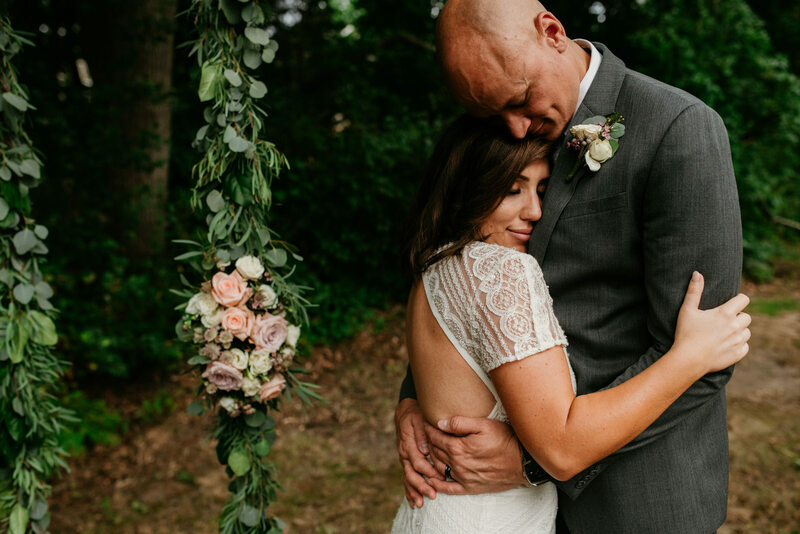 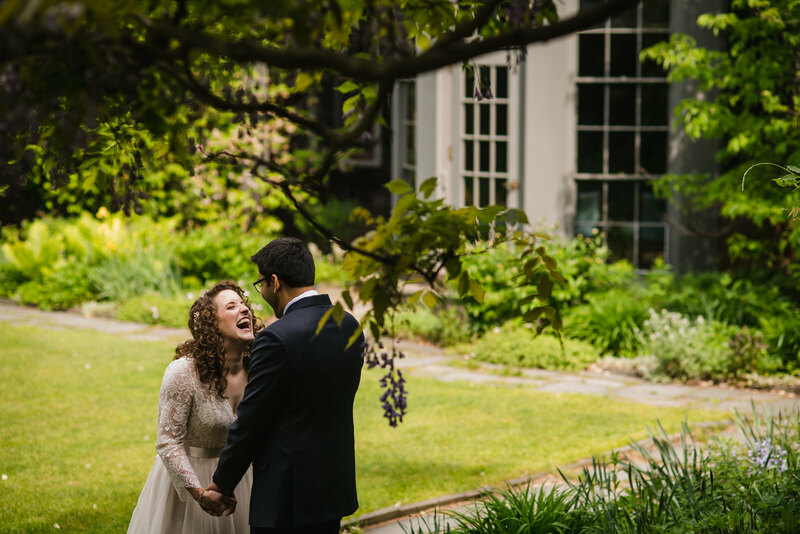 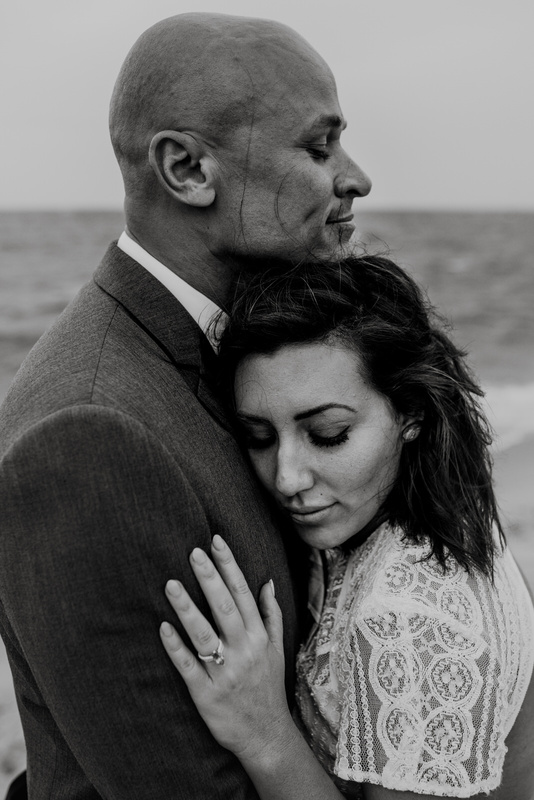 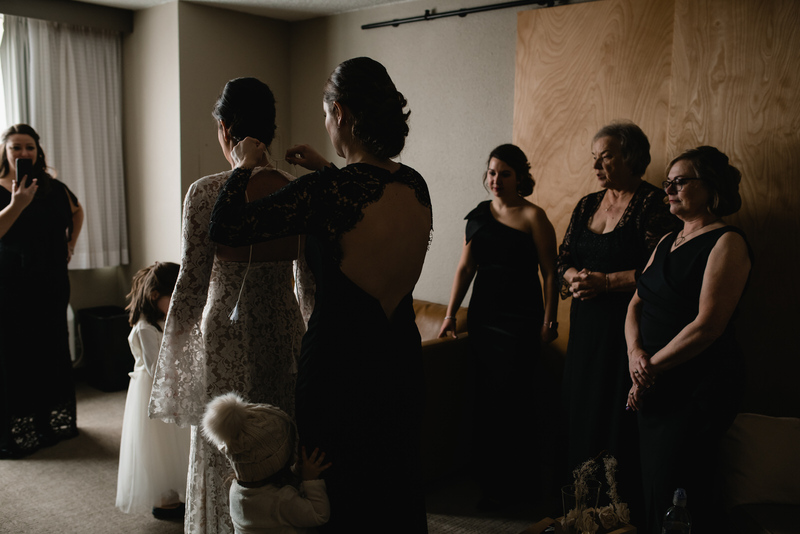 Angie captured the emotions of these candid moments in a really genuine way that resonates with us and with those we share our photographs with. 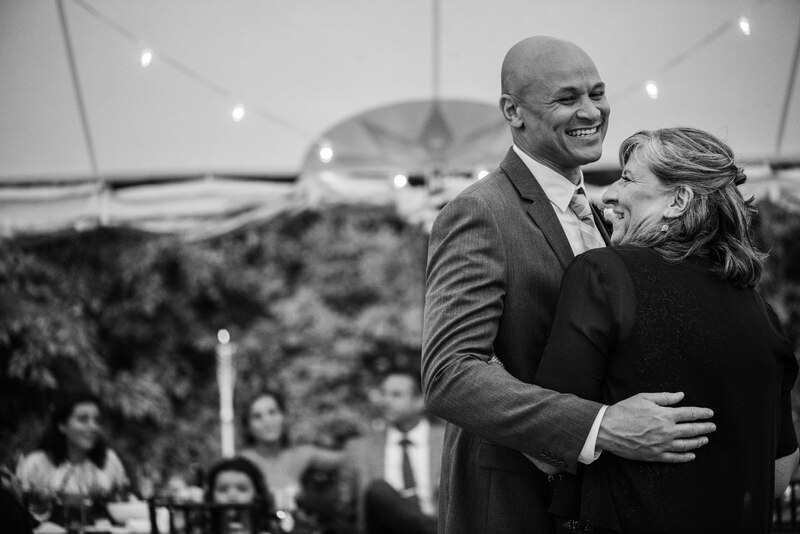 Don’t forget that this day is yours and is a celebration of the love that you share! 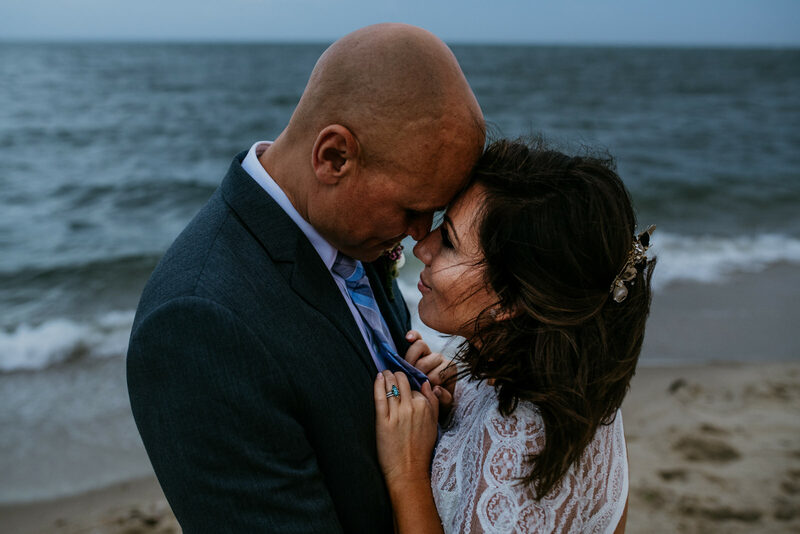 One of life’s greatest mysteries is how, in such a vast world, two people come to meet one another and join together in love. 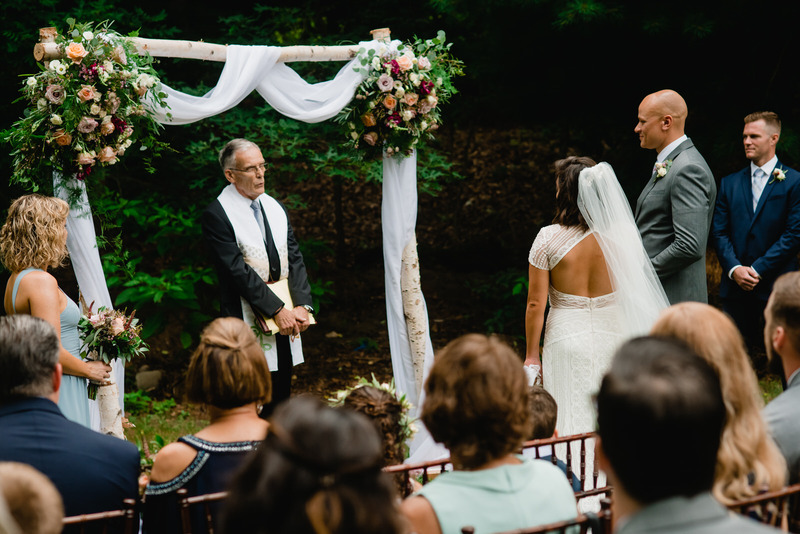 If you’re reading this, then this has happened for you, and your wedding day should be built on whatever represents the beauty of your union. 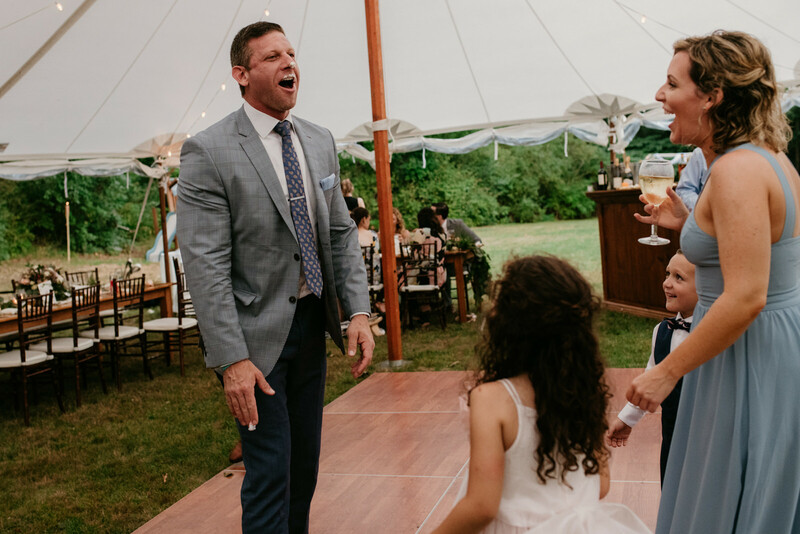 Whether it’s inviting 500 people or eight, doing meditation or breaking glass, wearing white or purple, make decisions that bring you joy, and don’t sweat the small stuff. 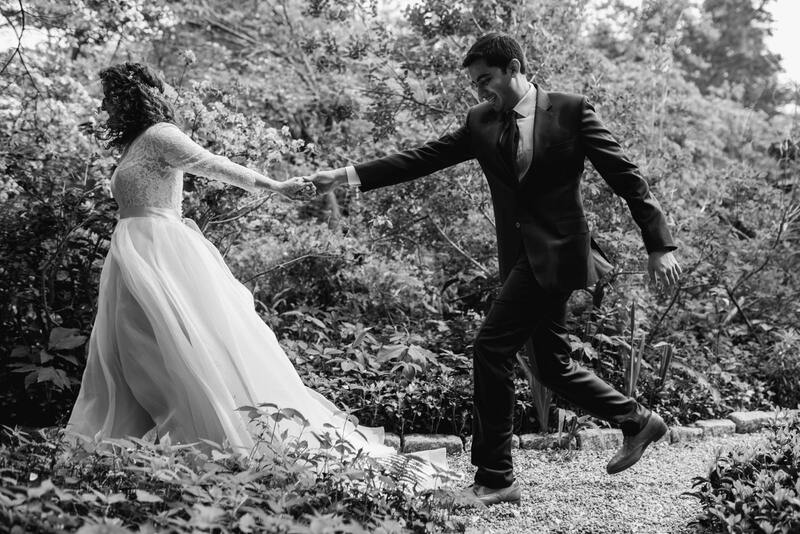 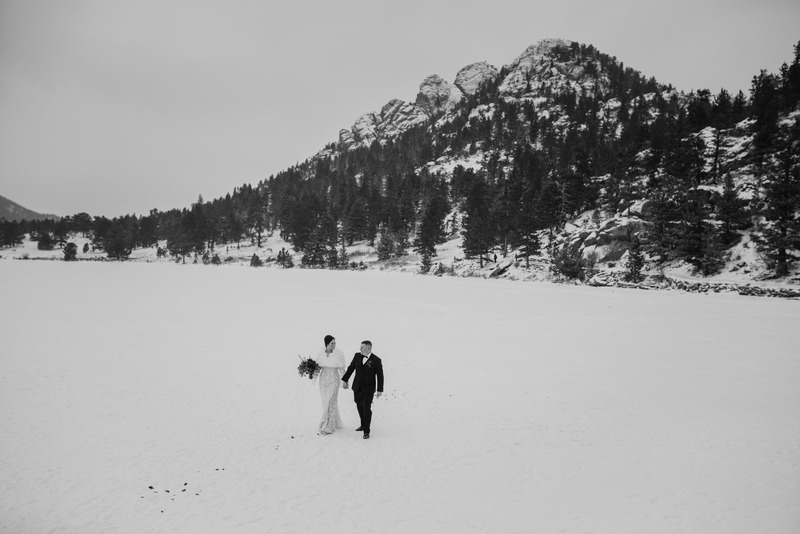 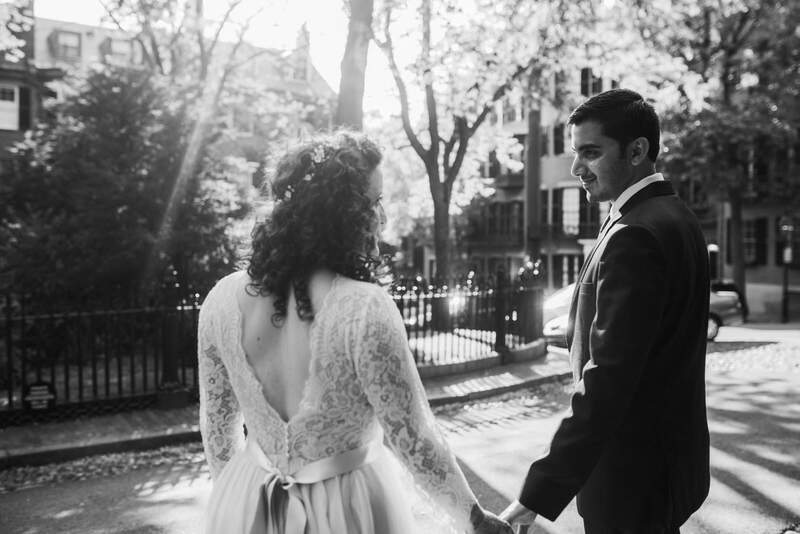 Let your wedding be a continuous exploration and a constant adventure, just as your love is. 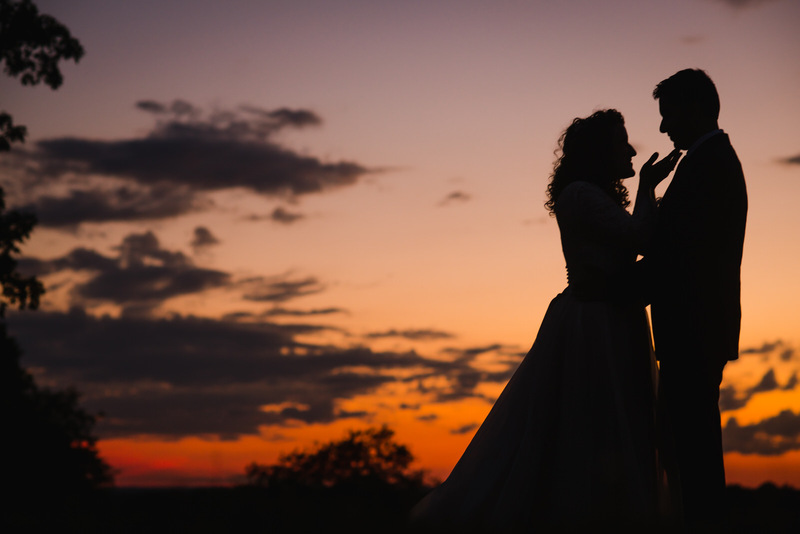 This day should be as precious to you as the day you first fell in love! 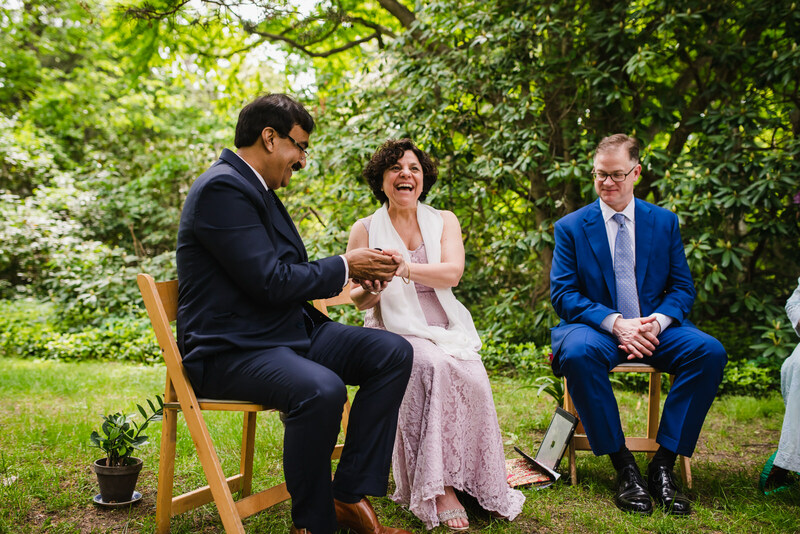 We had always wanted a destination wedding and couldn’t decide on an international or domestic location. 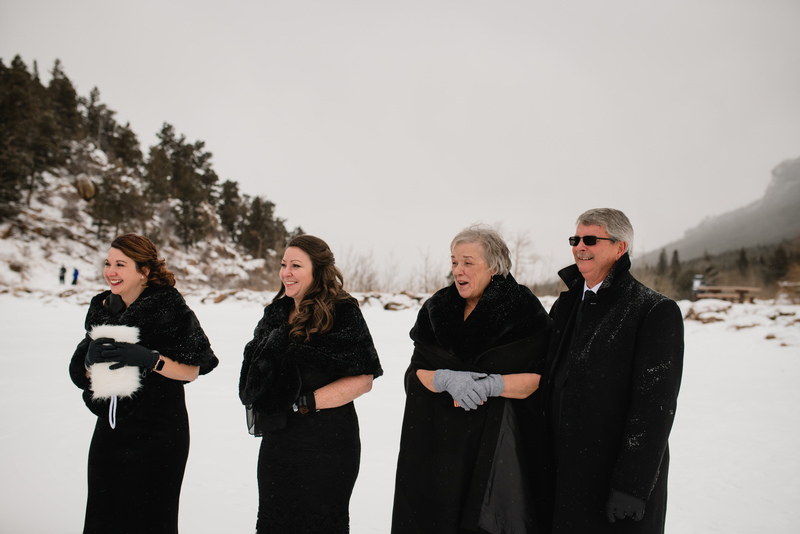 We were also planning for an extended family vacation to the east coast, since the east coast family had been coming out west for the last couple of years and it was our turn to go east. 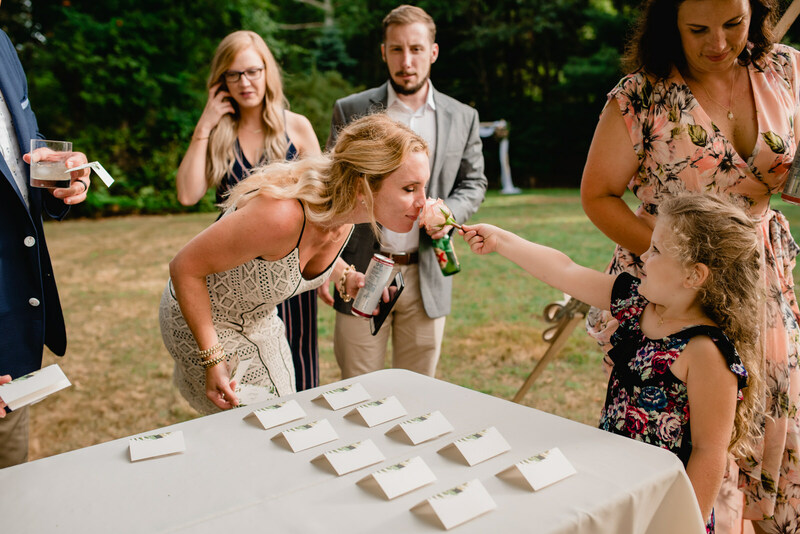 After discussions within the family we decided to combine the two into one event. 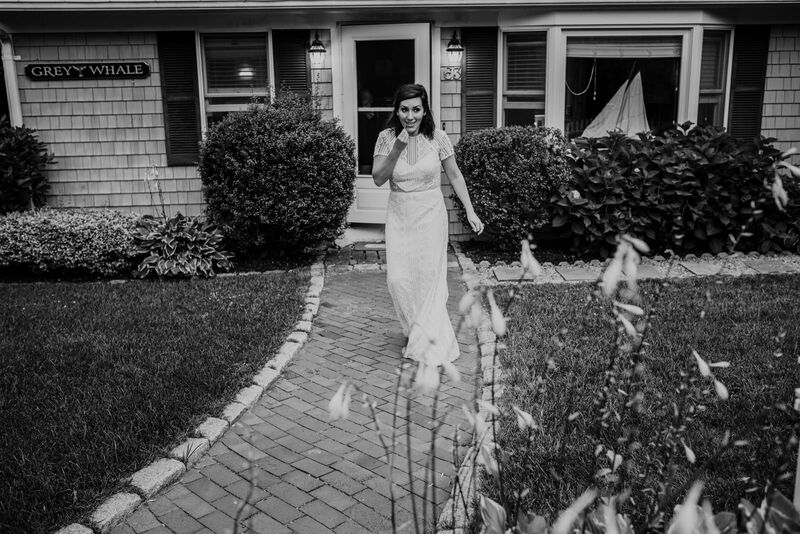 Dana was looking into locations such as Vermont and the Hamptons when her mother suggested Cape Cod. 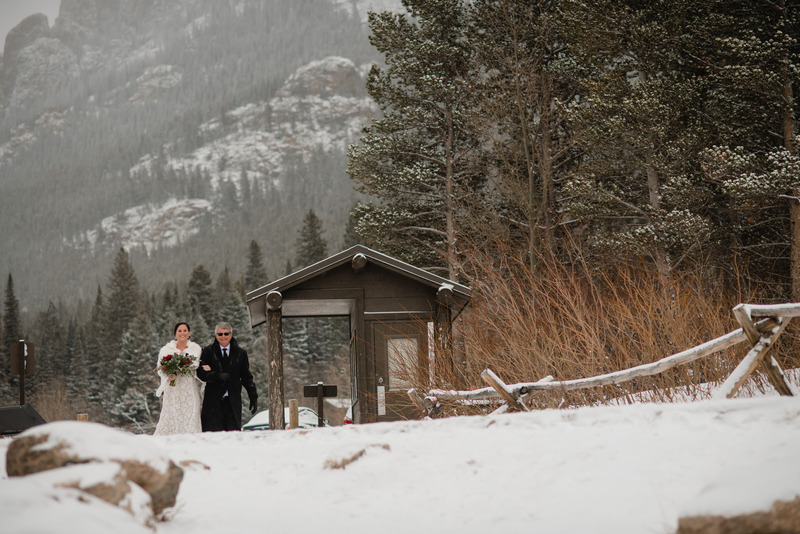 As neither of us had ever been there we both thought it would be a great location. 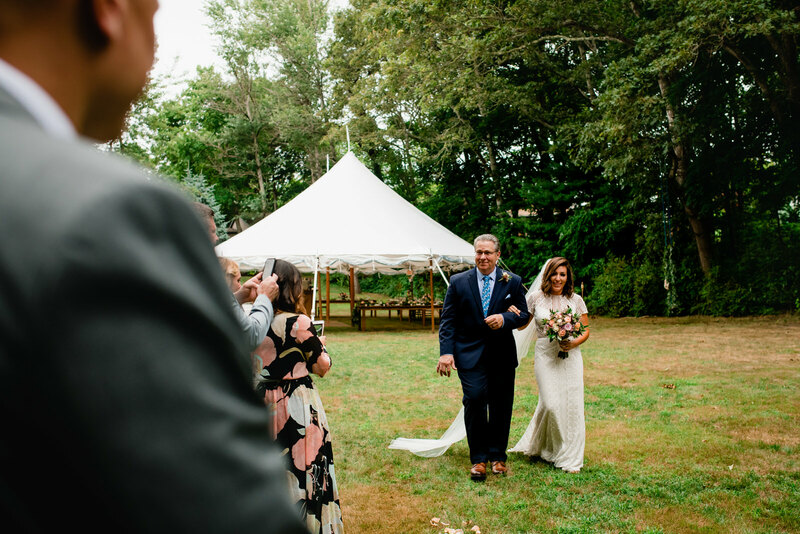 Dana then spent countless hours looking for the perfect home that could host our entire extended family and few friends we were going to invite to the wedding. 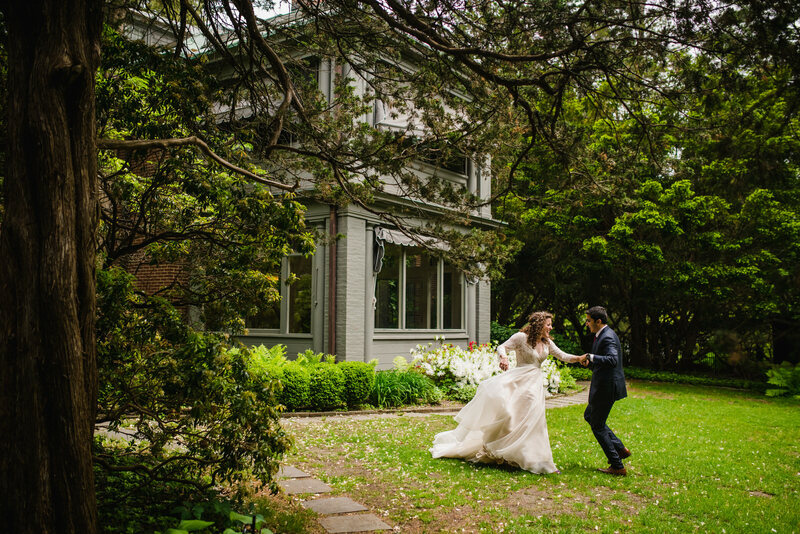 After at least one false start with a home we loved but had questionable ownership she finally found the home that would become our venue. 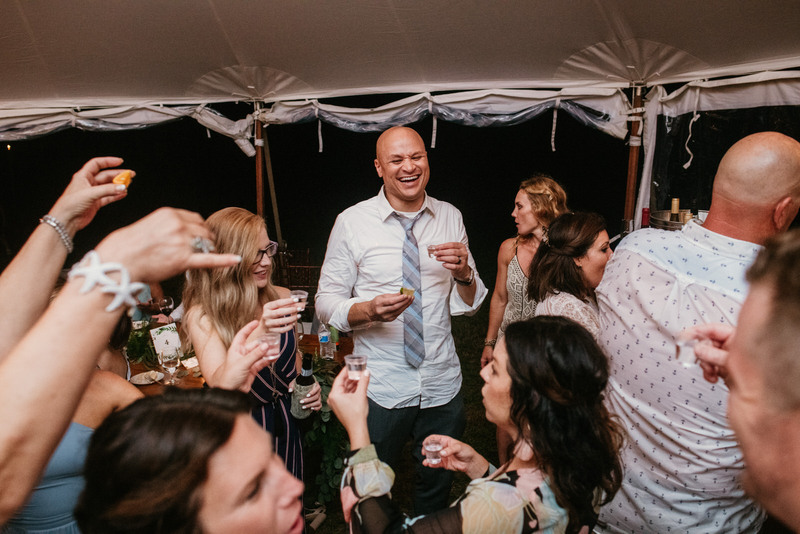 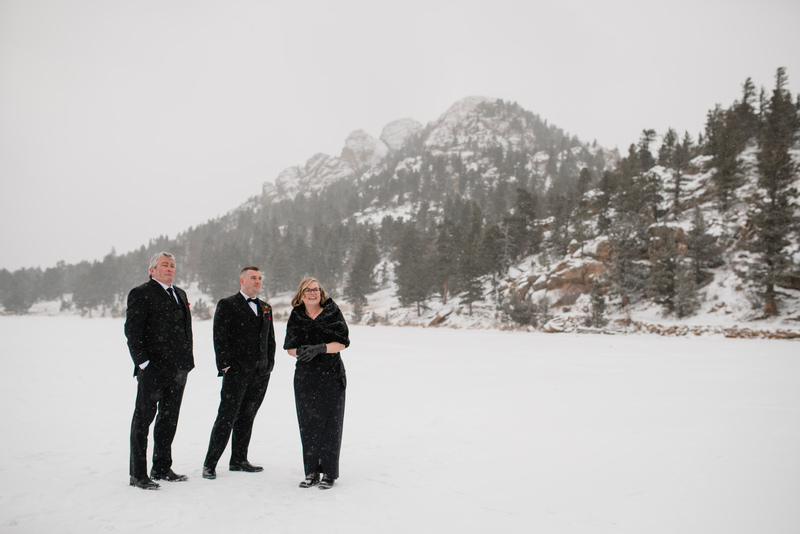 Not only was our event a wedding, but a fun vacation for ourselves and our guests. 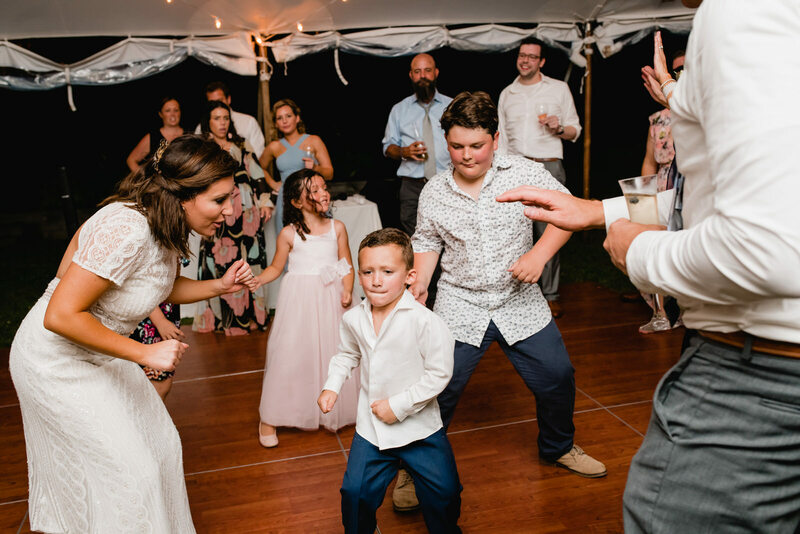 We planned activities and events throughout the week to keep everyone entertained leading up to the wedding and in the days after. 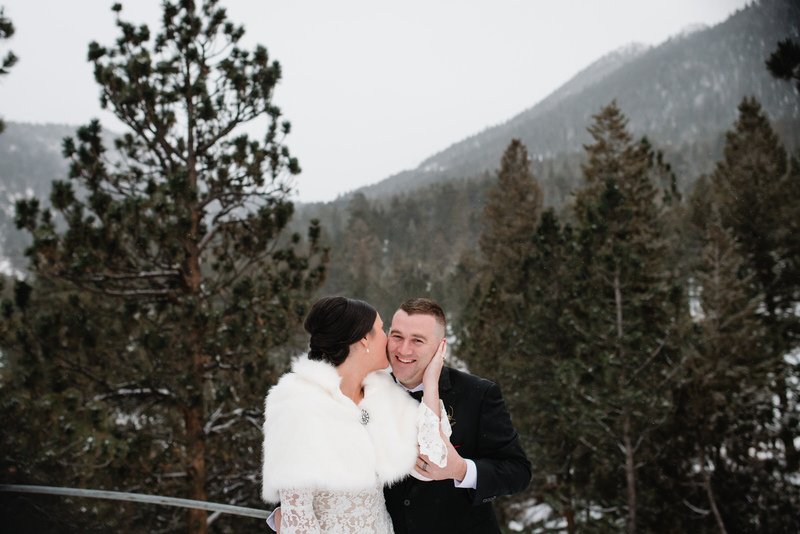 The whole experience was exciting from start to finish. 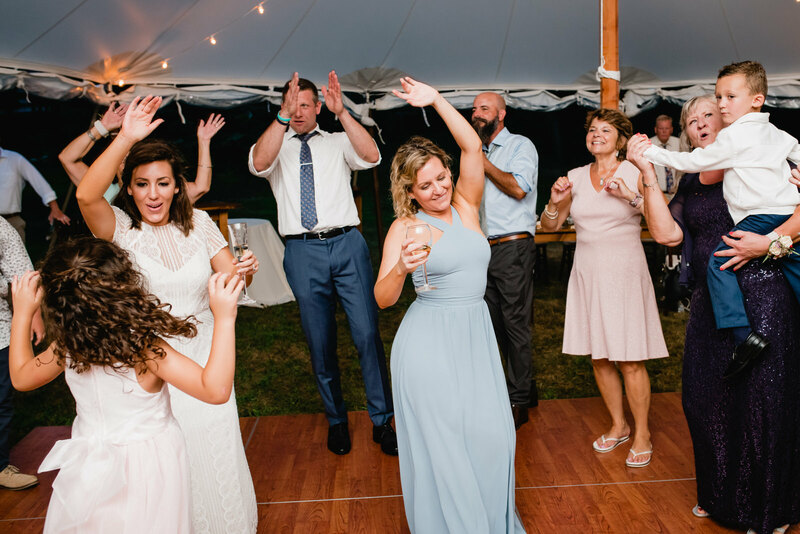 Not only did our guests rave about it being the best wedding they’d ever been to, but also the best vacation they’d had. 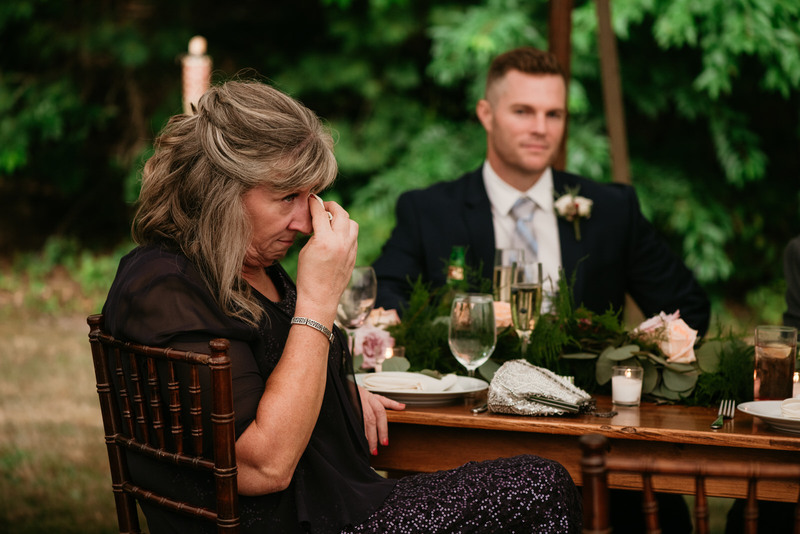 Did anything happen that you weren’t expecting? 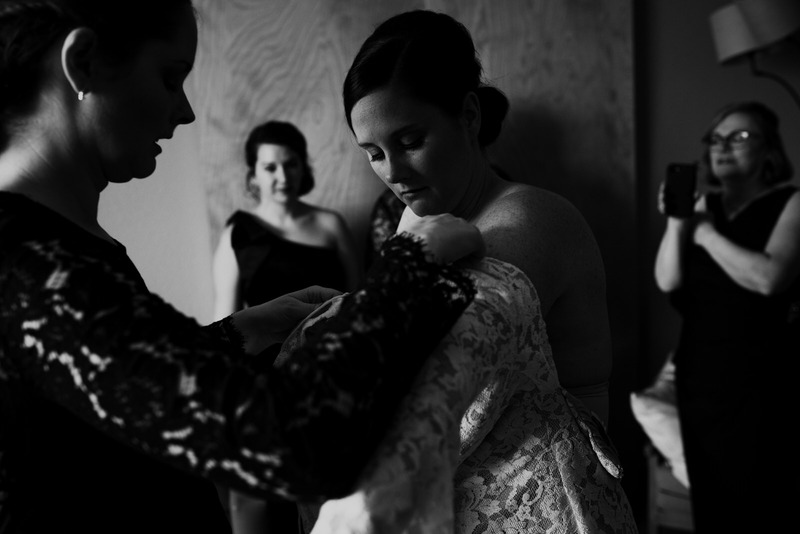 Dana was bracing herself for the inevitable twist and turn that seems to accompany every wedding, but it never came. 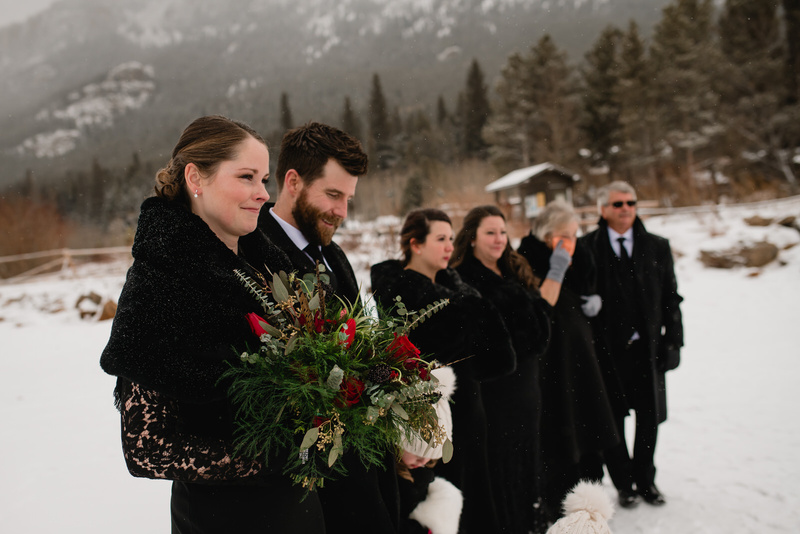 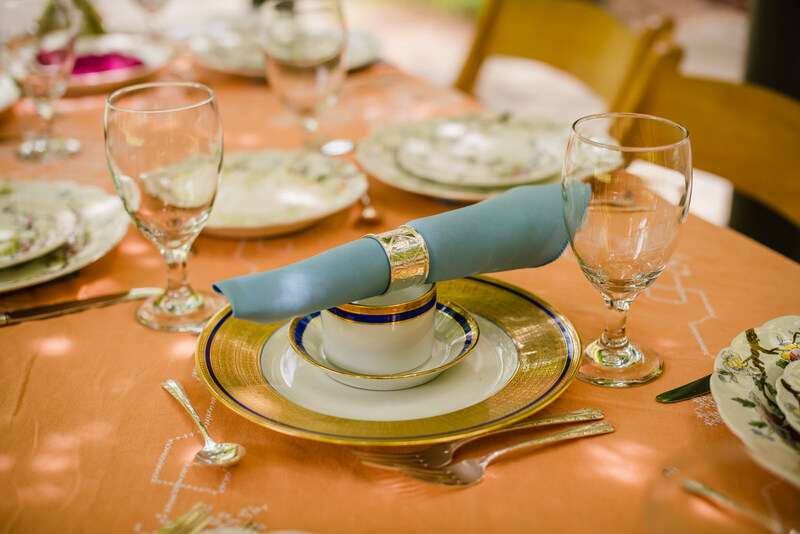 We had an excellent wedding planner and everything was executed flawlessly. 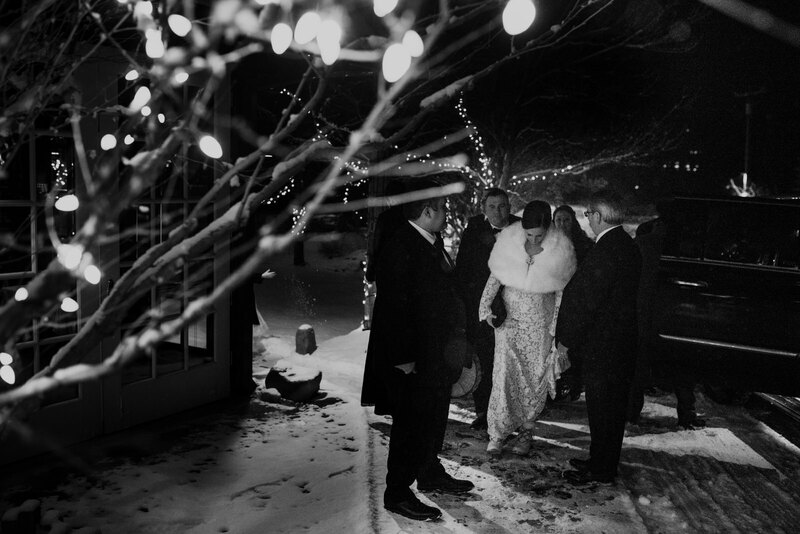 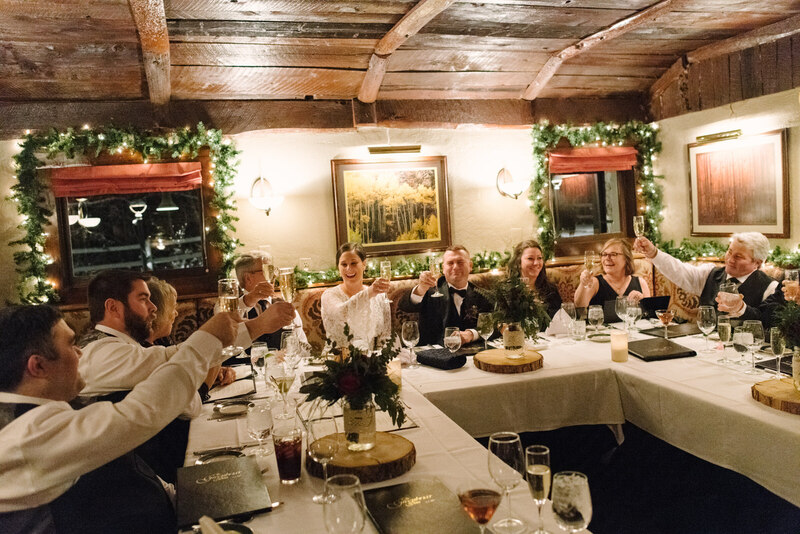 It all culminated in a magical evening, and friends and family celebrating into the night. 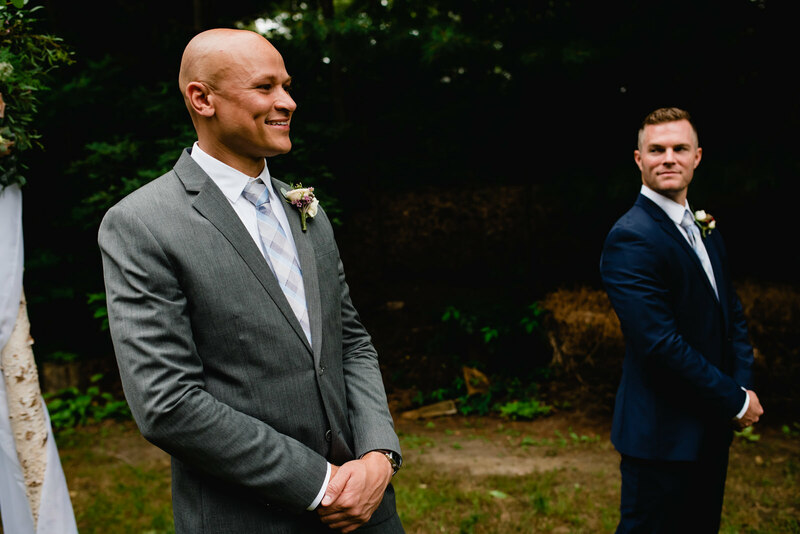 That’s a hard question to answer, since all of our pictures were magnificent. 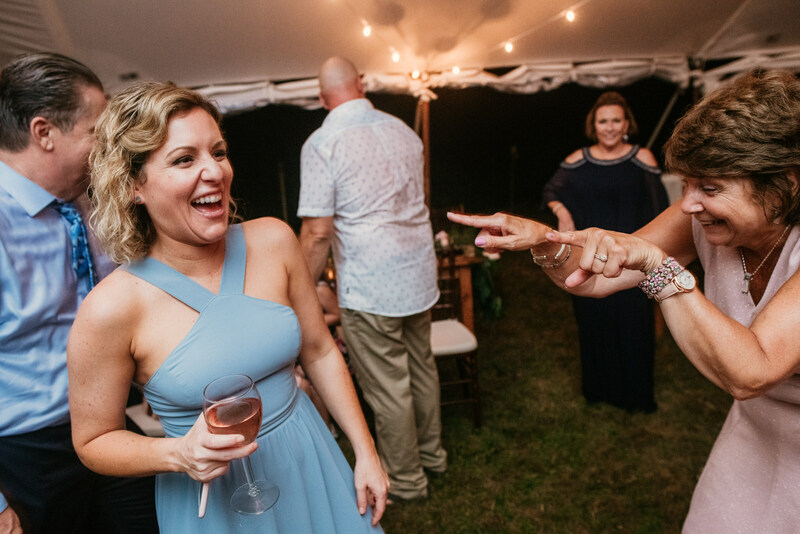 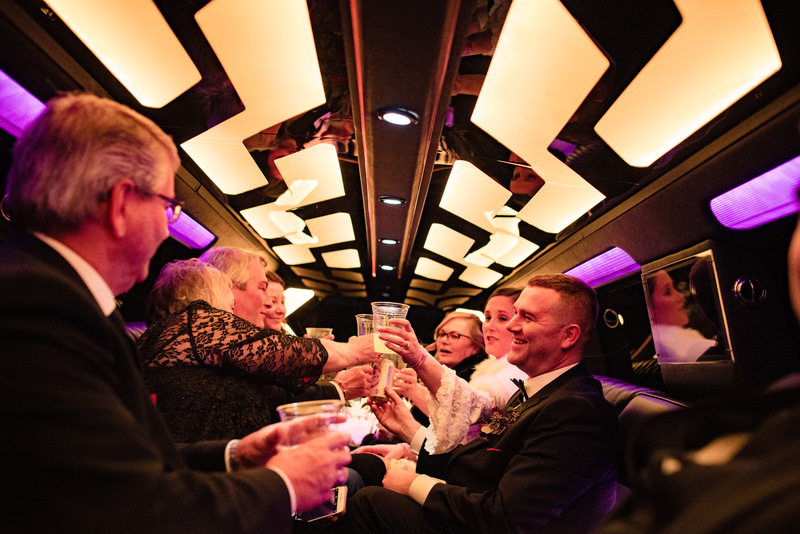 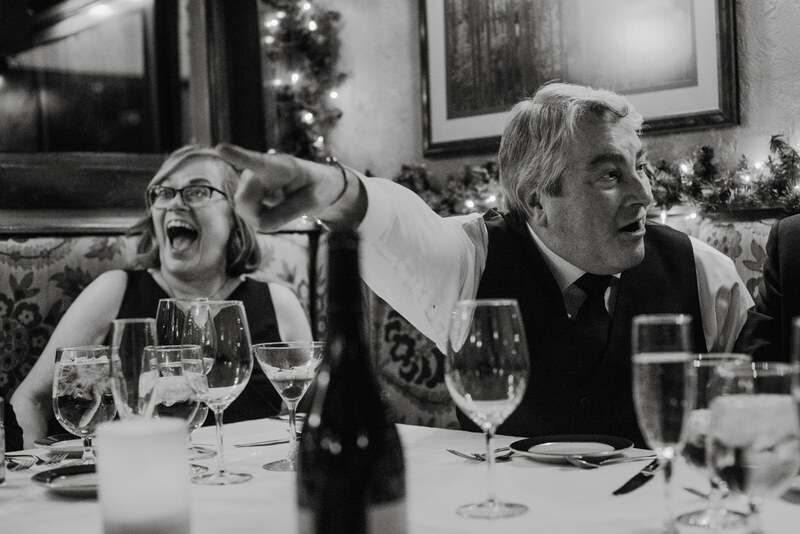 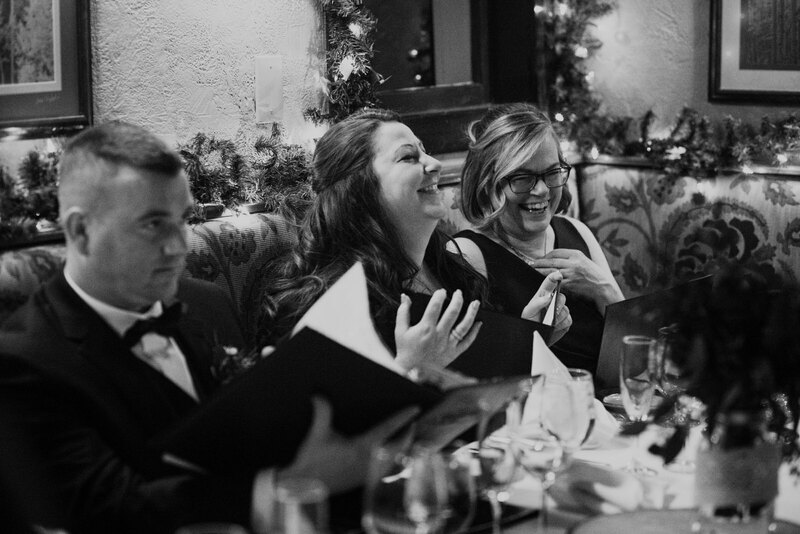 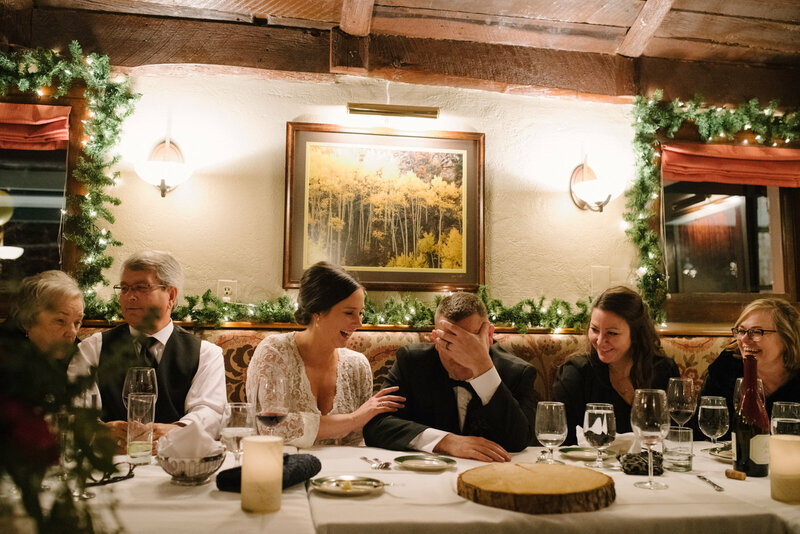 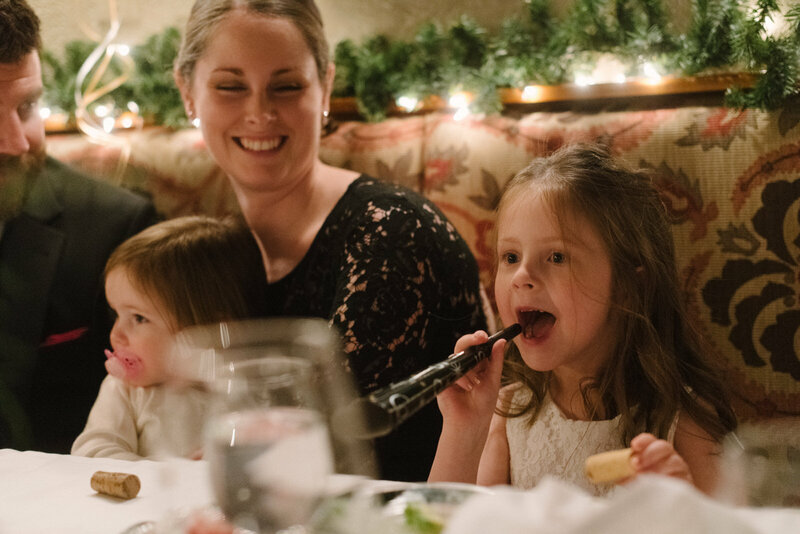 Angie captured completely the essence of our entire evening, from the emotional and intimate moments to the fun of the reception and all the candids an craziness in between. 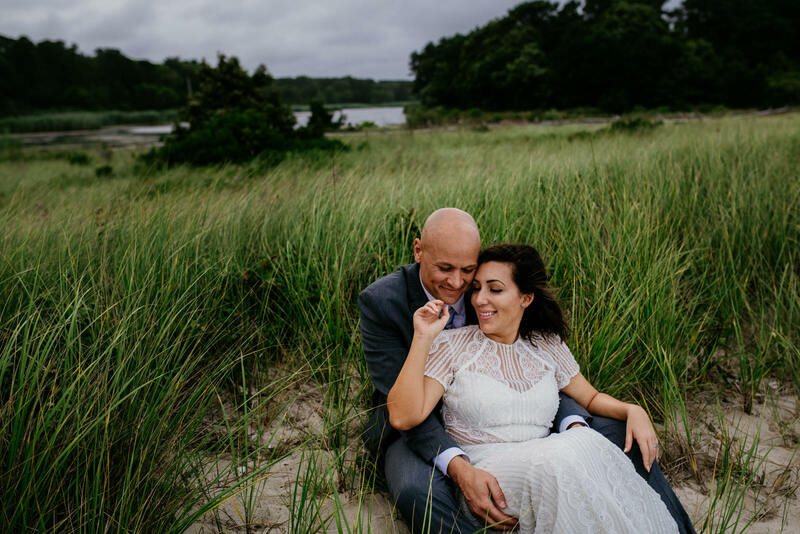 If we had to pick, the intimate one-on-ones on the private beach are definitely some of our favorites. 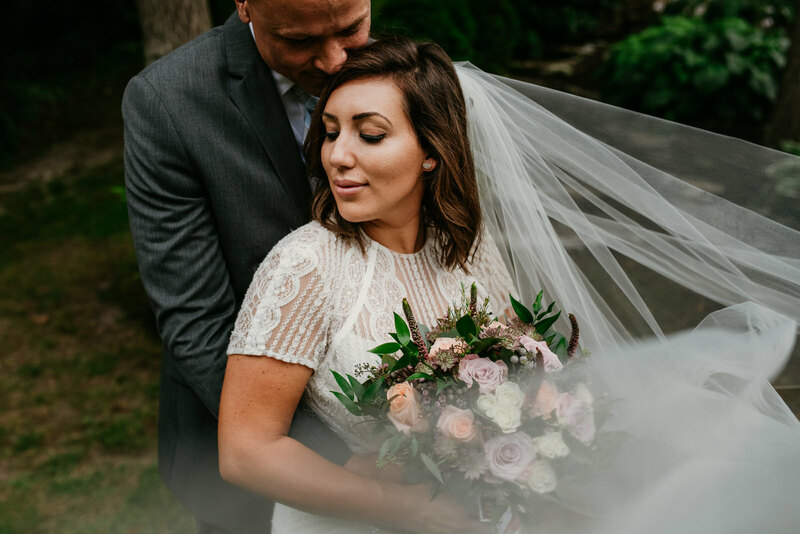 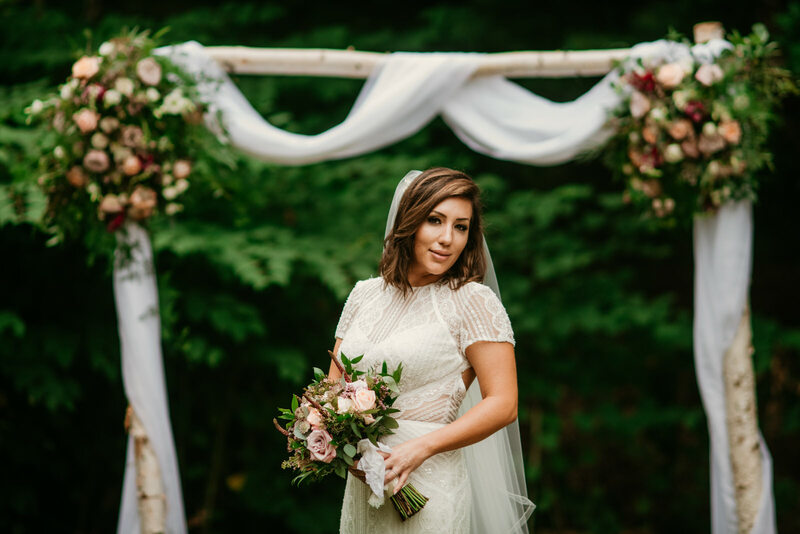 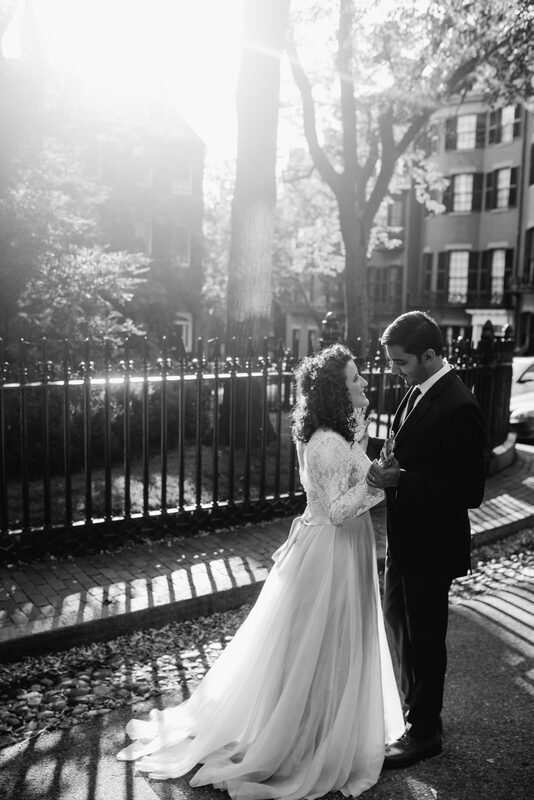 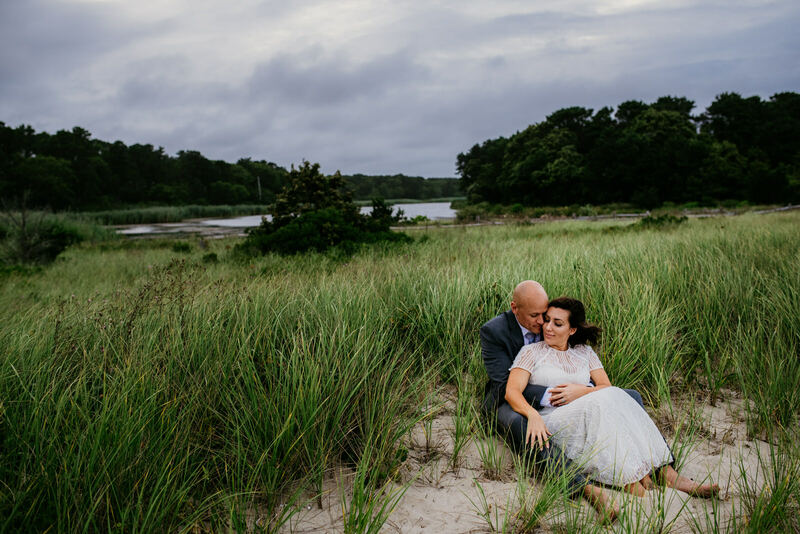 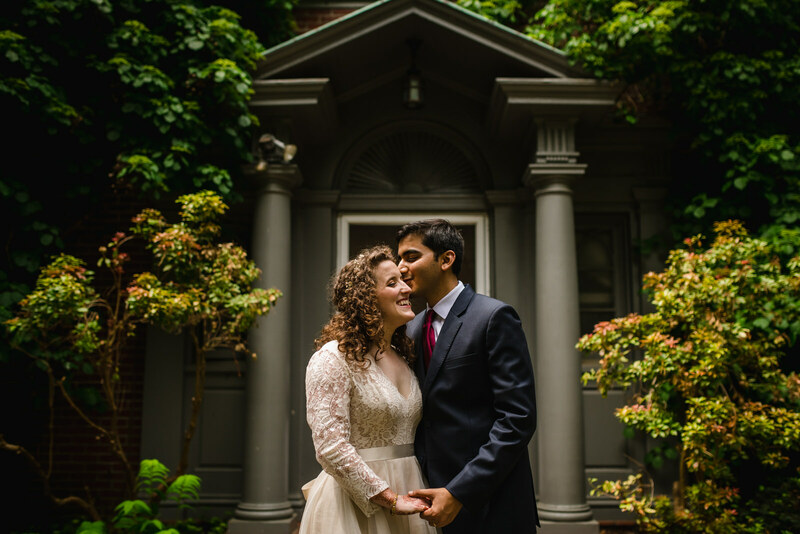 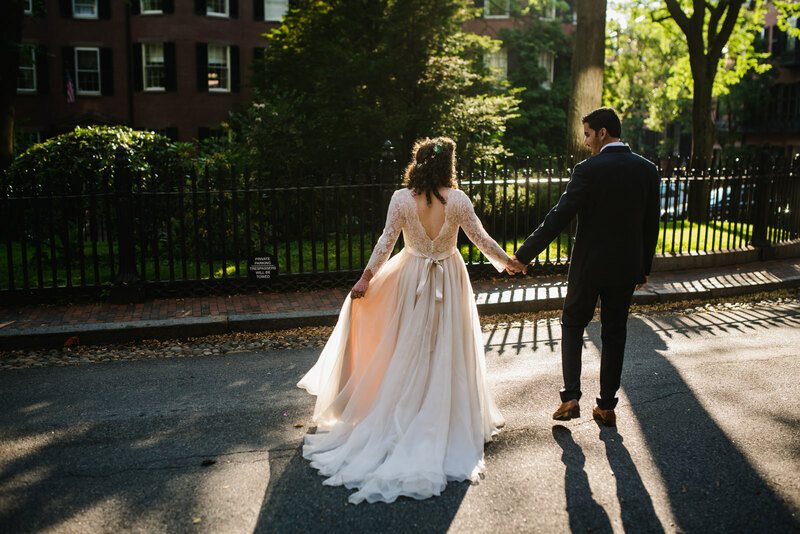 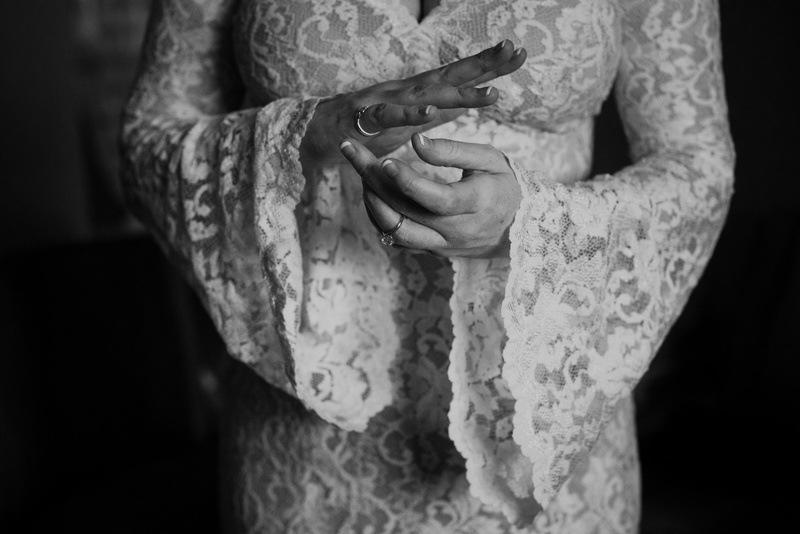 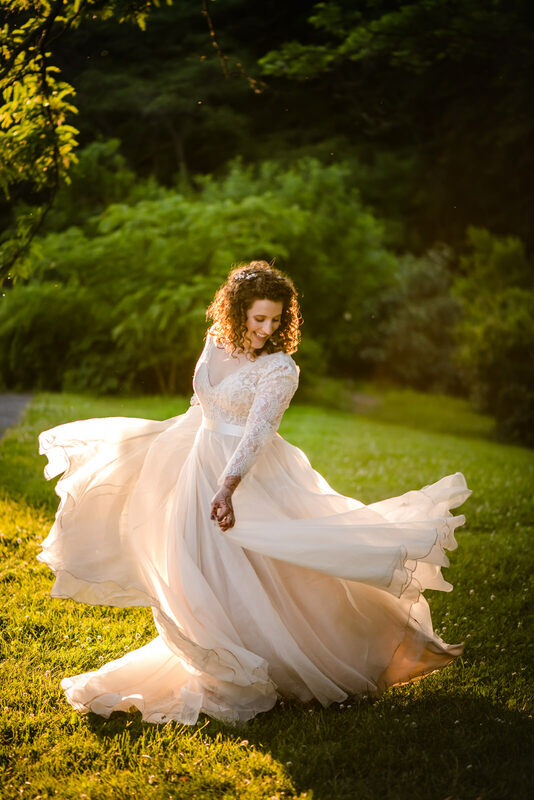 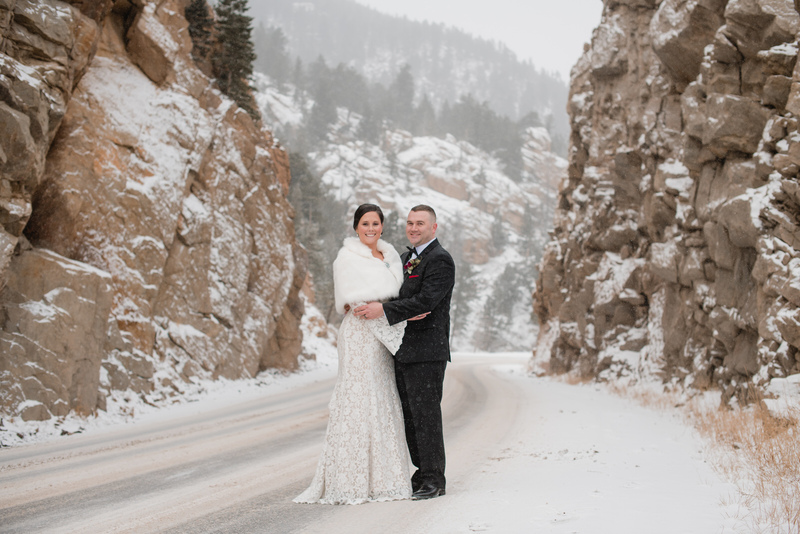 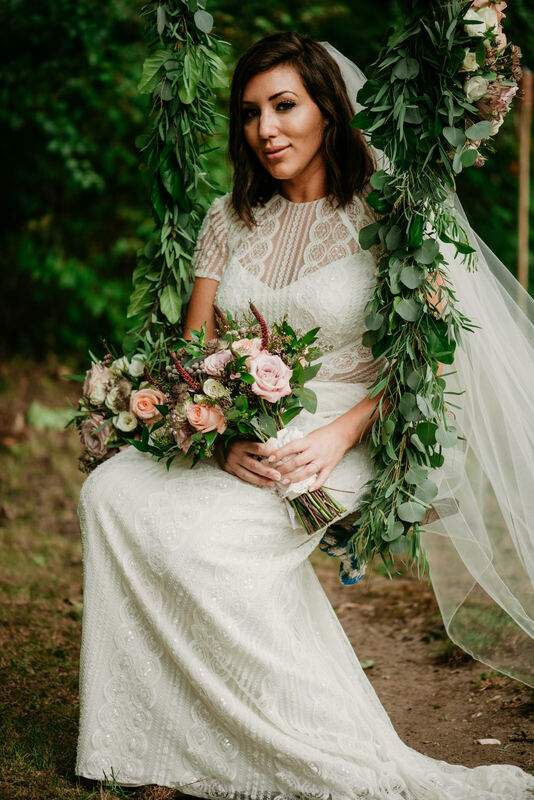 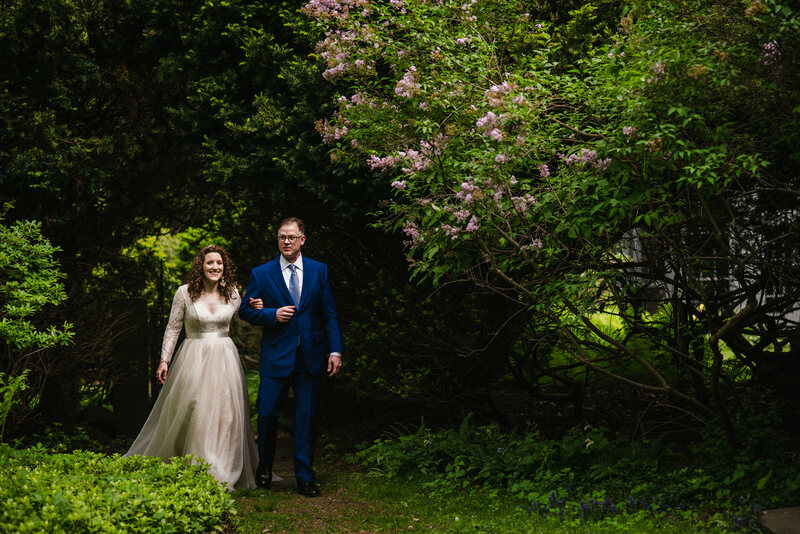 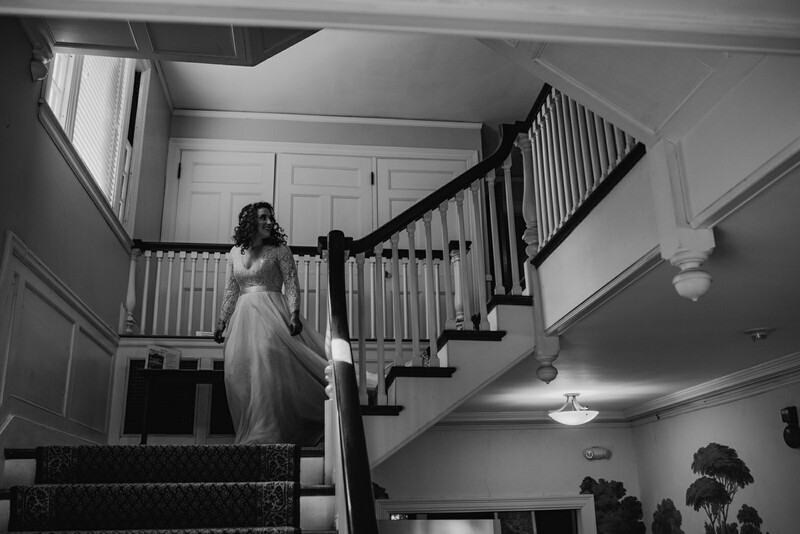 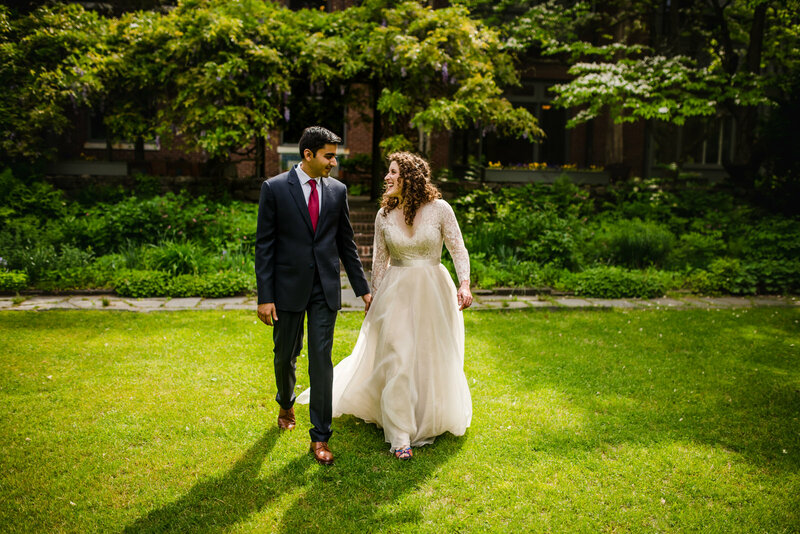 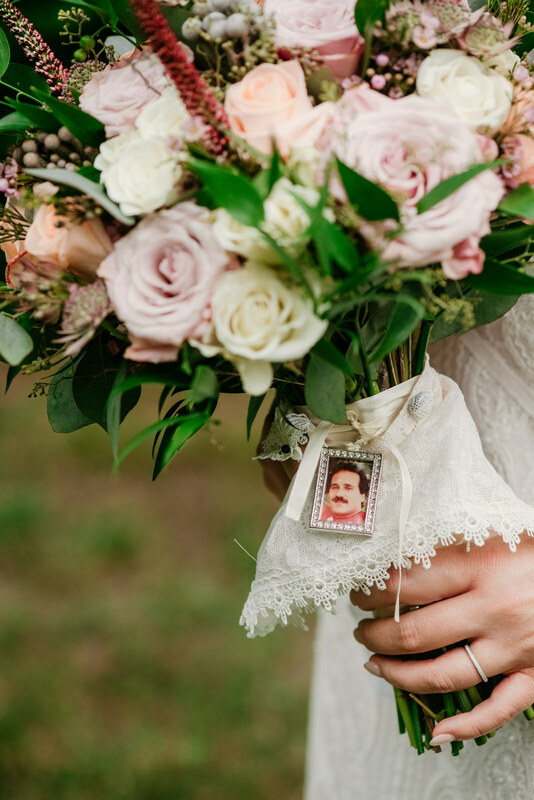 Angie was the perfect photographer for our wedding, since her style matched our desire to capture images that told the story of our wedding from start to finish. 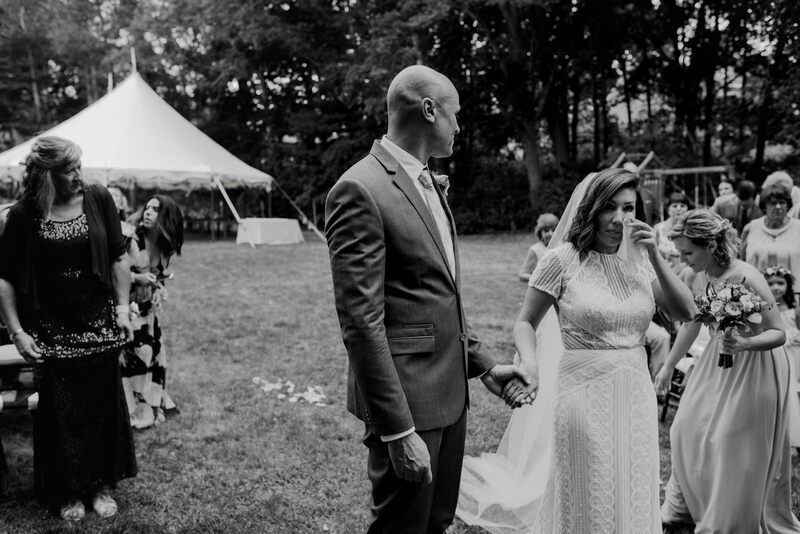 Any advise for couples going through this process or about to go through the process? 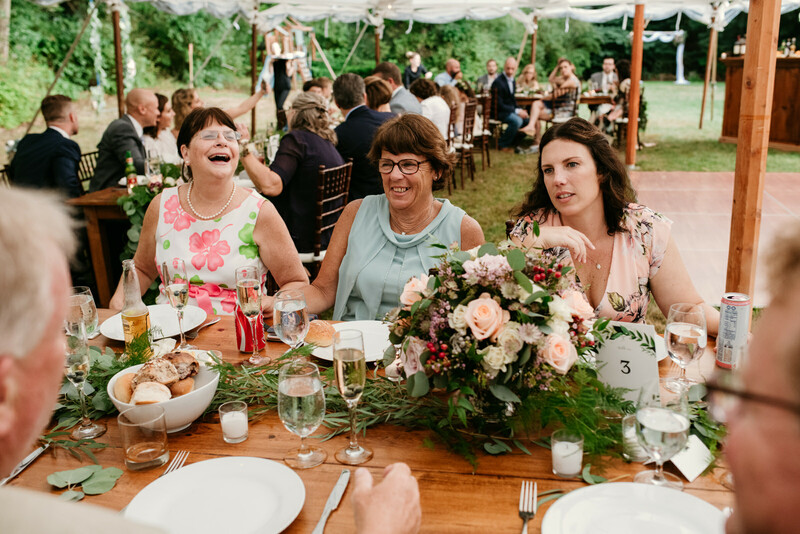 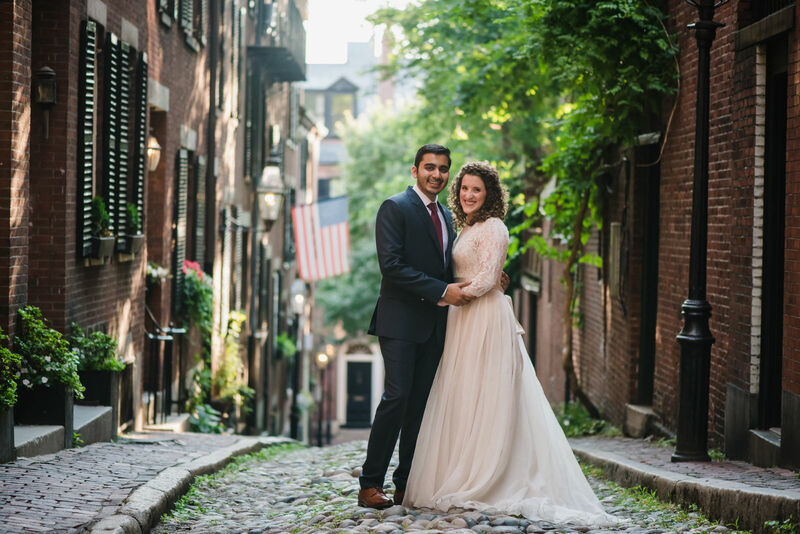 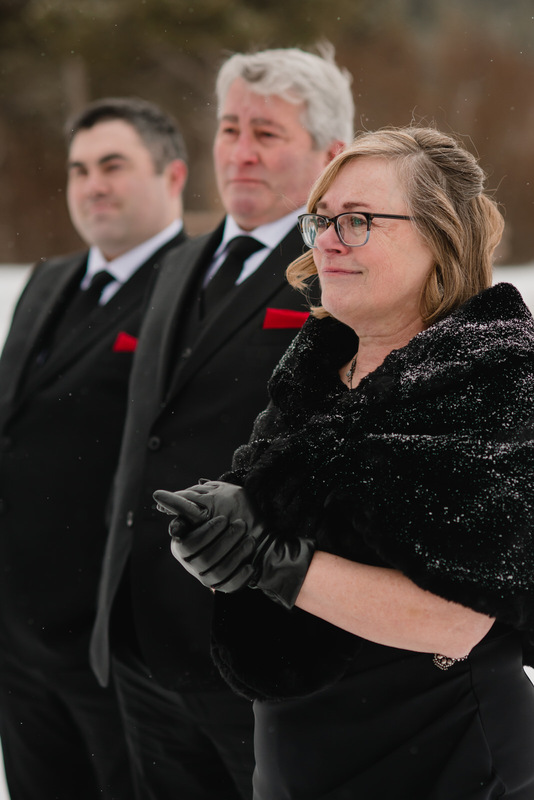 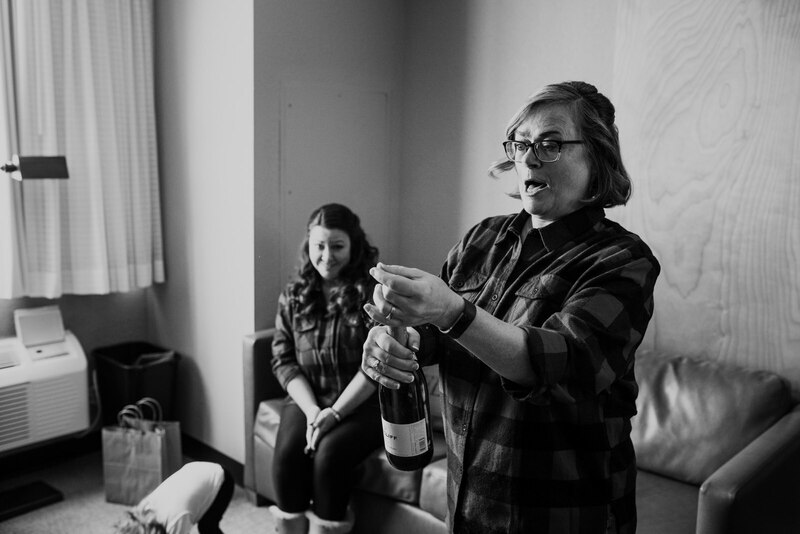 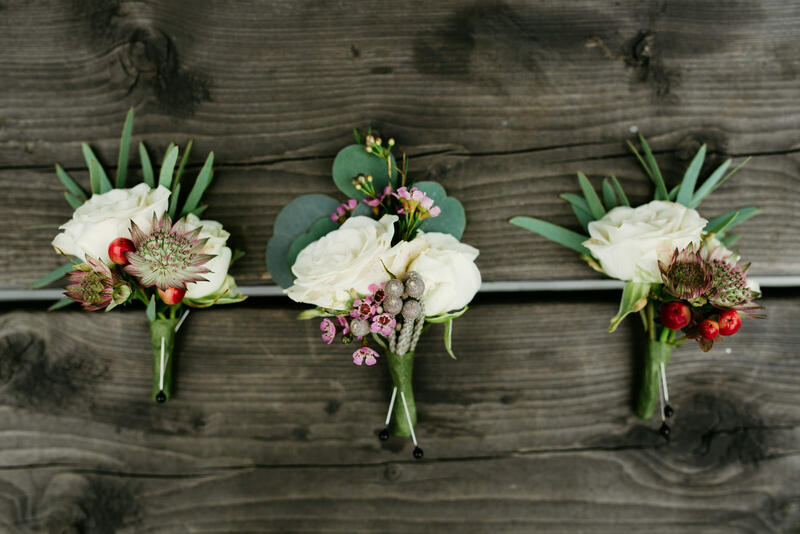 First, hire Jyl Deering, our wedding planner who steamrolled all issues and decisions on the path to a smooth and flawless wedding. 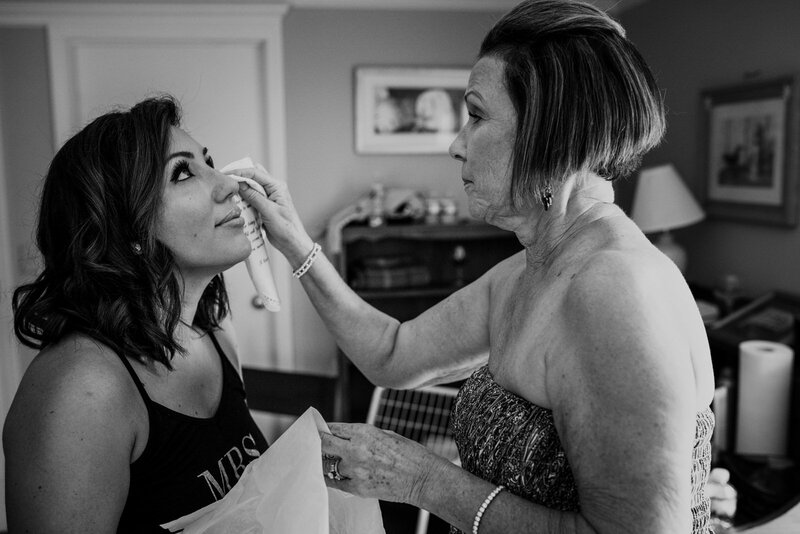 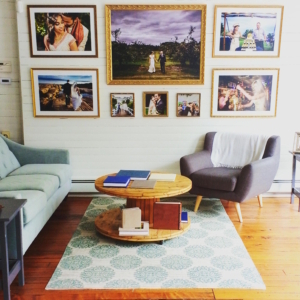 Second, hire Angie and take a sigh of relief knowing you’re in good hands and will have beautiful pictures to commemorate your wedding. 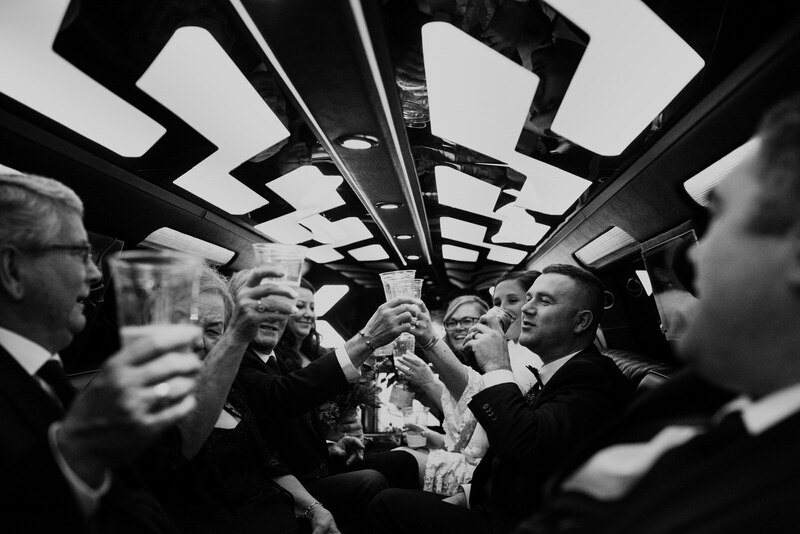 Third, sit back and enjoy your day, and don’t let the little details ruin your experience. 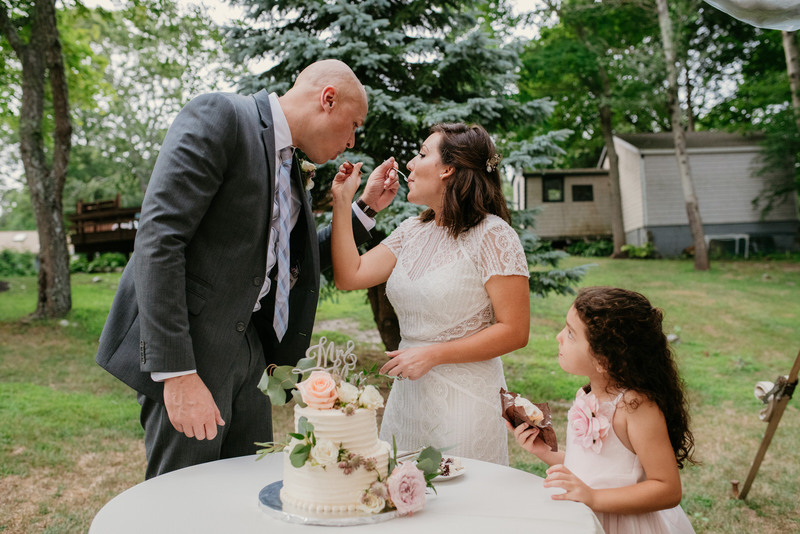 Only you two know how everything was supposed to be planned, and your guests will only be looking to you to know if everything is ok. 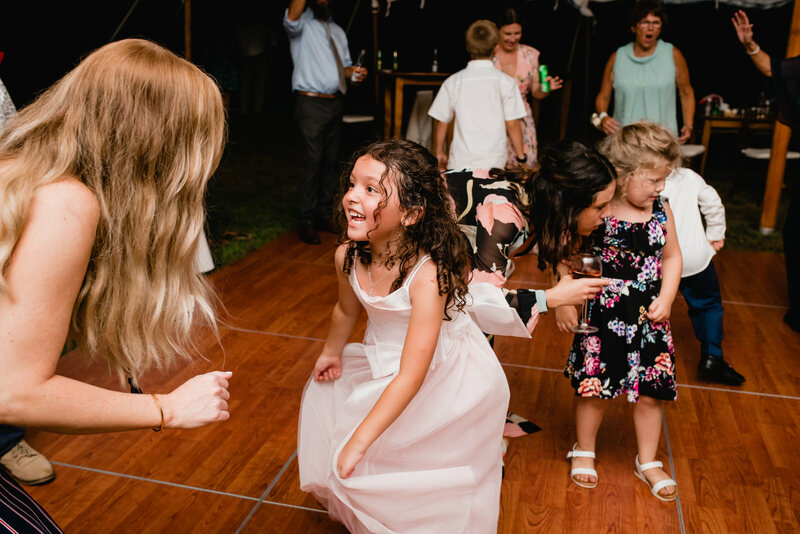 If you’re having fun, they’ll be having fun. 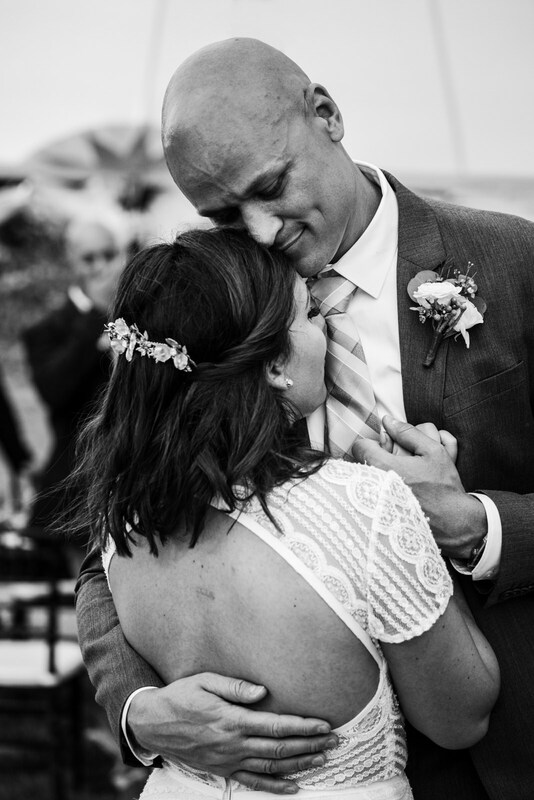 This is a special and intimate moment that ou two will share, so enjoy it to the fullest.